If you follow me on social media, you will probably already know that I am embarking on my second solo trip to Mexico’s Yucatan Peninsula and I am leaving tomorrow morning! I previously visited the Yucatan only six months ago in May of 2015 for my first solo trip ever. It’s difficult to let these types of comments just roll off my back. I definitely find myself internalizing some of the fear behind these comments, which leads to me feeling a little nervous and to having doubts about my abilities to travel solo. I have to keep reminding myself that other people are projecting their own fears and insecurities onto me, but I have a choice whether or not to adopt their beliefs as my own. I also have to remind myself that the people making such comments about my travels, have either a) never traveled to Mexico or b) only get their information about a country’s safety from the mainstream media (which tends to sensationalize violent and rare incidents and then make sweeping generalizations that such incidents mean that the entire country too dangerous to travel to). If our only source of travel safety information is the mainstream media and the government travel advisories, we would probably never desire to leave the comfort of our houses. I also have to remind myself that what I am doing is not something that many people have the opportunity or desire to do. The fact that I am able to face my fears, break down the barriers and overcome my anxieties and the other challenges (ie. introversion) to traveling solo, is something that not many people do. And I think that’s pretty awesome that I am able to do those things. It’s a battle in my mind sometimes between the rational side of my brain and the emotional side. My rational side researches everything possible about my destination – reading countless travel blogs and forums and reaching out to fellow bloggers and asking for their advice. But my emotional side thinks about the worst case scenarios and the doubts. But I have to remember that I have traveled solo in Mexico once before and I know and believe that I am capable of doing it again. Even in knowing and believing this, I have still experienced some anxiety and worry about my upcoming travels, as I do any time I step outside of my comfort zone and into the unknown. I have to learn to accept that there are many unknowns and uncertainties and that I cannot be in control of everything, but remember that God is in control. I tend to over-plan everything in my life, so naturally, I have been spending all of my spare time lately researching and planning my travels in great detail. Of course, I also leave lots of room for relaxation and spontaneity and don’t plan everything down to the day. Researching everything about my trip in detail is one thing that I do before traveling that helps me to feel prepared because I have a lot of knowledge about my destination. In turn, feeling prepared helps to increase my confidence and lessen the anxiety that I may have. Since I’ve been to Mexico before (6 months ago), you might be asking yourself, why would I go back so soon? In short, I have completely fallen in love with Mexico as a country. From the vibrant culture, to the delicious variety of food, to the Spanish language, to the gorgeous natural beauty (jungles, cenotes), to the impressive and detailed ruins from the ancient Maya civilization, and the warmth, kindness and generosity of the local people. Mexico is such a vast country with a huge variety of landscapes and things to see, do and experience. During this trip, I want to focus on exploring some my favourite places in-depth while also getting off the beaten path to discover more favourites and local hidden gems. I am very excited to be going back to Mexico! I will be re-visiting three places that I went to during my last trip (Playa del Carmen, Tulum and Valladolid) as well as exploring three new places (Merida, the Puuc Route/Santa Elena and Campeche). As my departure date has been getting closer and closer, I have been experiencing a mixed bag of emotions, from feeling excited, fearless and empowered to anxious, worried and fearful. Some days, I experience a range of all these emotions. Even though I have traveled solo once before in Mexico, doesn’t mean I am immune to fear, anxiety and nervousness. It’s something that I have to deal with and overcome every time I travel. As an introvert, traveling solo is definitely stepping wayyy outside of my comfort zone. Challenging myself in unknown territory is definitely difficult for me at times and it takes effort. I was so proud of myself for taking the leap and traveling solo for my first time to Mexico this past spring. Approaching complete strangers, meeting new people and making friends was surprisingly easier than I was expecting it to be and I met so many wonderful and interesting people – both fellow travelers and locals alike. I learned a lot about myself, the Mexican culture and history, the Spanish language and other people, and gained so many valuable skills when I traveled in Mexico the first time. I became more independent, gained confidence in my abilities, became resourceful, learned how to handle a variety of challenging situations (learning Spanish on the go and dealing with the language barrier, navigating the public transport system, and finding my way around completely foreign places) and ultimately, felt so empowered that I had the opportunity to do something (travel solo) and experience such incredible beauty in our world, that many people do not have the opportunity to experience. 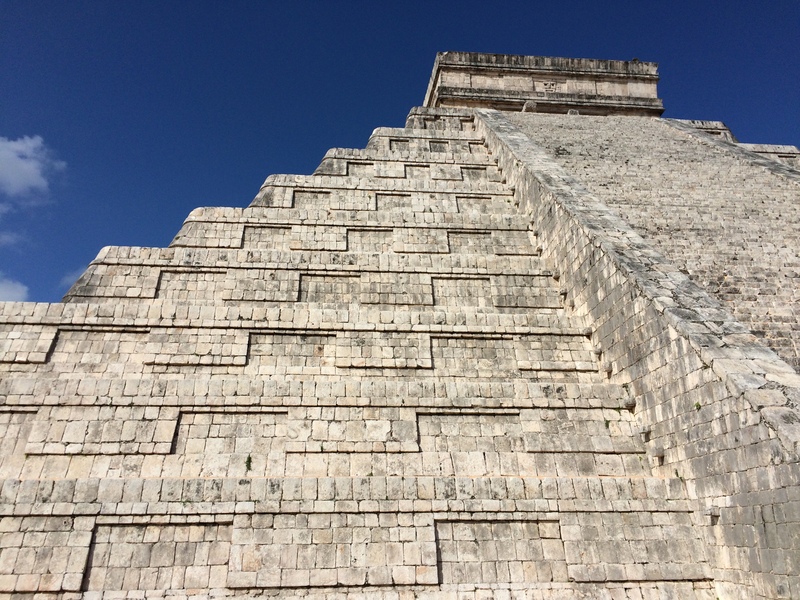 The purpose of my current trip is to hopefully discover more about myself, gain some clarity of my purpose and direction in life, travel deeper and explore more of Mexico (the colonial cities and towns, Mayan villages, cenotes and Mayan ruins), try new foods, and meet some amazing people who will maybe become lifelong friends. November 12-15 – Tulum, Mexico. I will not be writing any blog posts during this trip, but I will be writing comprehensive posts about the places I visited along with my stories and experiences after I return home. 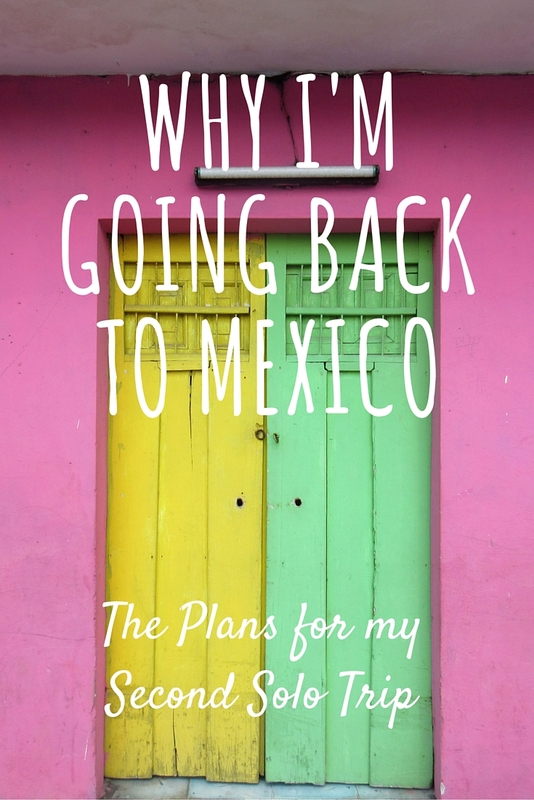 If you are interested in following my journey in Mexico – the lessons I learn along the way, the challenges I face, the amazing natural beauty, the people I meet and the memorable experiences that I have – you can do so in a number of ways! I will try my best to post photos daily on Instagram, summaries and photos from my day on Facebook, and random snippets of information, observations and thoughts along my travels on Twitter. I’ll be posting slightly different stuff on each platform, so you’ll get the full story if you follow me on all three! I am so looking forward to meeting new friends, learning more about the Mexican culture, Mayan history and Spanish language, sampling some new foods, while exploring and experiencing the natural and ancient beauty of this wonderful and diverse country! Tulum, Mexico is a small, laid-back Mexican town with a slow-paced atmosphere located in the Mayan Riviera along the Gulf of Mexico, approximately two hours south of Cancun. 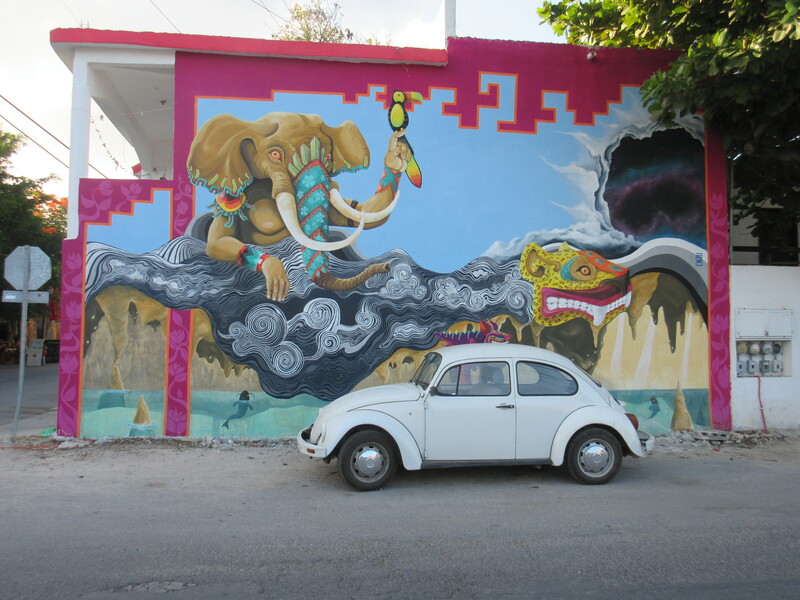 The town of Tulum is a great place to stay to get a better feel for the local Mexican culture. 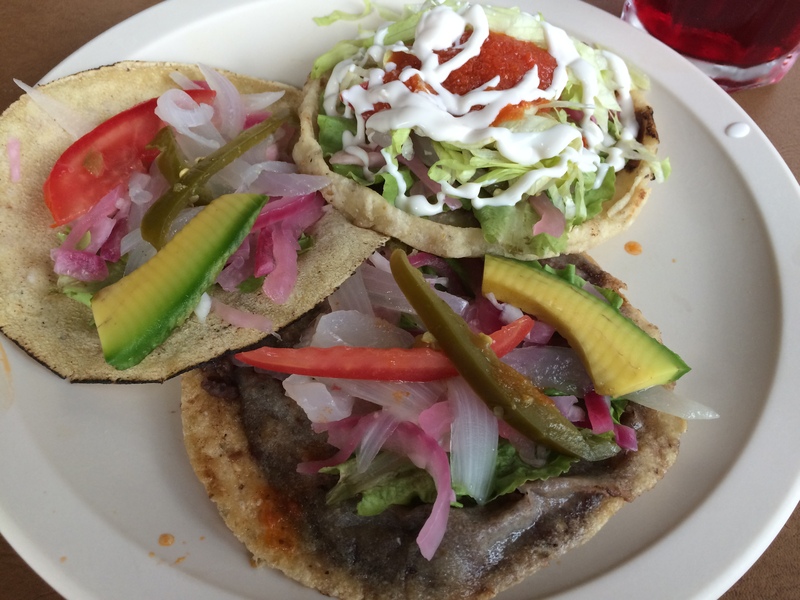 There are also more authentic restaurants to choose from that serve traditional and cheap Mexican food. The town is becoming more touristy but is nowhere near the level of tourism that you will see in Playa del Carmen and Cancun. There are not too many crowds in Tulum, which I loved. 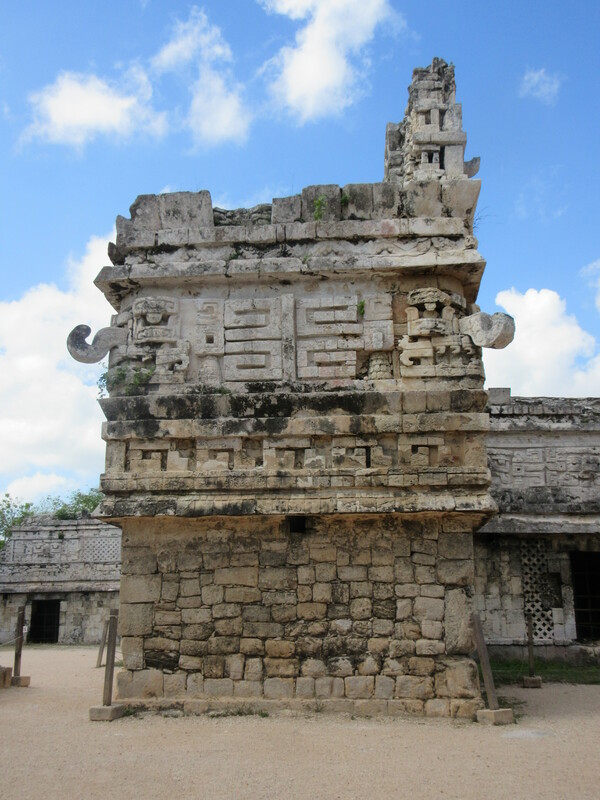 Tulum is the perfect place to relax and learn about the Mayan culture and history. The town is close to the gorgeous beach which can be reached via local colectivo shuttle van or taxi (5-10 minutes) or bicycle (25 minutes). 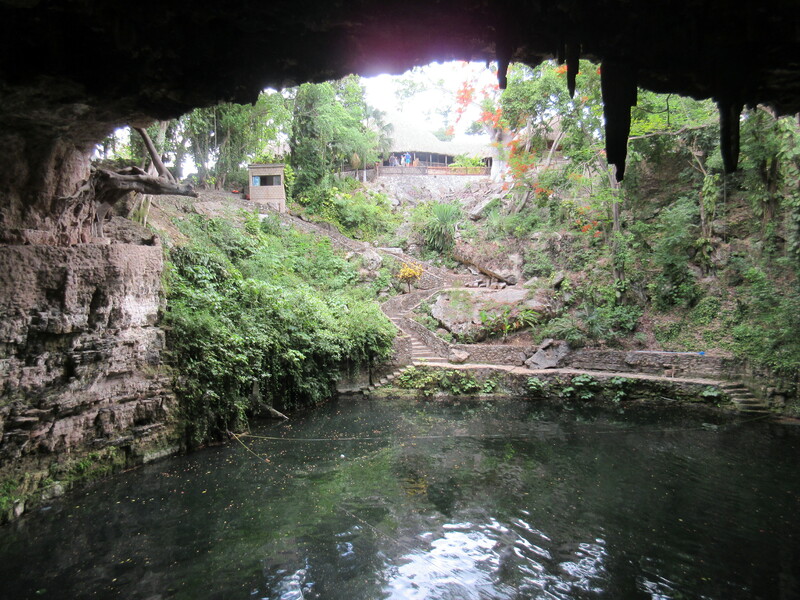 The are an abundance of unique and beautiful cenotes surrounding the town. 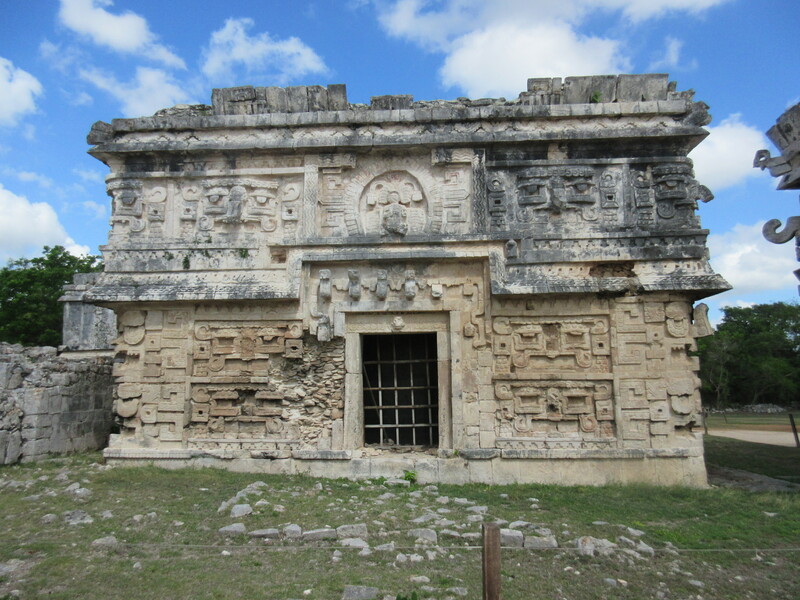 The ruins of Tulum, Coba and Muyil are also nearby, as is the Sian Ka’an Biosphere. I stayed at Mama’s Home for four nights during my first solo travels in Mexico. It was an amazing hostel! 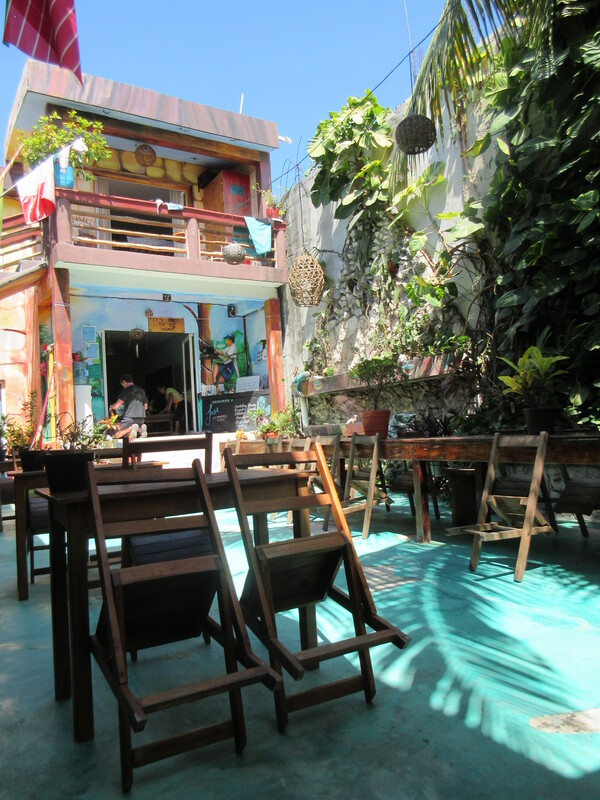 Mama’s Home is a hostel in a quiet local neighbourhood of Tulum, with a relaxing and laid-back yet social atmosphere. It is centrally located and is within short walking distance to local restaurants, shopping, pharmacies, grocery stores, and banks. 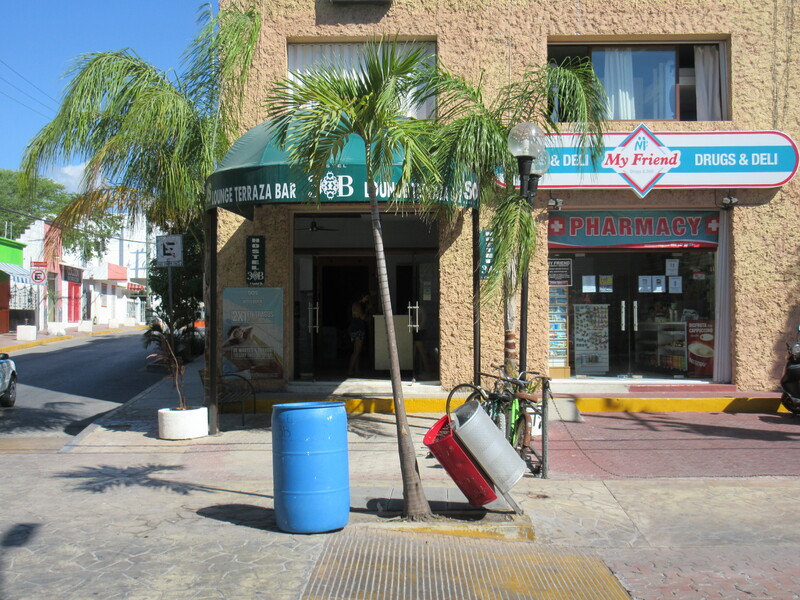 The ADO bus terminal is approximately a 10 minute walk away, on the main avenue going through Tulum. The hostel features a central outdoor courtyard surrounded by colourful and brightly painted walls with a variety of designs and patterns that is the perfect place for socializing with and meeting fellow travelers and also just relaxing in one of the hammocks along the side of the courtyard, unique decor, a communal kitchen and refrigerator for guests, super fast and free Wi-Fi, two guest computers, a book exchange, luggage storage, free breakfast (the breakfasts are elaborate, delicious and different every morning), super friendly and helpful staff with great tips and recommendations, a 20 peso discount on daily bike rentals from a local place in town, free maps of Tulum, and hot showers. Jose, the owner of the hostel, organizes a variety of fun social activities and events that take place in the communal courtyard, as way for travelers to get to know each other, make friends and have fun. When I stayed there, there was a pina colada night and movie night. I participated in both and ended up meeting some great friends! There are also two adorable kittens that live at the hostel. They love to cuddle and play with you. Mama’s Home offers a variety of rooms to choose from. There are spacious and air conditioned private rooms along with an air conditioned 6 bed mixed gender dormitory and a 10 bed open air mixed gender dormitory (with no air conditioning). The dorms have individual lockers to keep your belongings safe. I have personal experience staying at this hostel (you can read my detailed review by clicking on this link) and can pretty much guarantee that you will not regret staying here! 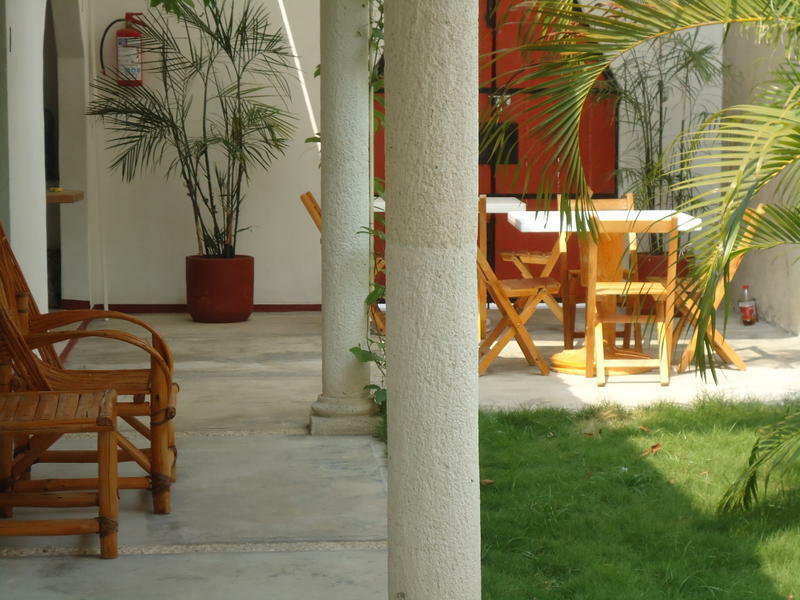 Hostel Akadia Cultural is a relaxed hostel with a chill atmosphere, located in the town of Tulum. The hostel features a large courtyard with a swimming pool. Other amenities include Wi-Fi, TV, lockers, equipped kitchen, music, bar, cooking classes, and an on-site restaurant. Hostel Akadia offers private rooms, dorm rooms, camping and hammocks. 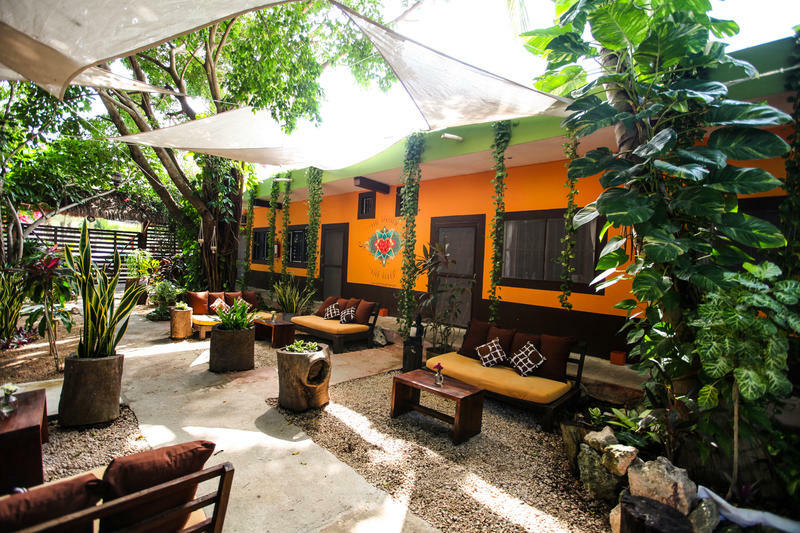 The Chill Inn Hostel is a newer hostel with a relaxed atmosphere located in a quiet and safe neighbourhood in the town of Tulum, a 5 minute walk from the main avenue where you will find banks, restaurants, groceries, tour agencies and transportation. 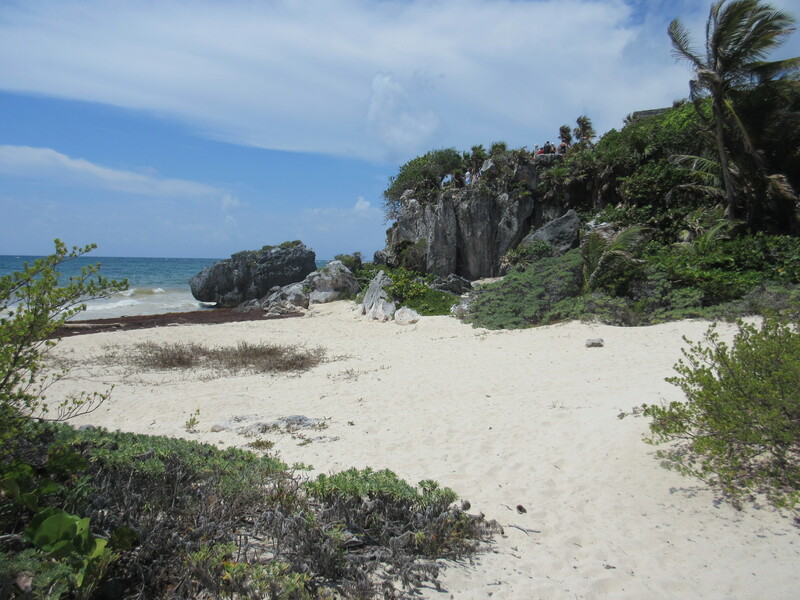 It is located within a 20 minute bike ride to the beach and Tulum ruins or a 5 minute taxi ride. The hostel features a shared kitchen and common areas which are great for relaxing or socializing, free Wi-Fi and included breakfast. 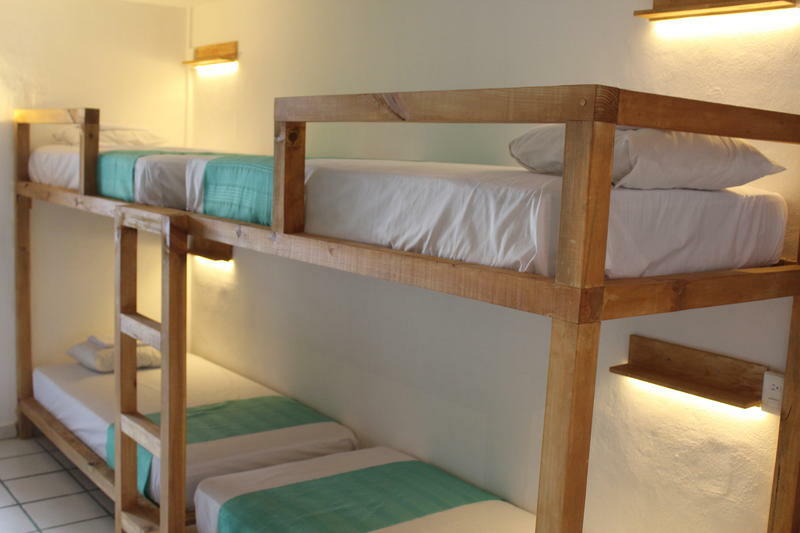 The hostel offers four dorms with the choice of 4, 8 or 10 beds, all of them equipped with a full bathroom and shower. Each bed has an electrical outlet, comfortable mattress, reading light, fan, and security box, as well as fitted curtains so you can have some privacy. 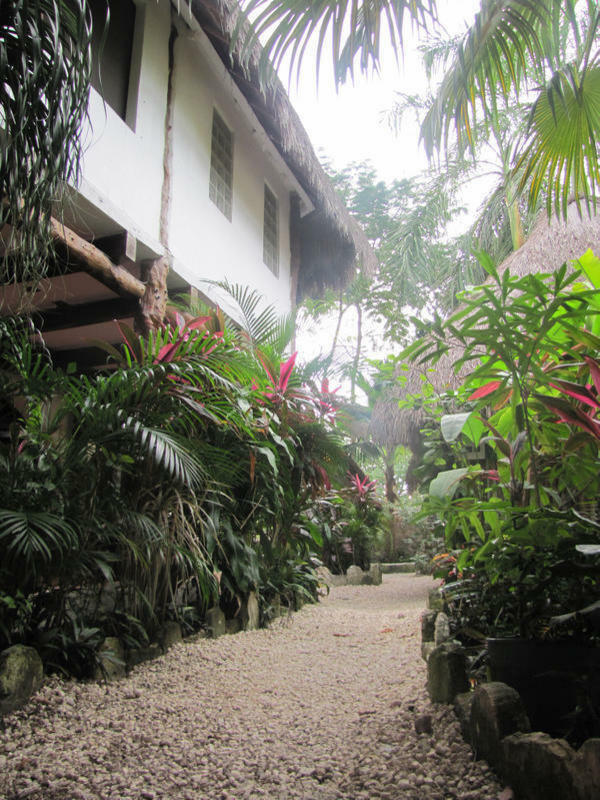 El Jardin de Frida is an eco-cultural hostel built around a beautiful garden, located in a calm and quiet neighbourhood of Tulum. They use solar panels to generate 80% of their electricity. 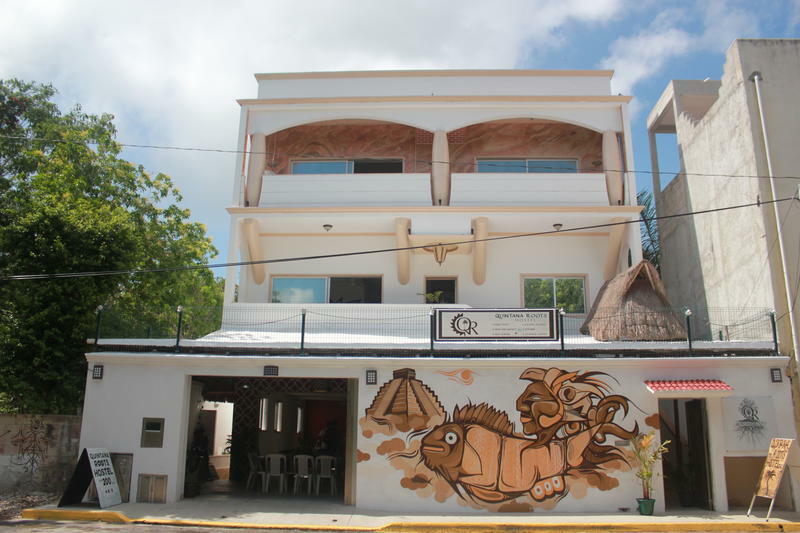 The hostel is centrally located on the main avenue in the town of Tulum, close (about a 10 minute walk) to the bus terminal, restaurants, attractions, banks and supermarkets. 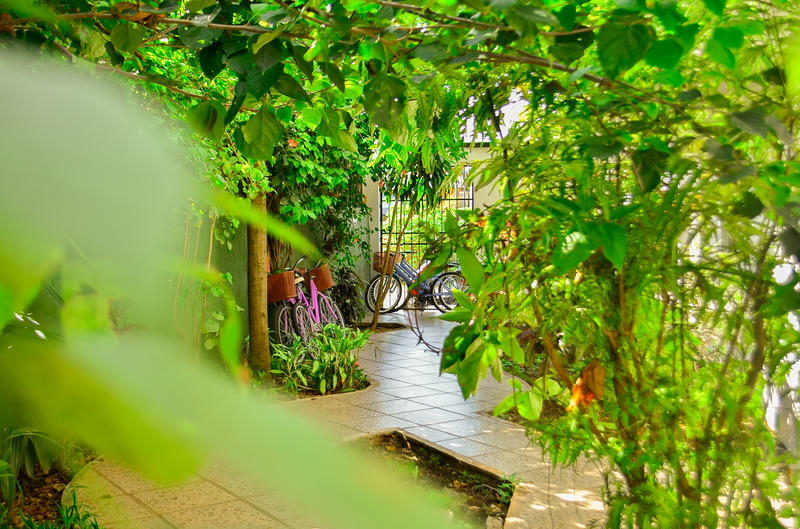 The hostel features a large, beautiful and tranquil garden where you can find hammocks to relax, mango, banana, and avocado trees and be surrounded by nature. The hostel offers daily cleaning, hot water, linen included, luggage storage, tourist information, a communal kitchen, bar, free continental breakfast, free Wi-Fi, lockers, and a library. 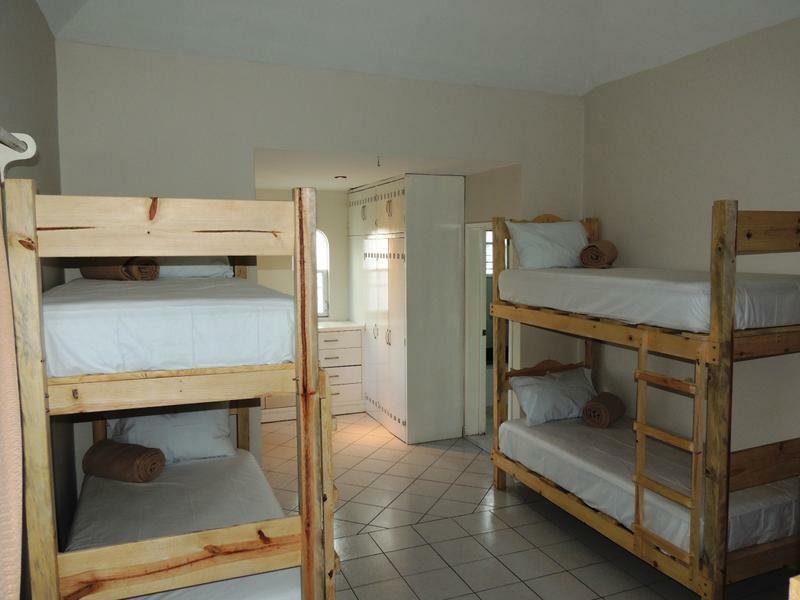 There are both private rooms as well as a 7 bed mixed dormitory (shared). All of the rooms are spacious and clean and have fans. 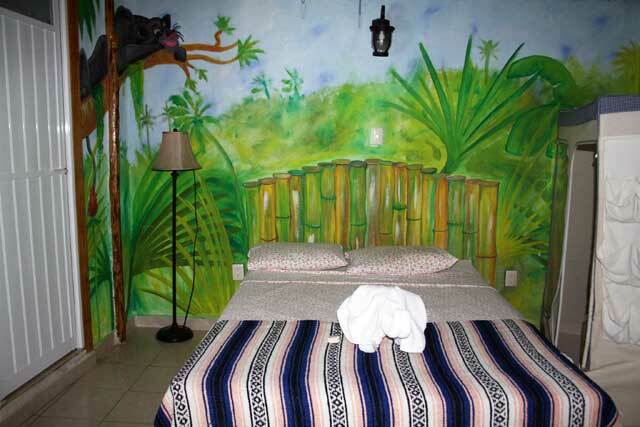 The private rooms have private bathrooms and a small terrace facing the jungle. The dorms have a full bathroom ensuite and single beds (not bunk beds). Hostel Sheck is a laid back hostel with a beautiful lush garden to relax, socialize and meet new people. 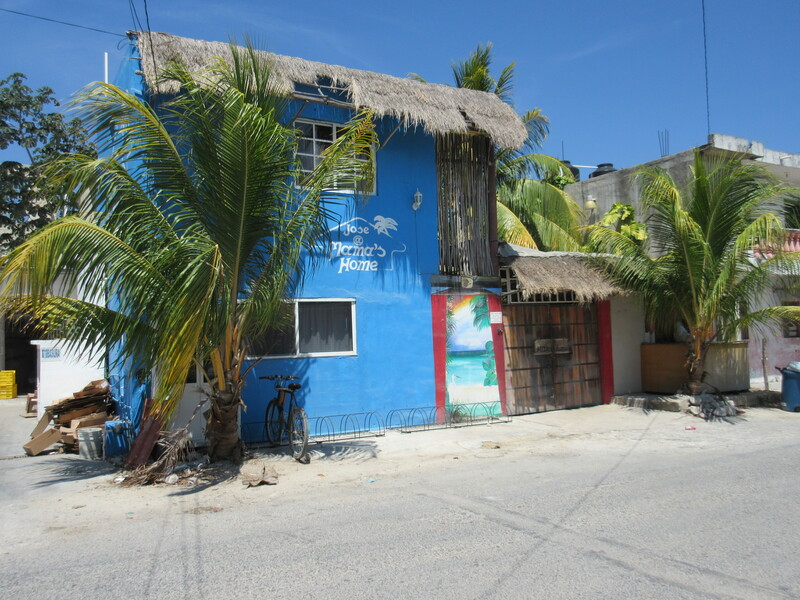 The hostel is located in the town of Tulum, close to banks, supermarkets, the ADO bus terminal, restaurants and attractions. The hostel features a budget-friendly bar, fully equipped industrial kitchen (with blender, juice squeezer, variety of utensils, industrial stoves, refrigerator, microwave, toaster oven), hammocks, tour and travel recommendations from the staff, free hot breakfast, free Wi-Fi, free purified drinking water, free Tulum maps, hot showers, individual lockers, bed linen included, towel rental, discount on bike rental, table games, book exchange, and more. 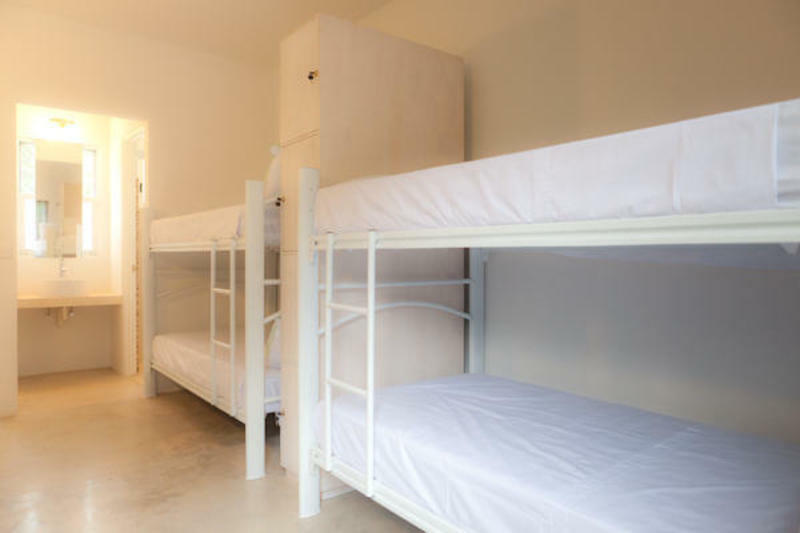 The hostel offers a variety of rooms including: 12 bed mixed dorm, 6 person mixed dorm, 4 person mixed dorm, and private rooms with shared as well as private bathrooms. The dorms have individual lockers, a full bathroom, and ceiling fan. 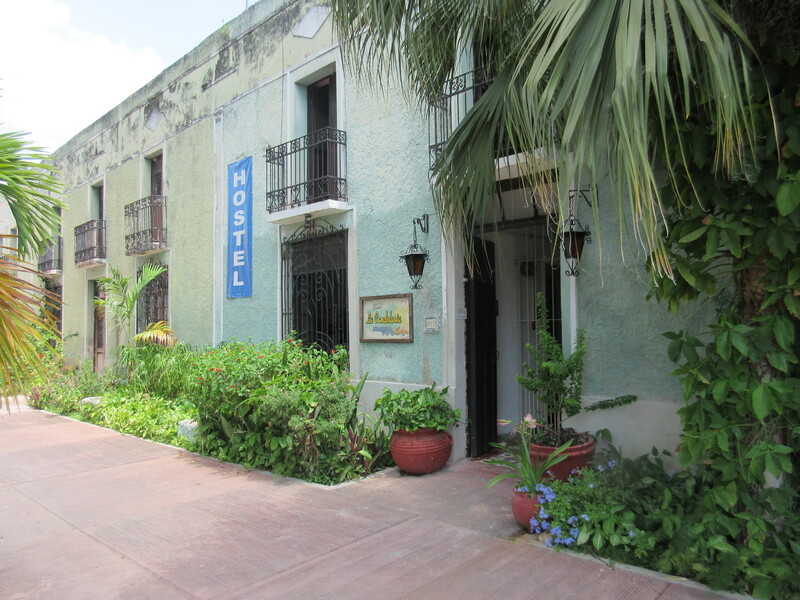 Hostal Tulum Naa is a clean and comfortable hostel centrally located in the town of Tulum. 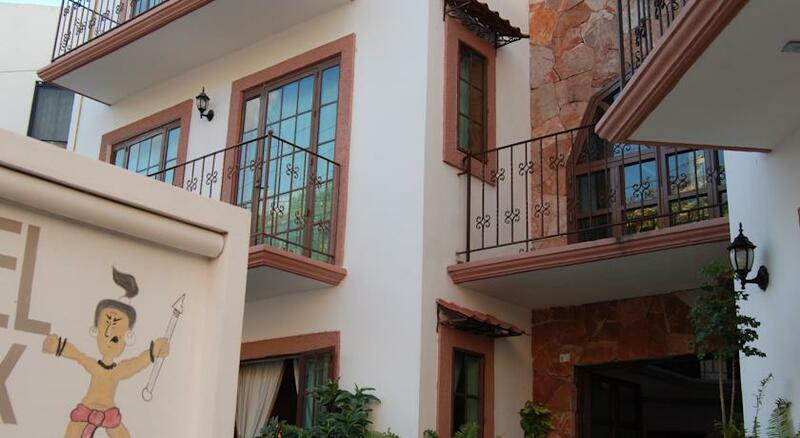 It is close to banks, restaurants, the ADO bus terminal, supermarkets, shopping and attractions. The hostel features 24 hour reception, free Wi-Fi internet access, board games, housekeeping, an outdoor terrace and a kitchen. The dorms include a ceiling fan, shared bathroom with hot water, lockers and reading lights. Linens and towels are included. 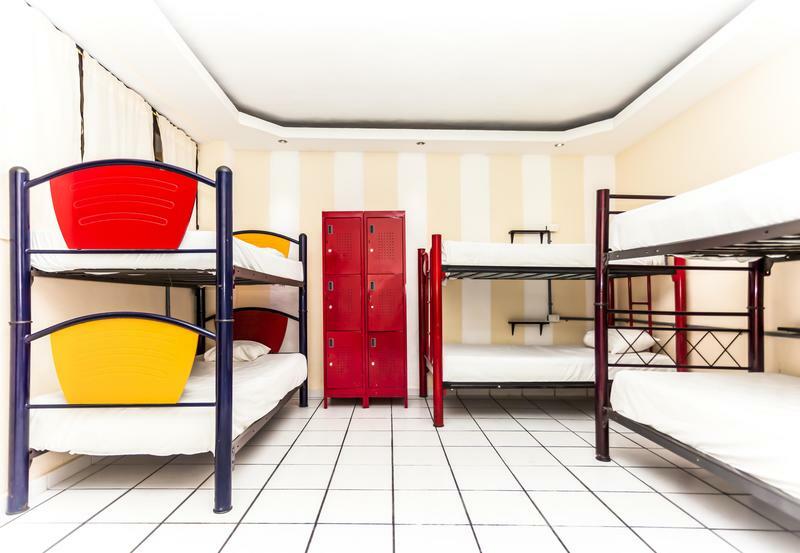 Hostal Chalupa is a newly built hostel that is comfortable and clean. 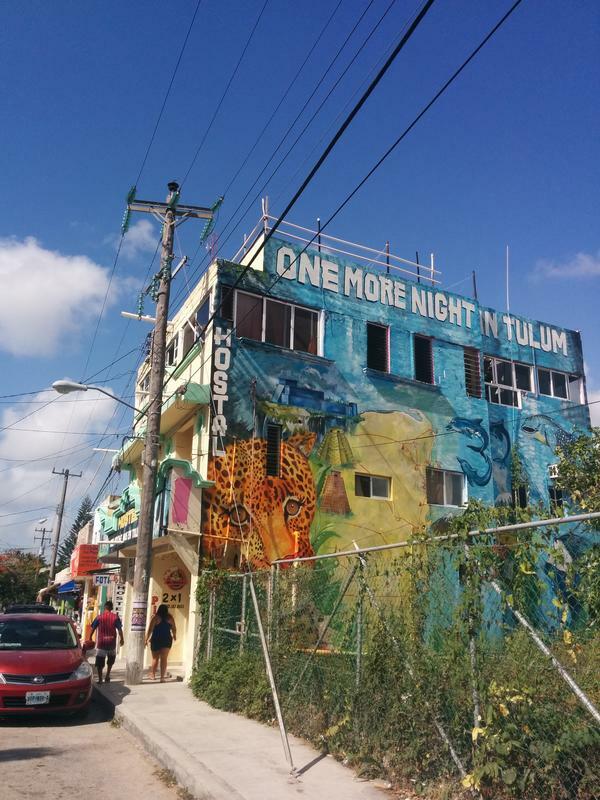 It is located at a busy highway intersection in the town of Tulum, within walking distance to the bus terminal, restaurants, banks, supermarkets, tour agencies, and shopping. 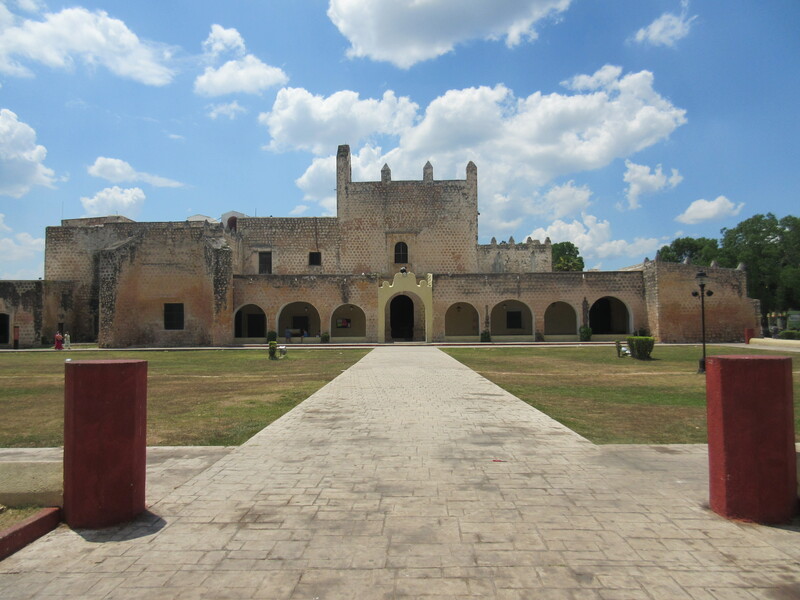 The beach, ruins and cenotes are a short taxi (5-10 minutes) or bike ride (20 minutes) away. 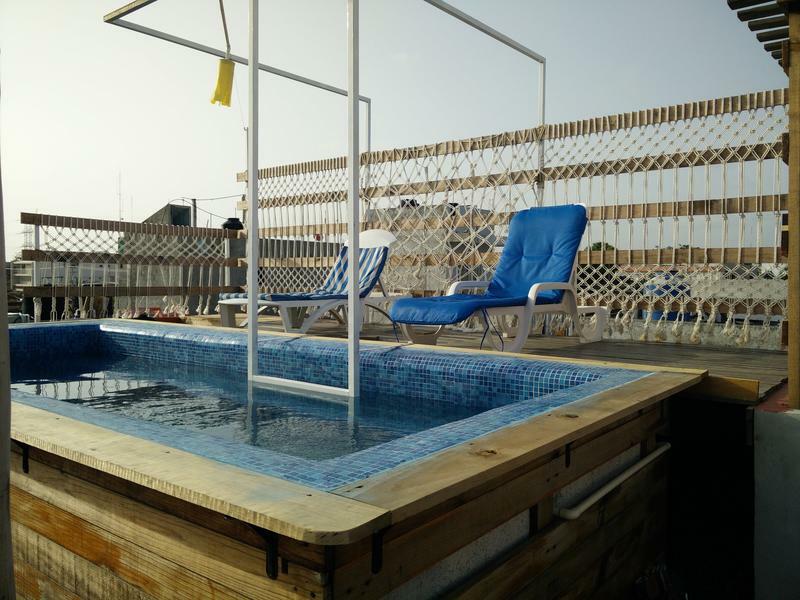 The hostel offers free Wi-Fi, air conditioning at night, a kitchen, relaxing lounge, outdoor swimming pool, housekeeping, linen included, luggage storage, lockers, and huge rooftop patio. Accommodations include a 4 bed dorm, two 5 bed dorms and two private ensuites. 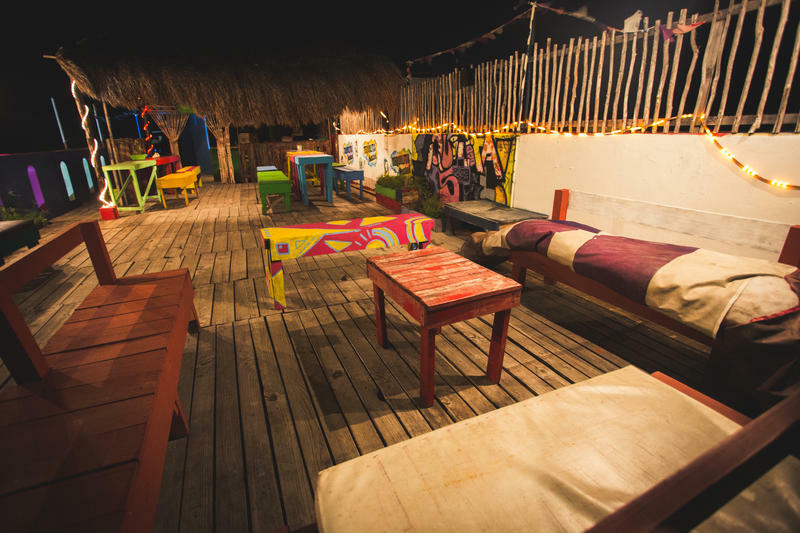 Una Noche Mas en Tulum is a clean and simple hostel and it is the cheapest accommodation in the town of Tulum – perfect for budget travelers. The hostel is located in a safe and quiet neighbourhood just minutes south of the main avenue in town. It is located two minutes from the ADO bus terminal, and close to many local restaurants, shops, supermarkets, tour agencies and attractions. The hostel offers free drinking water, 24 hour reception, free city maps and an outdoor terrace. 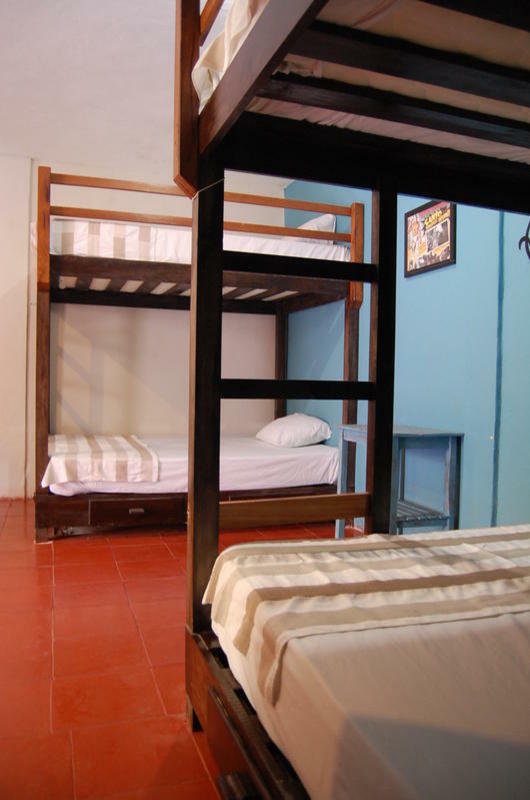 The hostel offers private rooms with a shared bathroom, a 4 bed female dorm, and a 6 bed male dorm. All rooms have fans, lockers, and free Wi-Fi. 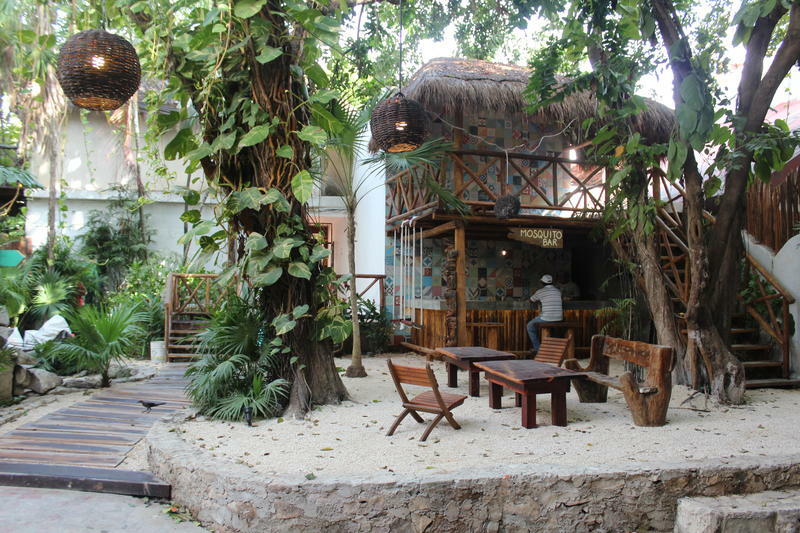 Quintana Roots Hostel is a new and comfortable hostel in Tulum. They are centrally located in the town of Tulum, and a short bike or taxi ride away from the beach, ruins and cenotes, as well as being within walking distance to local restaurants and the ADO bus terminal. 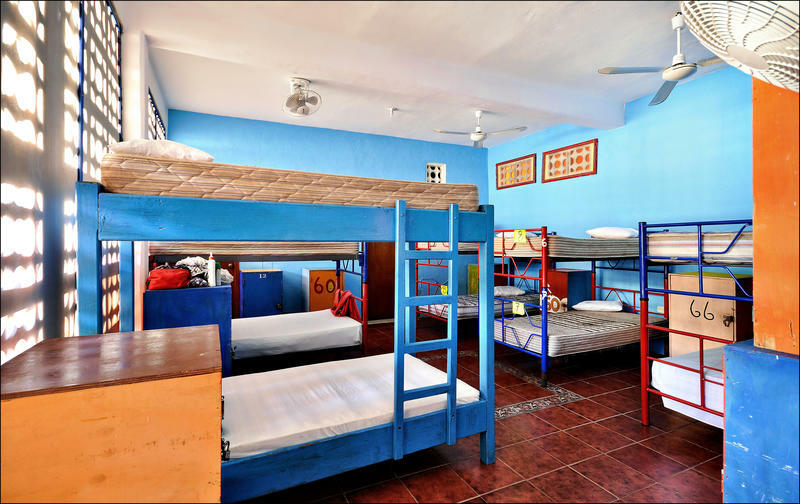 The hostel provides information about tours and Tulum, free Wi-Fi, free breakfast, drinking water, kitchen, hot water, lockers, daily cleaning, linens included, dive centre, lots of electrical outlets, fans, game room, rooftop area, flat screen television and lounge and hammock area. There are a variety of rooms to choose from, including mixed dormitories, female-only dormitories, and private rooms. The dorms range in size and can sleep from 6 to 12 people. This small, affordable and comfortable hotel has a pleasant and peaceful atmosphere and rooms surround a small courtyard garden. The hotel offers free parking and is centrally located in the town of Tulum, only a couple of blocks south of the main avenue in a quiet residential neighbourhood. Services include: rental cars, bike rentals, access to facilities at sister hotel on the beach (Playa Kin-Ha), 24 hour surveillance, airport transfers, discount at the restaurant at the beach location, diving, yoga classes, beach club, massages and laundry. The rooms feature hammocks, air conditioning or a fan, double, single or king sized beds, free Wi-Fi, and a private bathroom. 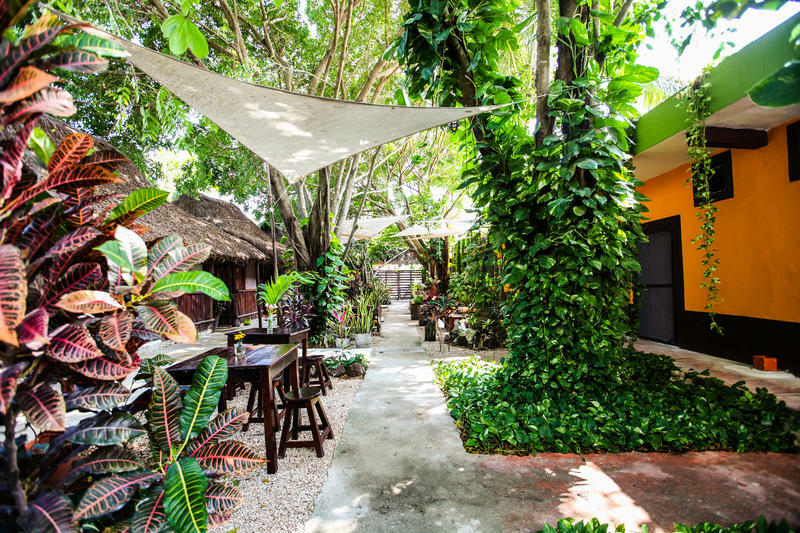 Secret Garden is an affordable and comfortable hotel that is hidden away in a quiet neighbourhood in the town of Tulum. 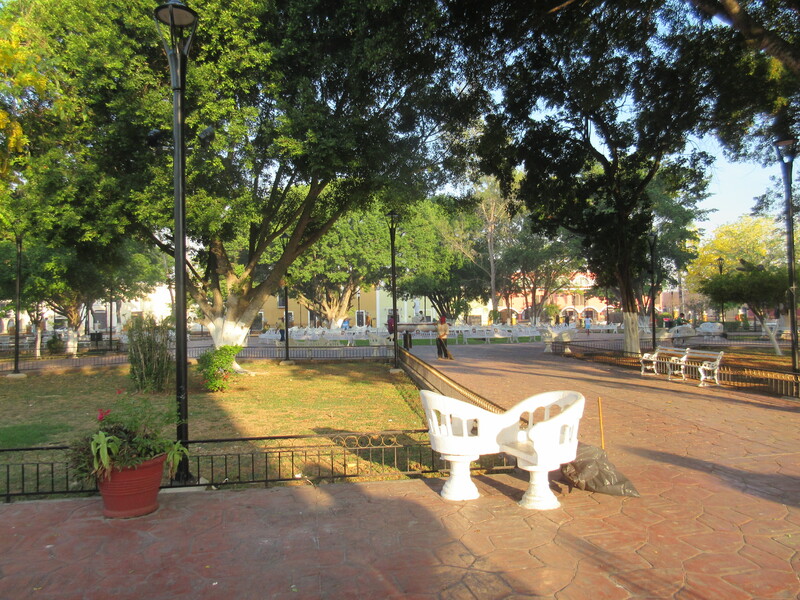 It is centrally located, only two blocks from the main avenue with shops, restaurants, transportation and more. The hotel provides a beautiful courtyard area with a tranquil atmosphere and surrounded by tropical gardens, tour desk and information, free local maps, hammocks and lounge area, free Wi-Fi, luggage storage, laundry service, hot water, beach towels, daily cleaning, coffee/tea/cookies/granola bars/fruit available 24 hours and a book exchange. Breakfast is not included. The rooms and cabanas feature modern, minimal and unique decor with a comfortable atmosphere, and are decorated with local and handmade ornaments. The rooms are clean and all have air conditioning and all feature private bathrooms. 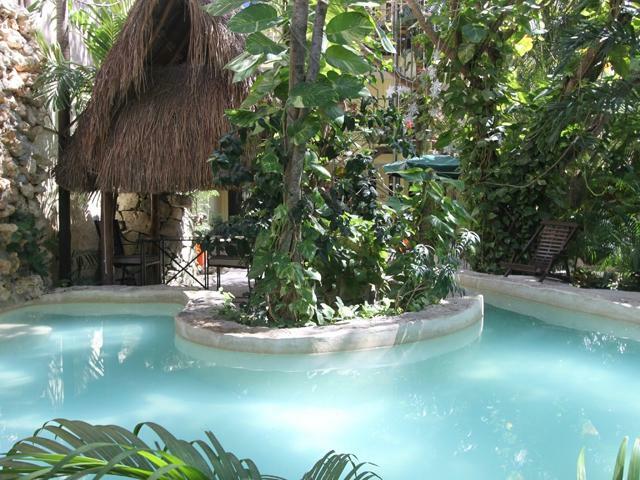 Las Tres Palmas Hotel is a comfortable budget hotel located in the town of Tulum. It is located within walking distance of restaurants, banks, the bus terminal, transportation, and groceries. The hotel offers bikes for rent, tour desk and information, laundry services, and airport transfers/shuttles for a fee. The hotel has 12 rooms available which include double, twin and family rooms. All rooms have a kitchenette, bedroom and balcony overlooking the surroundings, air conditioning and free Wi-Fi. 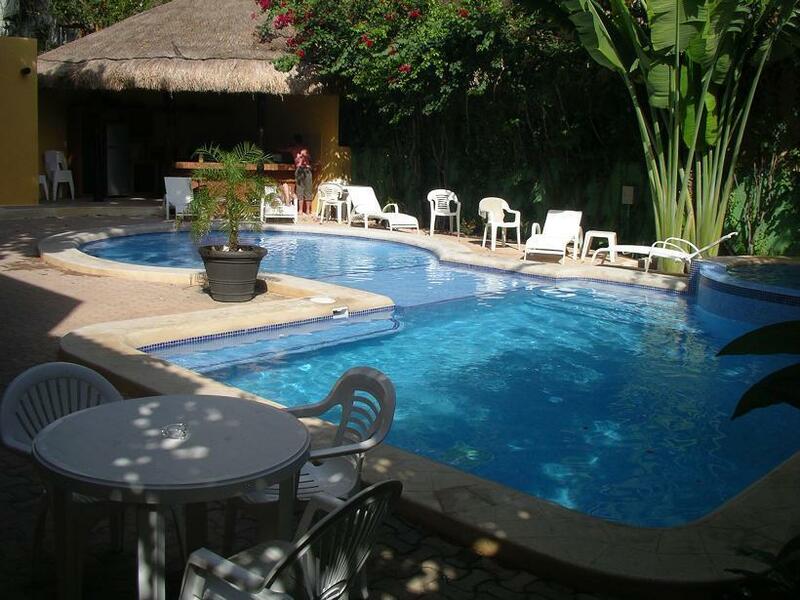 Hotel Palma Real is a budget hotel located on the highway between the towns of Tulum and Coba. 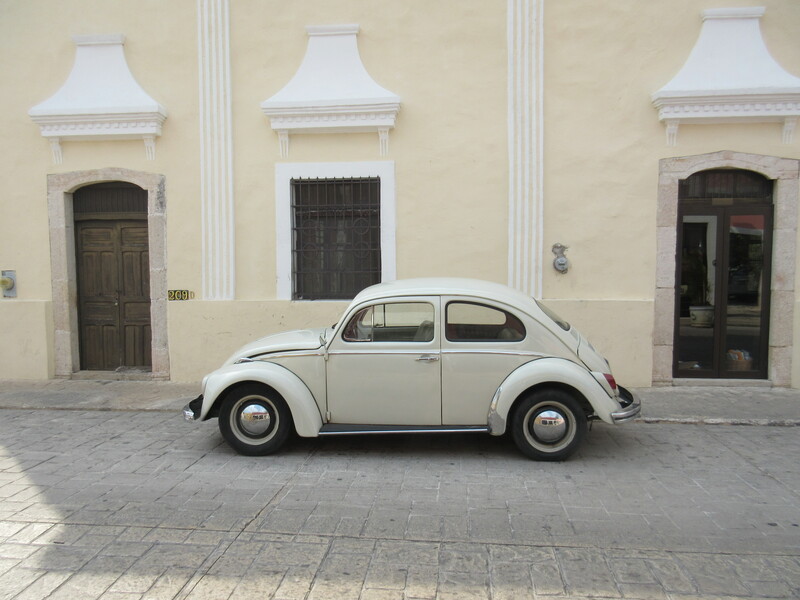 In order to get to Tulum town for restaurants, banks, groceries, and transportation, you will have to take a taxi. The hotel offers an outdoor swimming pool, bar, free Wi-Fi, included breakfast, free parking, on-site restaurant, 24 hour reception and luggage storage. 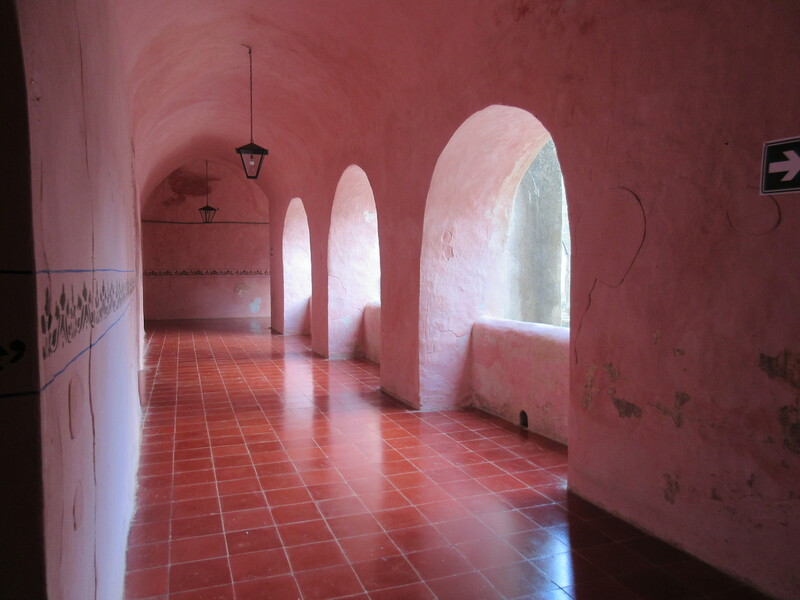 The rooms are air conditioned and have simple decor with tiled floors. The rooms feature cable television and private bathrooms. 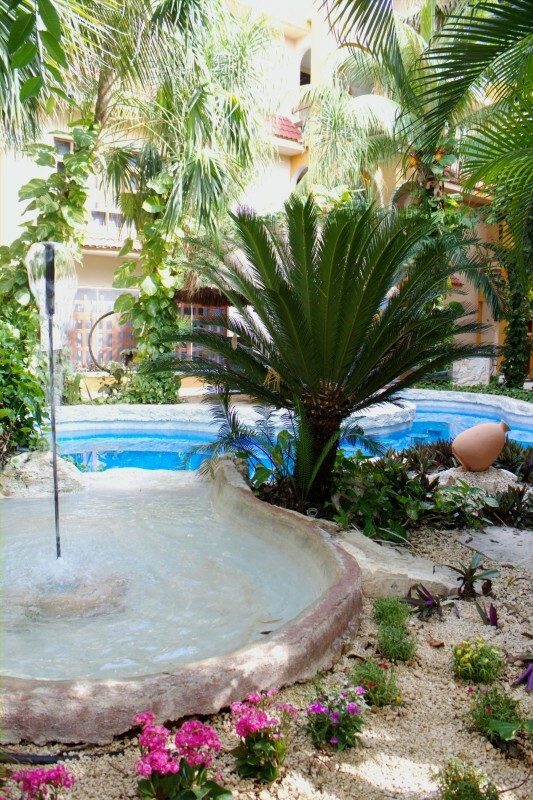 Hotel Nadet is a hotel located near Tulum town’s main avenue, close to restaurants, groceries, banks and transportation. The hotel provides free Wi-Fi, luggage storage and free parking. The hotel has 15 rooms which offer free Wi-Fi, cable television, kitchenettes with refrigerators and premium bedding. 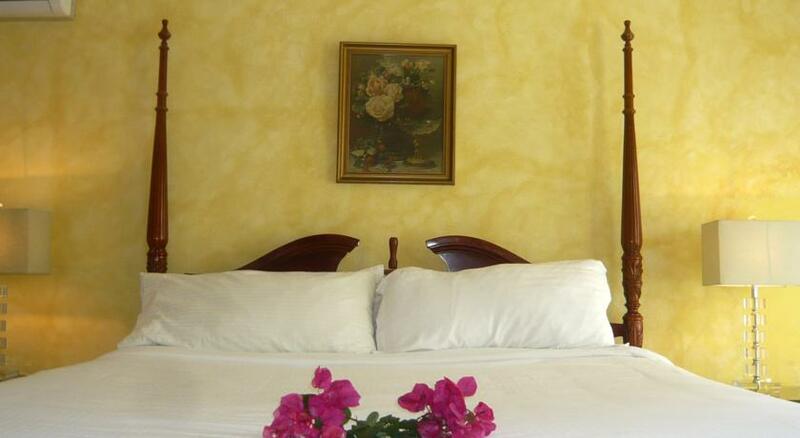 Hotel Villa Matisse is located in the town of Tulum, close to banks, restaurants, transportation and supermarkets. This hotel offers free bike rentals, free Wi-Fi, a garden and lounge area, tour desk and free parking. The rooms are simple and feature a full private bathroom with shower as well as bed linen and a fan. 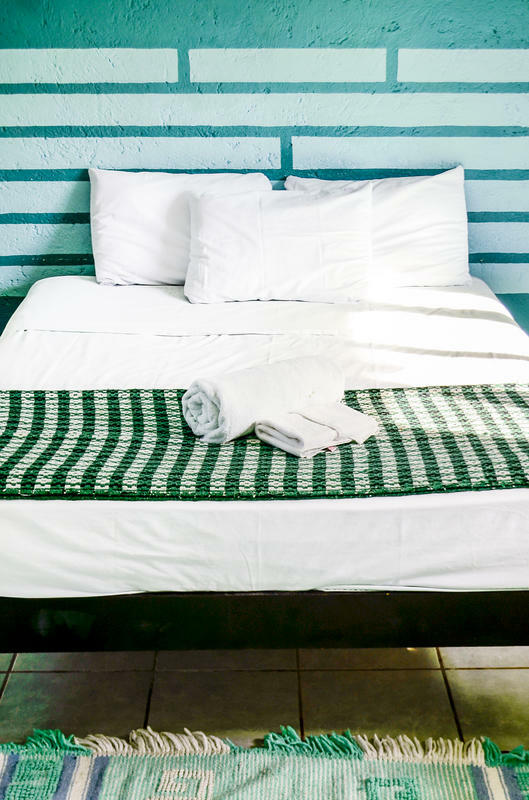 Mango Tulum is an affordable, modern, comfortable, simple and clean hotel located in the heart of Tulum, close to the ruins, cenotes and beach and within walking distance of banks, restaurants, transportation (15 minute walk to the ADO bus terminal) and groceries. It is a small and friendly family-run hotel located in a quiet and tranquil neighbourhood. The hotel provides free Wi-Fi internet, large garden and swimming pool, air conditioning in all rooms, hot water and free drinking water, free tea and coffee, free maps, fridges in the private rooms, parking and on-site security. 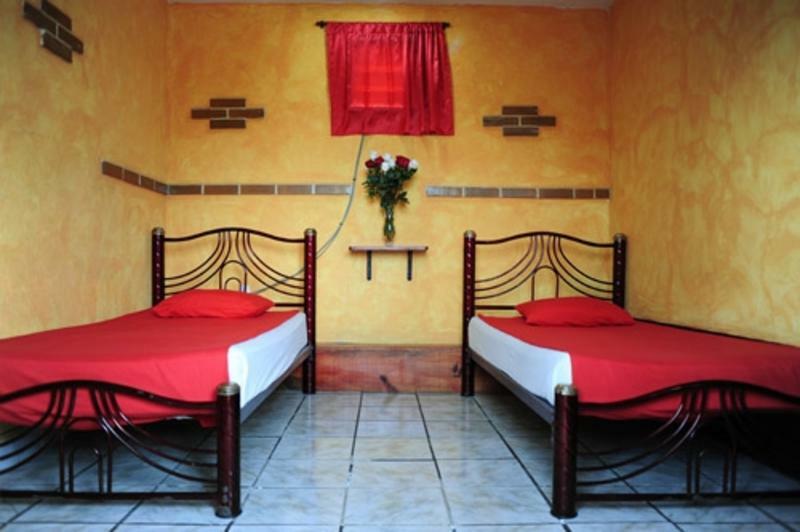 This hotel/hostel offers 4 bed shared dormitories and private rooms. The dorm is simple and has bunk beds, air conditioning, and a separate full bathroom ensuite with showers and toilets. There are large individual lockers, individual power outlets, and individual fans. The private rooms are spacious and modern and have ensuite washrooms and showers, air conditioning and internet. Pacha Tulum is located beside a supermarket and banks, and close to restaurants, transportation, and about a 5 minute drive to cenotes, the beach and the ruins of Tulum. 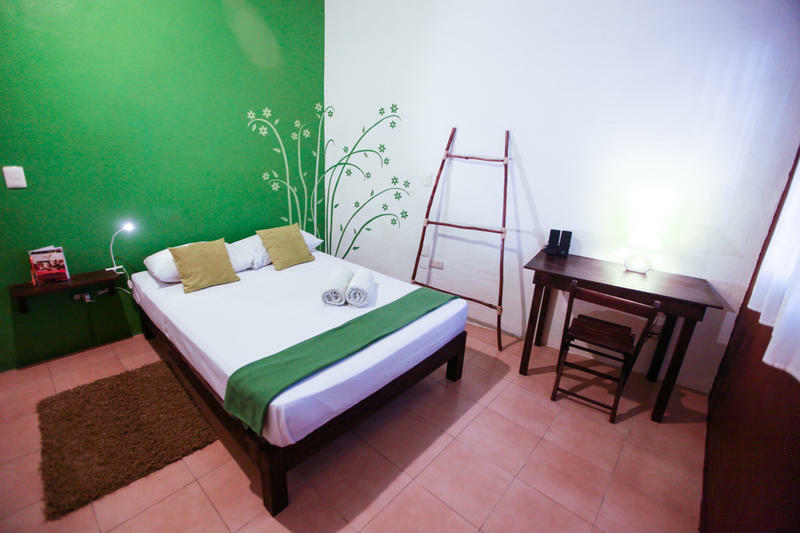 The rooms are comfortable and simple, offering basic decor with a desk, wardrobe, private bathroom and air conditioning. 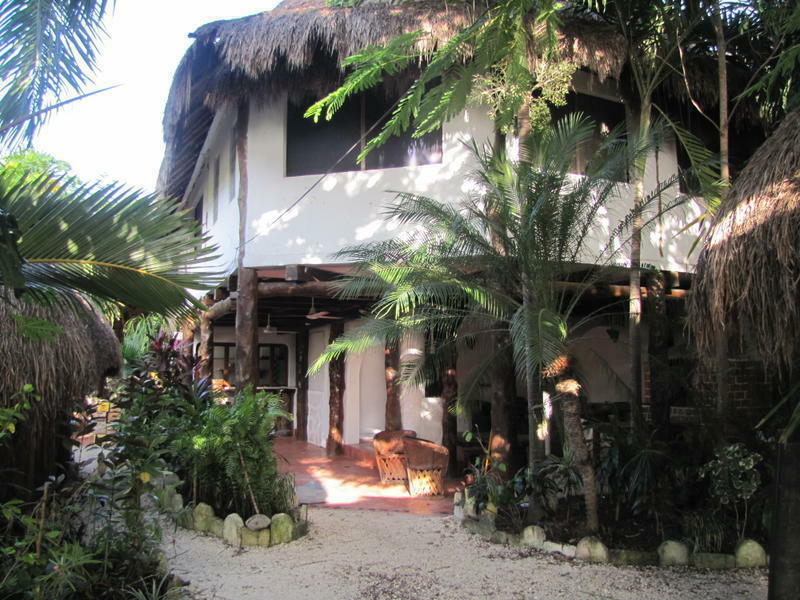 The Lobo Inn is ideally located near Tulum and it is only a 10 minute walk from the beach and 3 km from the Tulum Ruins. The inn offers a spacious garden and swimming pool with a relaxing atmosphere, full breakfast, friendly service, free Wi-Fi, bike rentals, purified drinking water, hot water, fully equipped kitchen, bed linen included, parking, hammocks, lockers for bags and personal belongings, book exchange, TV room with DVDs, luggage storage and a lounge area. They also offer a travel desk, taxi service, 24 hour reception and currency exchange. 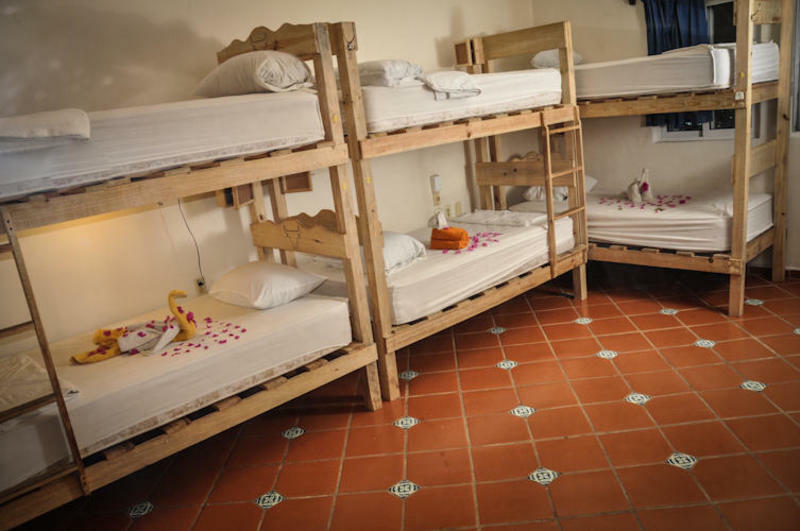 Lobo Inn has a variety of rooms to choose from including private rooms with double beds as well as a 14 bed mixed gender dormitory. MyTulum Cabanas are large cabins located on the gorgeous beaches of Tulum. 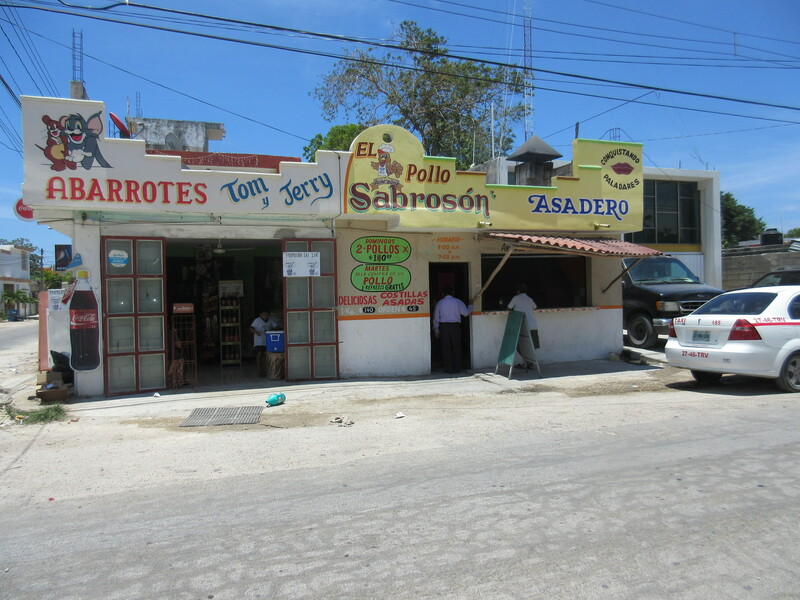 The town of Tulum, along with local restaurants, supermarkets, the ADO bus terminal and shopping is located 9 km away, and can easily be reached by taxi. The cabanas feature a tour desk, massage services for a fee, tropical decor, an on-site restaurant serving local and Mexican-style dishes, a bar, car rental, bike rental, laundry service, and airport shuttle (the last four items have a fee). 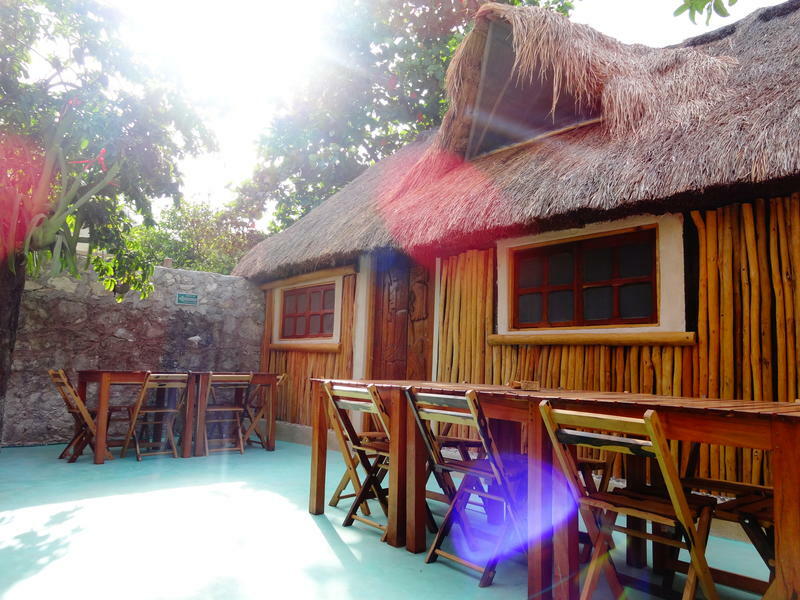 The bungalows offer rustic-style decor, free Wi-Fi, a fan, mosquito net, sofa and garden views. The bathrooms are private and are stocked with free toiletries. Ahau Tulum is a unique and eco-friendly accommodation located directly on the beach. It features free Wi-Fi, yoga lessons and massage services (for a fee), and an on-site restaurant. 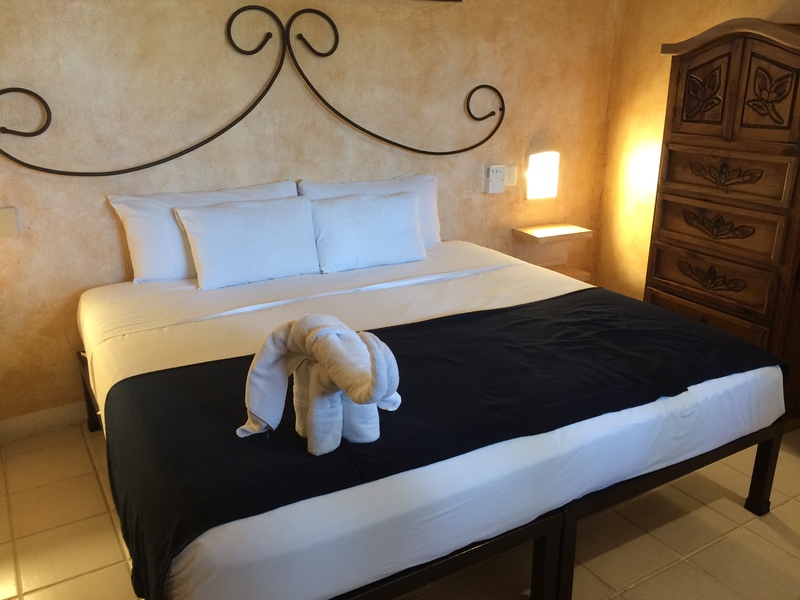 Ahau Tulum offers rooms for a variety of budgets. 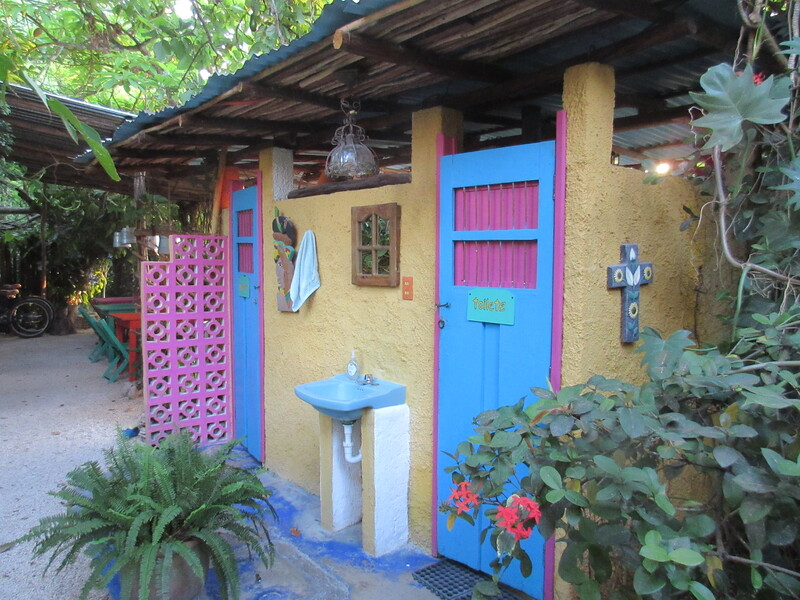 The guesthouse with shared bathrooms and “Bali Huts” are budget-friendly and rooms have mosquito nets and fans. 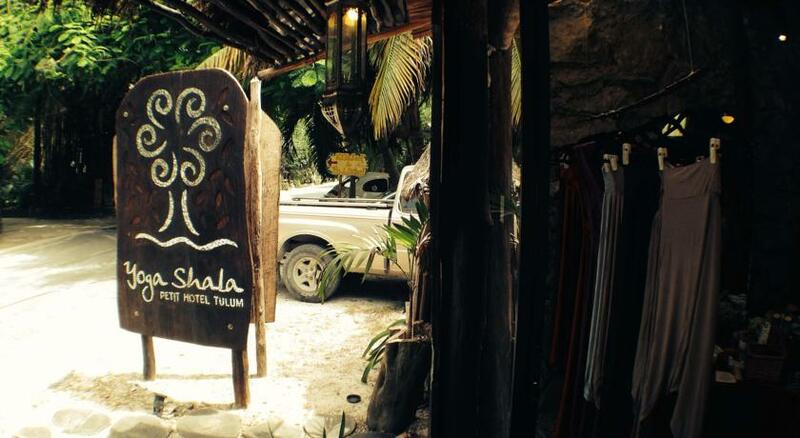 Yoga Shala “offers a comfortable space to stay, relax and practice yoga.” It is conveniently located between the Tulum Ruins and the Sian Ka’an Biosphere, and is only a 10 minute taxi ride from the town of Tulum where you will find restaurants, shopping and transportation. 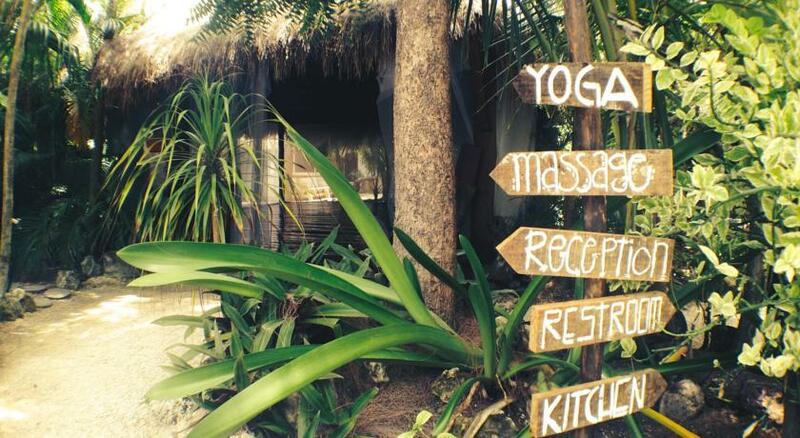 Yoga Shala is surrounded by lush jungle and is located only steps away from the white sand beaches of Tulum. The hotel offers a wide variety of yoga classes and styles. The hotel features massage services for a fee, tours, bike rentals, on-site restaurant, and boutique for shopping. Wi-Fi is available in public areas. You can choose from a couple of different rooms including private rooms with shared bathrooms or private bathrooms. All rooms are unique in their decorations and their size. There is no air conditioning. The website Workaway is a place where volunteers can connect with businesses and individuals in destinations around the world, offering free accommodation and sometimes food in exchange for your time and skills. You are often required to work for 4-5 hours a day, 5 days a week. There are a variety of volunteer placements available on the website and you can browse through them for free (but you must pay for a membership to contact the hosts). You could be working at a backpacker hostel, guesthouse, bed and breakfast, local hotel or small business or helping out a local individual or family with something. Volunteering in Tulum is a great way for budget travelers to save money on accommodation costs in order to travel slower and for longer periods of time. Airbnb is a website that allows locals in places around the world to rent out a private room in their home or their entire home/apartment to travelers for either a nightly, weekly or monthly fee. Airbnb rentals are a great alternative to hotels and they are often cheaper. You have the opportunity to live with a local resident who can provide you with advice and recommendations for things to see and do, transportation and where to eat in Tulum. You might even become great friends! Airbnb is great for those who enjoy the comforts of home and those who want more privacy than a hostel dorm room offers. If you sign up for Airbnb using this link, you will get a $25 USD credit for your first booking! 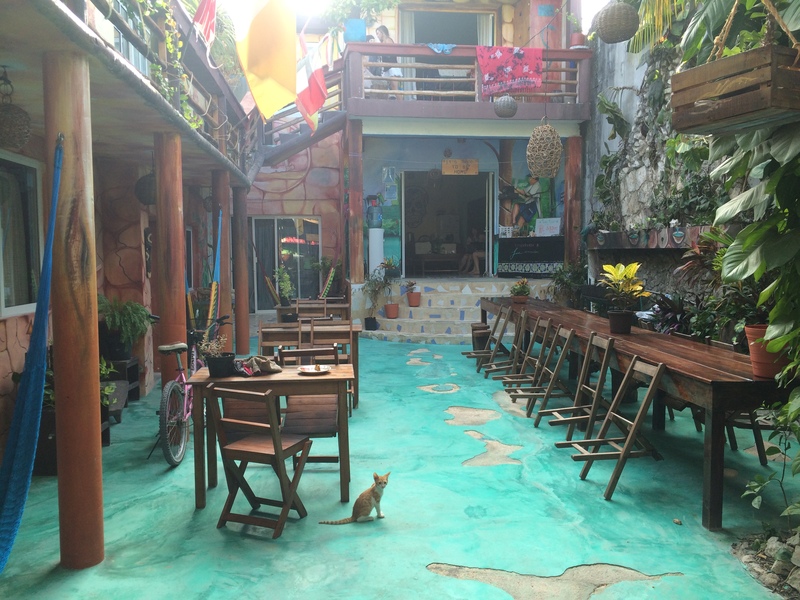 https://www.airbnb.ca/rooms/2122747?s=2ZE4ANl1 – Located in Tulum town, $34 CAD per night, 5 night minimum stay. 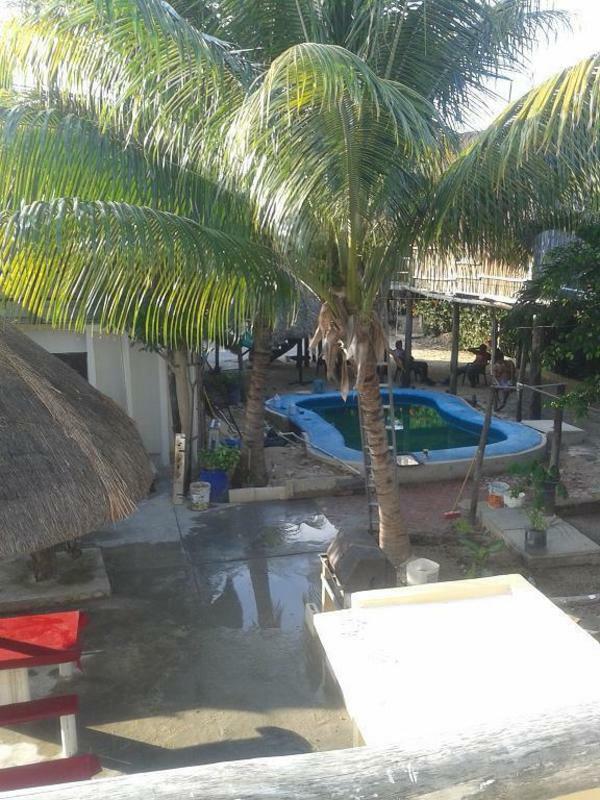 https://www.airbnb.ca/rooms/4502053?s=2ZE4ANl1 – Located in Tulum town, $21 CAD per night. 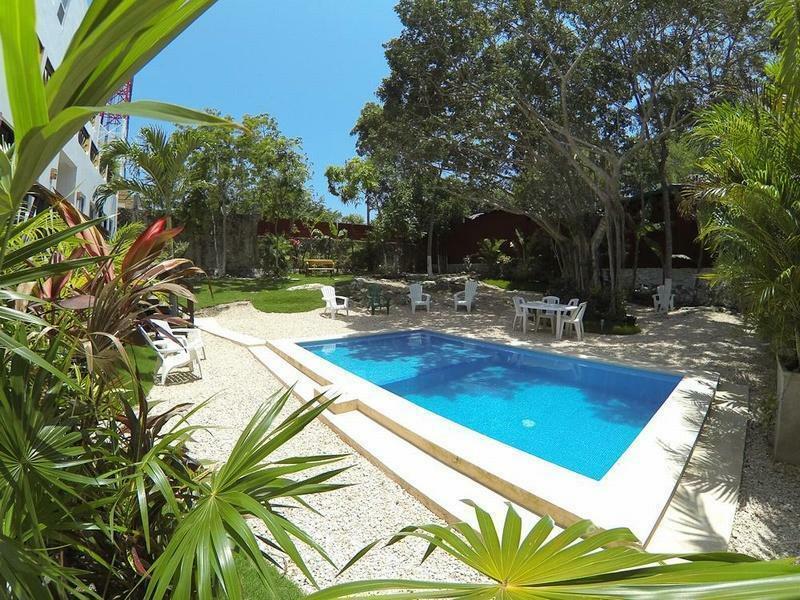 https://www.airbnb.ca/rooms/4305070?s=aorgy32m – Located in Tulum town, $41 CAD per night, 2 night minimum stay. 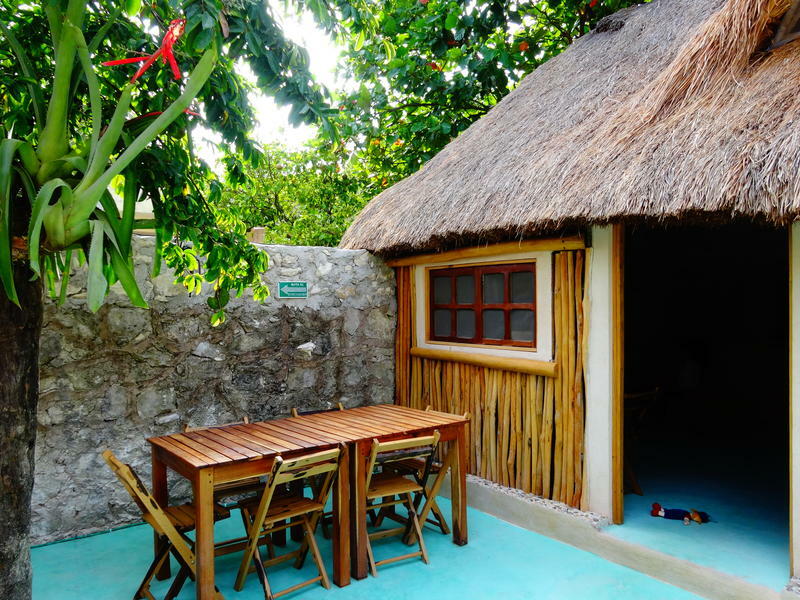 https://www.airbnb.ca/rooms/5077746?s=aorgy32m – Located in Tulum town, $38 CAD per night. 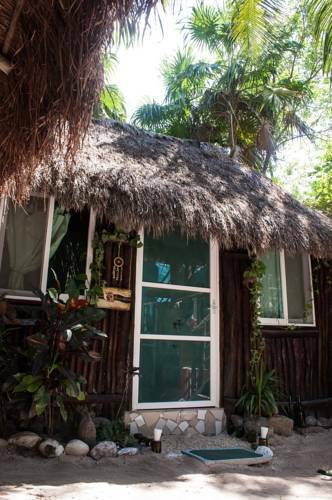 https://www.airbnb.ca/rooms/3877314?s=aorgy32m – Located in Tulum town, $41 CAD per night. 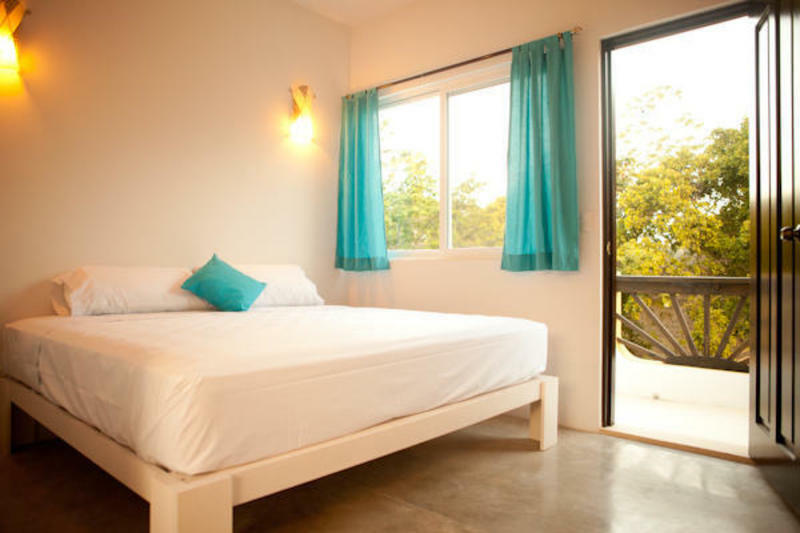 https://www.airbnb.ca/rooms/3153261?s=aorgy32m – Located in Tulum town, $60 CAD per night, 3 night minimum stay. 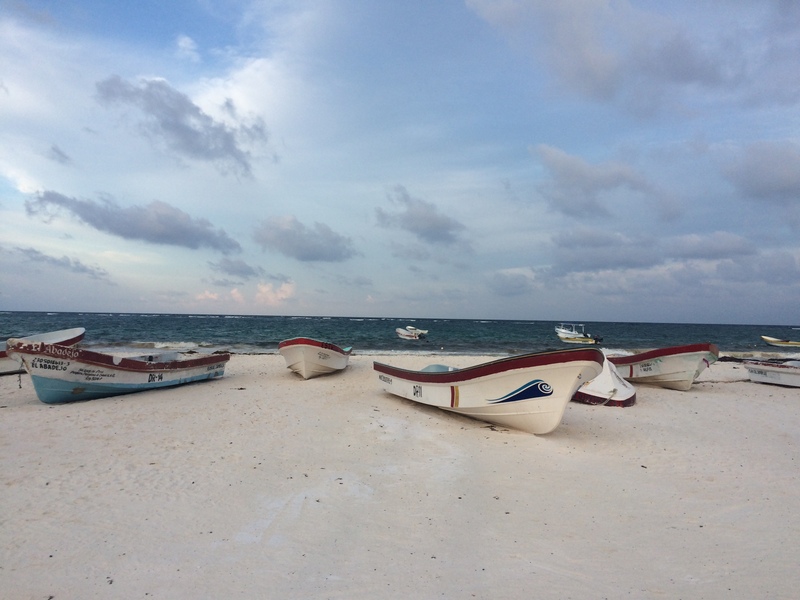 https://www.airbnb.ca/rooms/2071513?s=LkYUwkpL – Located on the beach south of Tulum (camping), $20 CAD per night. 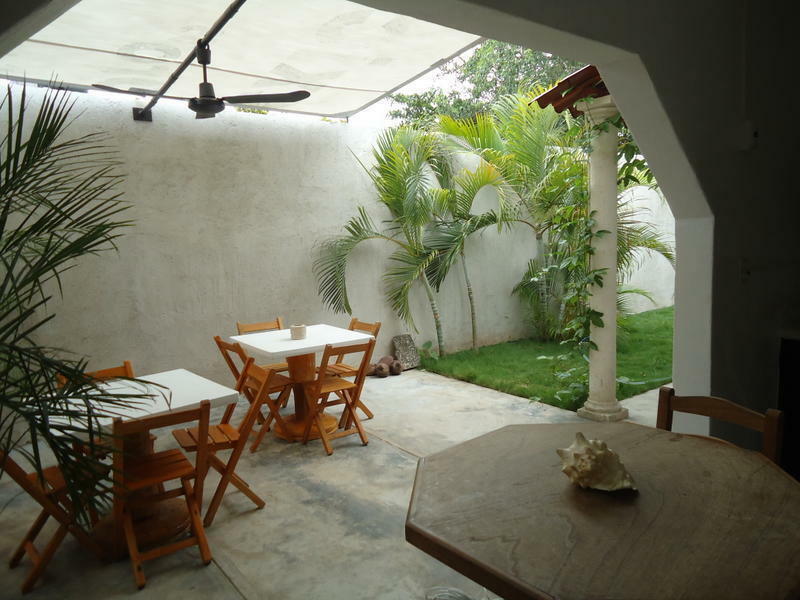 https://www.airbnb.ca/rooms/2102819?s=eAw1D67v – Located in Tulum town, $57 CAD per night, 3 night minimum stay. 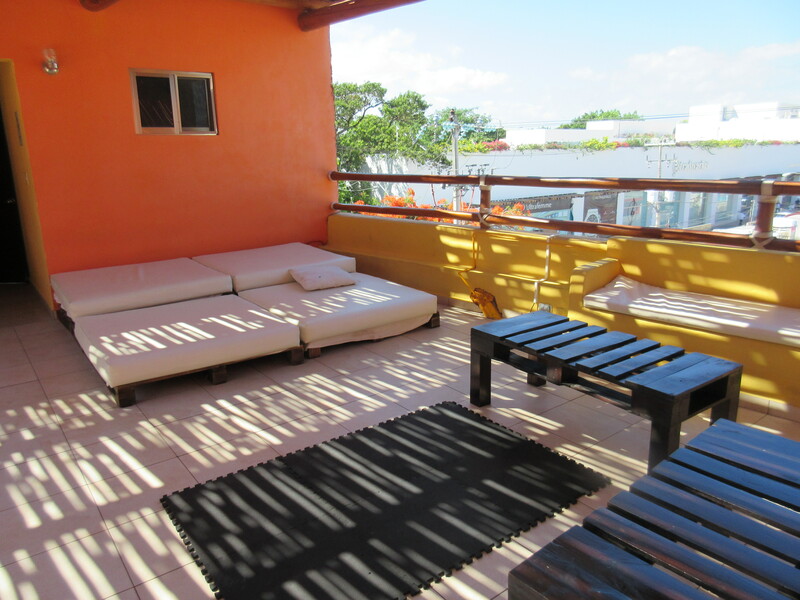 https://www.airbnb.ca/rooms/2883241?s=eAw1D67v – Located in Tulum town, $47 CAD per night, 3 night minimum stay. 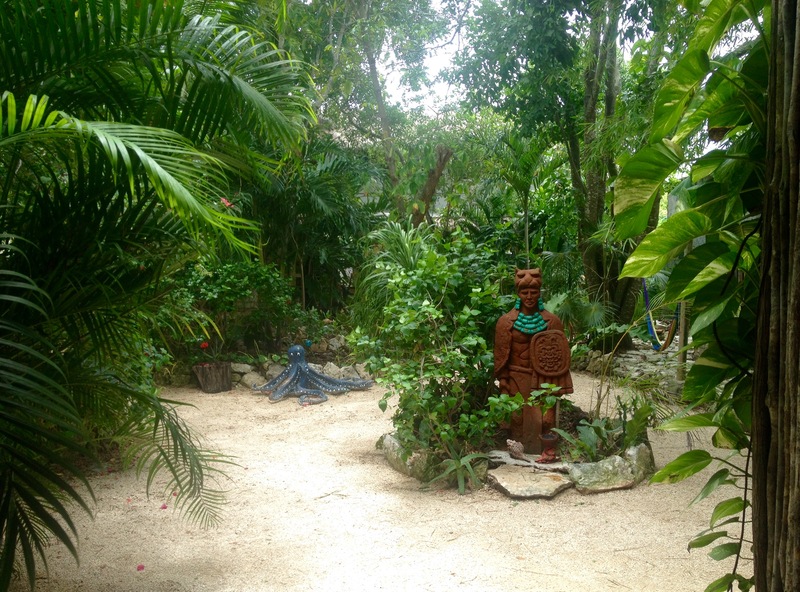 https://www.airbnb.ca/rooms/862329?s=eAw1D67v – Located in Tulum town, $52 CAD per night, 2 night minimum stay. 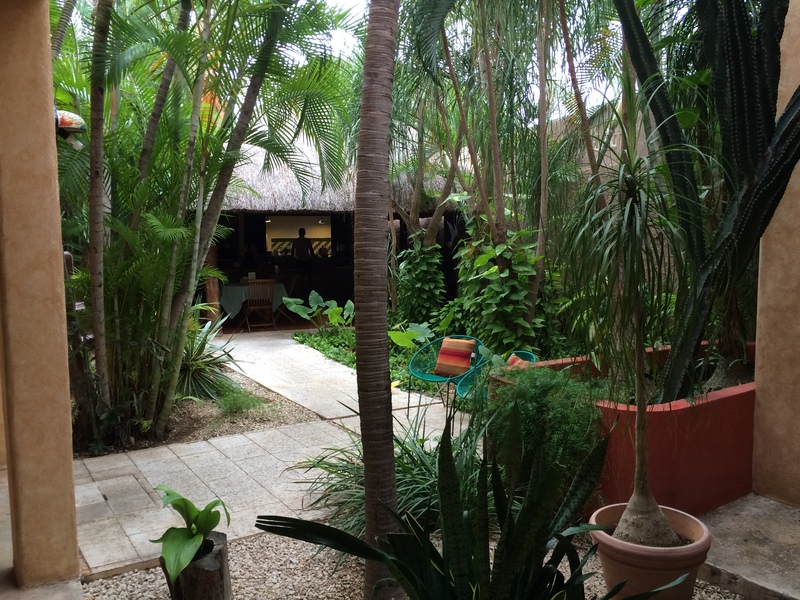 https://www.airbnb.ca/rooms/4477417?s=eAw1D67v – Located in Tulum town, $40 CAD per night, 2 night minimum stay. 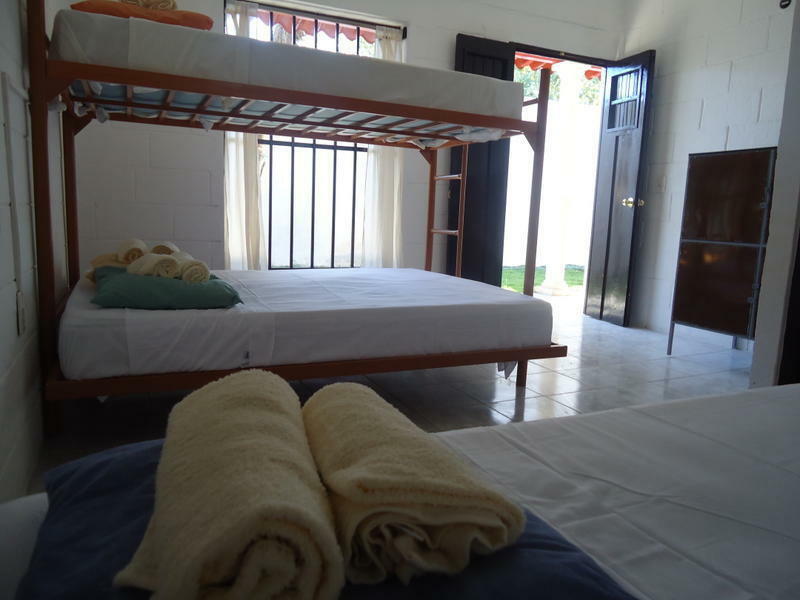 https://www.airbnb.ca/rooms/2993524?s=eAw1D67v – Located in Tulum town, $43 CAD per night, 2 night minimum stay. I hope that you have found this accommodation guide to Tulum helpful for finding cheaper places to stay on a budget. Have you been to Tulum? Where have you stayed? Do you have any recommendations that are not listed here? Playa del Carmen, Mexico is a small city located one hour south of Cancun, along the Gulf of Mexico in the Mayan Riviera. It is a popular tourist destination and is known for its gorgeous beaches. Playa del Carmen features world-class nightlife, a variety of restaurants and cuisines to choose from – from authentic street food to traditional taquerias to casual international eateries to fine dining, and a shopping district along 5th Avenue – a walking street that is completely closed to traffic. Playa del Carmen also has a wide variety of places to stay – from cheap backpacker hostels to budget hotels to unique guesthouses to Airbnb apartment rentals to expensive all-inclusive resorts along the beach. 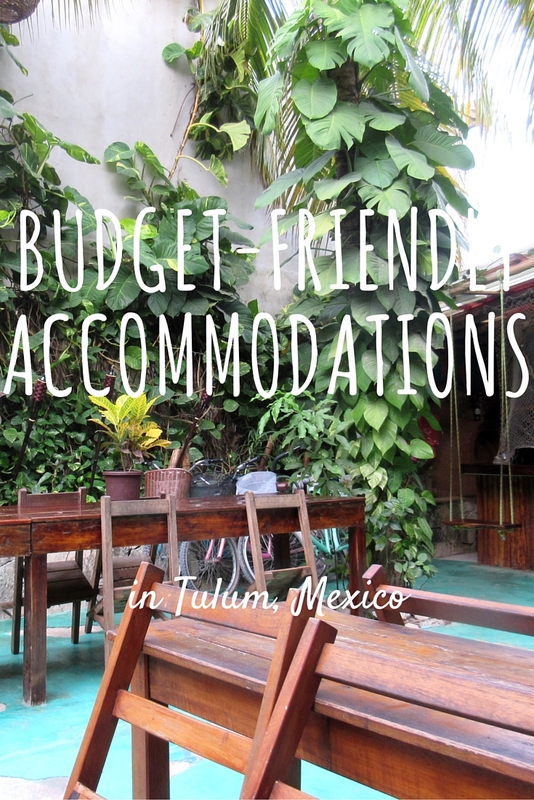 If you are traveling on a budget and are looking for cheaper accommodations, this is my comprehensive guide for budget-friendly places to stay in Playa del Carmen that won’t break the bank. I hope to show you that by staying in budget accommodations and traveling cheaper, you can save money so that you are able to travel slower and for longer periods of time. 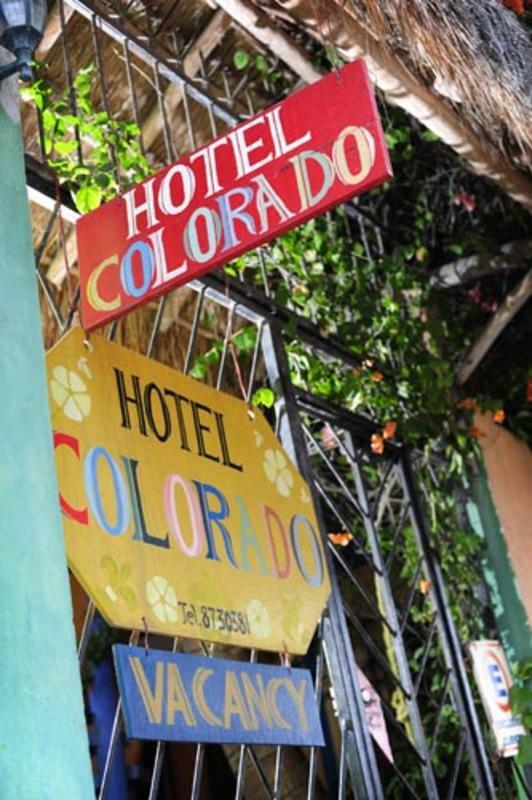 Hotel Colorado is a charming and laid-back small hotel with unique and colourful decor. It is clean, comfortable, simple and quiet. It is located a short distance off the tourist path and is within walking distance to the beach, shopping, restaurants, banks and the ADO bus terminals. The hotel features a common terrace and garden, housekeeping services, a book exchange and library. The private rooms offer a fridge, cable television, a fan or air conditioning, free Wi-Fi, private bathroom with hot water. 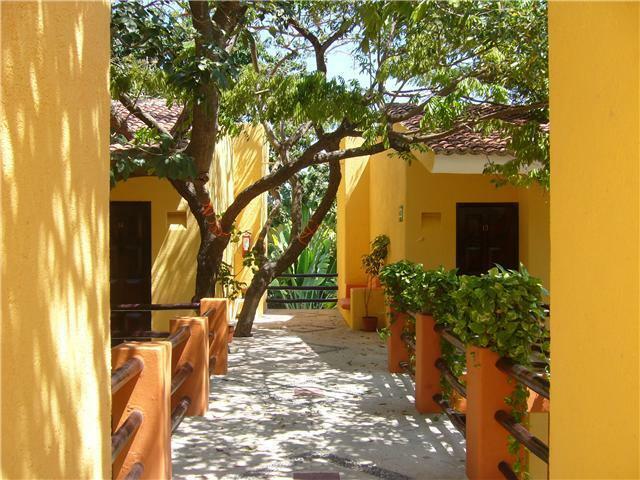 Hotel Casa Tucan is a charming and colourful hotel located only blocks away from the beach, public transportation, restaurants, and shopping. The hotel offers a swimming pool surrounded by tropical gardens, free Wi-Fi, parking, laundry services, and a relaxed and friendly environment. 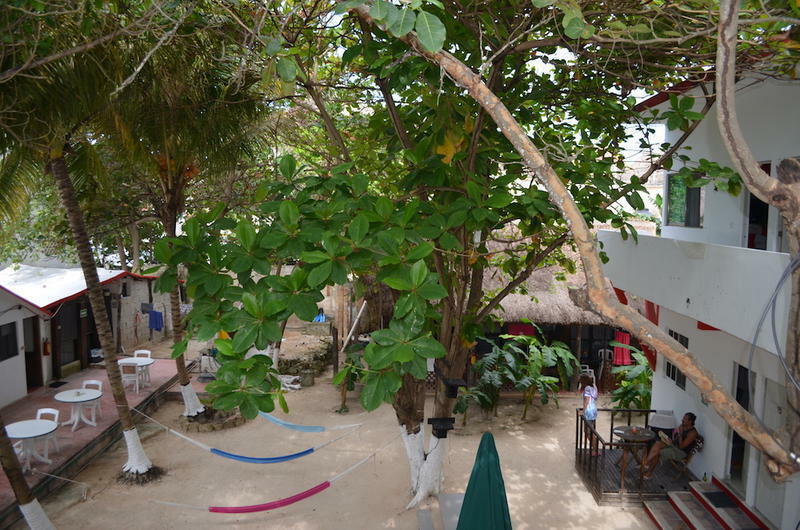 The hotel also features a small restaurant, library, internet cafe, car rental, and diving school. Casa Tucan offers 30 different rooms from cabanas with palm roofs to standard double rooms to studios with air conditioning, fans, cable television, and some even have a small kitchenette. Some rooms even have a balcony or terrace. All rooms have a private bathroom. The Bric is a clean, comfortable and quiet boutique hotel that is centrally located just steps from 5th Avenue, with shopping, restaurants, banks, public transportation and the beach. The hotel provides luxury at an affordable price. The hotel features a swimming pool, daily breakfast, housekeeping services, beach towels, private balconies and terraces, and cable television. The hotel offers 14 charming rooms with en-suite bathrooms, air conditioning, and free Wi-Fi internet. Hotel Villa del Mar is a clean, comfortable, and simple boutique hotel located one block from 5th Avenue with shopping, restaurants and transportation and two blocks from the beach. The hotel features daily housekeeping services and free Wi-Fi. All rooms offer air conditioning, a ceiling fan, a safe, private bathroom, satellite television and comfortable mattresses. Hotel Hul-Ku is a stylish, modern, clean and comfortable hotel that is centrally located within walking distance to the beach, shopping, restaurants, transportation and other attractions. The hotel features a garden, continental breakfast, beautiful shady courtyard, a wood terrace with hammocks and a beautiful fountain, on-site restaurant, outdoor swimming pool, guest computer, and free parking. The hotel offers 26 rooms that are basic, clean and spacious and that provide natural lighting and have views of the garden. Rooms feature a balcony with resting area or terrace, private bathroom, air conditioning, cable television and free Wi-Fi internet. 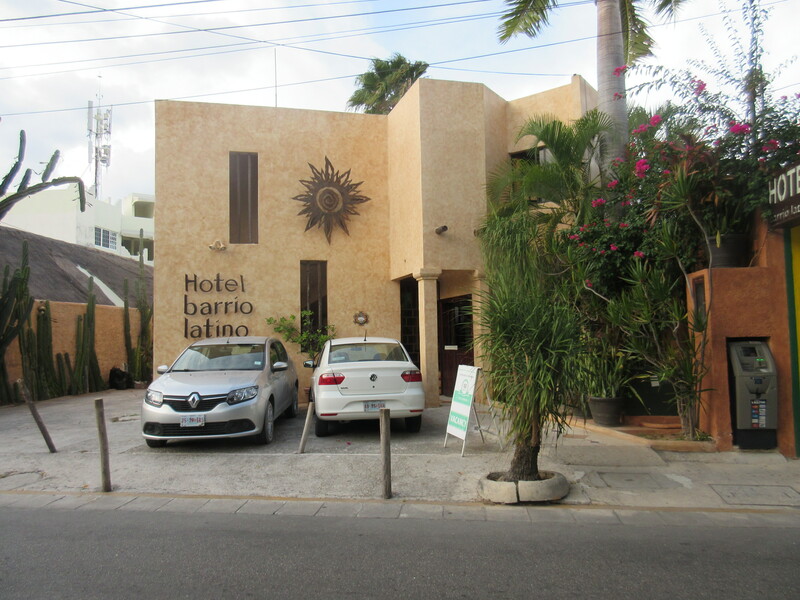 I stayed at Hotel Barrio Latino for one night during my solo travels to Mexico. Hotel Barrio Latino is a simple, clean, comfortable and modern small hotel with a relaxing and peaceful atmosphere. It is located a short walking distance to the beach, 5th Avenue, shopping, restaurants, and transportation. The hotel features a central courtyard surrounded by a lush tropical garden area, free continental breakfast that is served in the treed courtyard under a palapa roof, fast and free Wi-Fi, free international phone calls, and a guest computer terminal. The staff were polite and friendly. The hotel offers 18 comfortable rooms. The rooms are entered from the outside and they all face towards the central courtyard. The rooms are quite charming, clean and spacious and provide large and comfortable beds, a safe, full private bathroom, a ceiling fan, air conditioning, small fridge and a small terrace/balcony with a hammock that looks out towards the courtyard. The rooms have a Mexican flavour to them, with the decorations and tile flooring. To read my full review of Hotel Barrio Latino, visit this link. 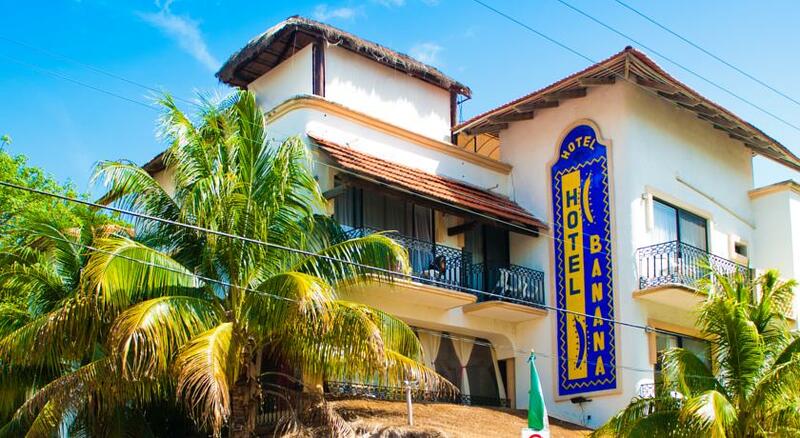 Hotel Banana is a simple and comfortable hotel with Caribbean-Mexican decor, located on the northern section of 5th Avenue with a quieter atmosphere. It is close to the beach, restaurants, shopping and transportation. The hotel features an outdoor swimming pool, 24 hour front desk, terrace, on-site restaurant, free Wi-Fi, and a small library. The hotel also provides beach towels. The rooms are air conditioned and include a mini fridge, a safe, cable television and a balcony. They are cleaned daily. Hotel Riviera Caribe Maya is a stylish, comfortable and peaceful hotel situated in a central location, a short walk to the beach, restaurants, and transportation. The hotel features a small swimming pool with lounge chairs, pleasant courtyard, free Wi-Fi internet, 24 hour front desk and security, continental breakfast, private airport transfer for a fee, massage services, laundry services, local tour information and booking services, car rental services and complimentary beach towels. The rooms are equipped with air conditioning, telephone, cable television, ceiling fan, safe deposit box, and a view of the tranquil courtyard. They are decorated with Mexican furnishings. Hotel Luna Sol is a comfortable and modern hotel with a tranquil and relaxing atmosphere, located within walking distance of the beach, shopping, transportation and restaurants. The hotel features a huge outdoor swimming pool with Jacuzzi, a poolside communal guest kitchen, free parking and free Wi-Fi in public areas. Other amenities include laundry facilities and coffee/tea in the lobby. The hotel offers 16 comfortable rooms. All of the rooms have free Wi-Fi, private balconies or patios that overlook the hotel’s gardens, and cable television. Hotel Playa del Karma is a comfortable, tranquil, modern and affordable boutique hotel located close to the beach, supermarkets, banks, transportation, shopping and restaurants. This adults-only hotel is surrounded by tropical gardens and a lush courtyard, and features an outdoor swimming pool and free Wi-Fi. The rooms provide air conditioning, a hammock, magnificent garden views, and private bathroom. Hotel Alux is a friendly and clean budget hotel located just a few blocks from the beach and the famous Fifth Avenue, along with restaurants, shopping, transportation and other attractions. The hotel provides free Wi-Fi as well as luggage storage. The rooms offer air conditioning, cable television and private bathrooms. I stayed at Hostel 3B for two nights during my first solo travels to Mexico. Hostel 3B is a new and clean hostel with modern decor and a stylish boutique appearance, located on the south end of Playa del Carmen, one block away from the shopping district of Fifth Avenue and only three blocks from the beach. It is within walking distance to the ADO bus terminal, restaurants, shopping and banks. Hostel 3B is a party hostel complete with local and internationally known DJs playing music nightly on the rooftop (it can get noisy at night if you trying to sleep). The hostel features a rooftop patio with lounge chairs, swimming pool, bar and DJ booth, a communal kitchen, fast and free Wi-Fi in the common areas (lobby and rooftop), board games, and book exchange. You can choose to stay in dormitories ranging from 6 to 12 beds (mixed or female-only). The hostel also offers private rooms. The dorms are air conditioned, have private bathrooms attached to them, have large lockers big enough to fit a backpack, and comfortable pillows and mattresses. Check out my full review of Hostel 3B at this link. Hostel Che is a friendly, fun and unique hostel with a social atmosphere and chill vibe and is centrally located only three blocks from the beach, two blocks from the supermarket and three blocks from the ADO bus terminal. It is close to shopping, restaurants and attractions. The hostel features a guest kitchen, rooftop bar and music, themed social parties in the evenings, guest computer, free Wi-Fi, luggage storage, tour and travel information, 24 hour reception, fans and common areas to meet people, relax and have fun. There are a variety of rooms to choose from, including private rooms and shared forms (ranging from 6 to 10 beds, female-only and mixed gender). The rooms are spacious, clean and comfortable. 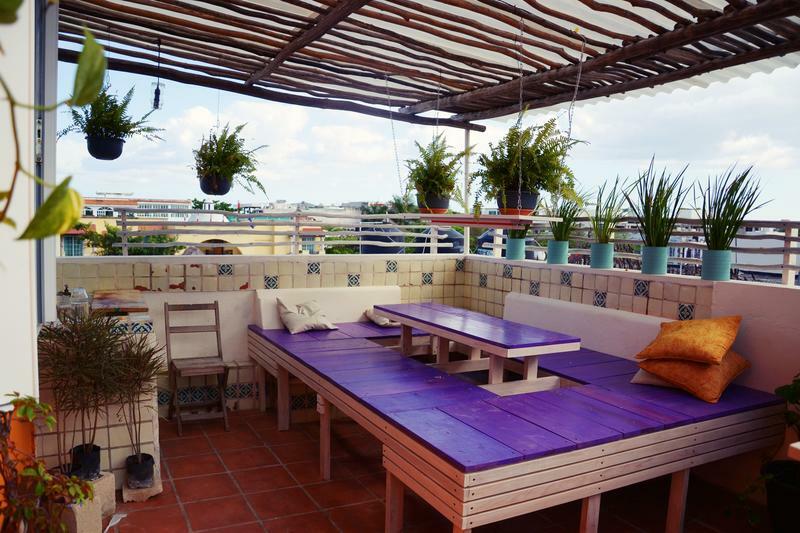 The Yak is a popular and well known party hostel with a friendly social atmosphere, centrally located in Playa del Carmen, close to restaurants, transportation, shopping and the beach but just a little ways off the busy tourist track. The hostel features a bar, relaxing common areas, free Wi-Fi internet, free continental breakfast, hammocks, air conditioned rooms, luggage storage, BBQ facilities, a book exchange, live music, activity nights, housekeeping, 24 hour reception and security and a rooftop terrace. The Yak offers simply decorated shared dorms (ranging from 4 beds to 12 beds, all of them are mixed gender) and private rooms, which all include a small kitchenette and fridge along with bathrooms and showers, as well as lockers in the dorms. 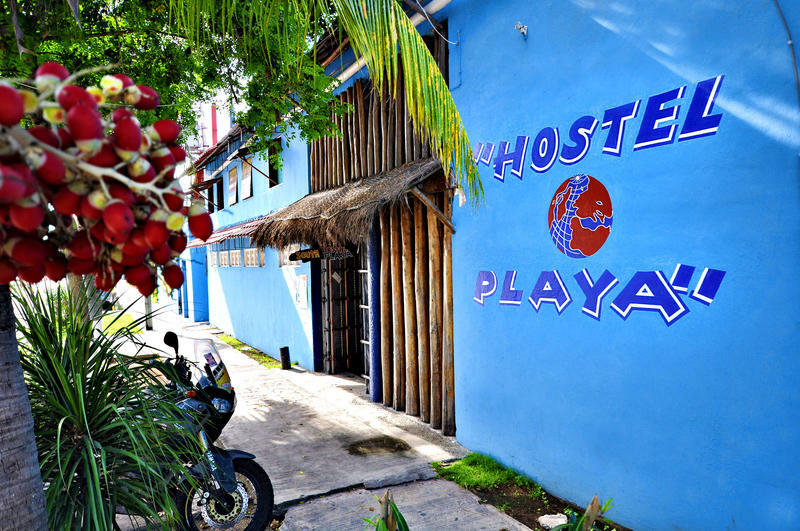 Hostel Playa is a clean and fun hostel, centrally located a short ways off the tourist track, but close to transportation, restaurants, the beach and shopping. The hostel features free Wi-Fi, luggage storage, a guest computer, fully equipped kitchen, free breakfast, good music, housekeeping, fans, swimming pool, rooftop terrace, hammocks and quiet lounging areas, BBQ area, secure parking, large garden area where you can socialize, living room with cable television, DVD player, books and board games. The hostel has a huge common area which is perfect for playing cards, relaxing, meeting other travelers, watching TV or reading. The hostel offers shared dorms (ranging from 5 to 8 beds, female, male and mixed gender) and private rooms. The dorms include lockers, individual fans, mosquito nets, comfortable mattresses and all rooms have linens included. 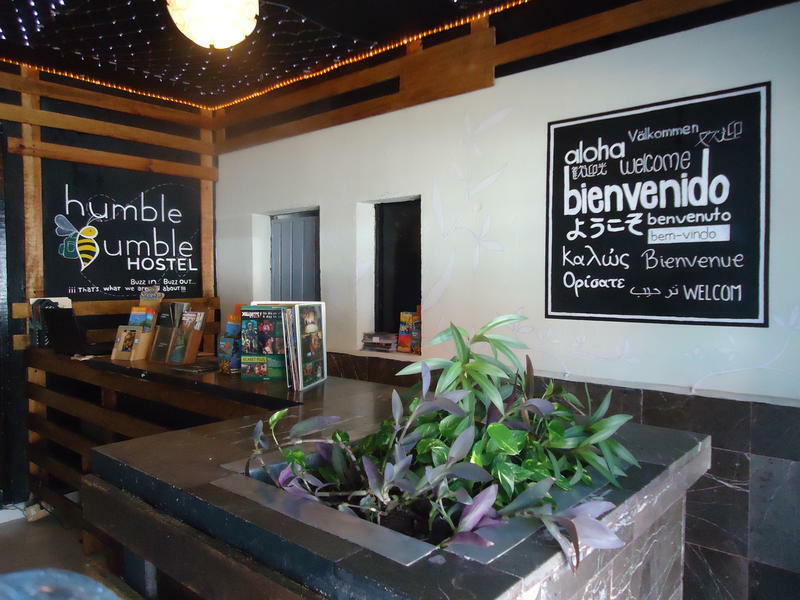 Humble Bumble is a new, friendly and comfortable hostel with chic modern decor and a laid back atmosphere, located off the tourist track, but within walking distance to restaurants, local taquerias, supermarkets, shopping, transportation, and the beach. 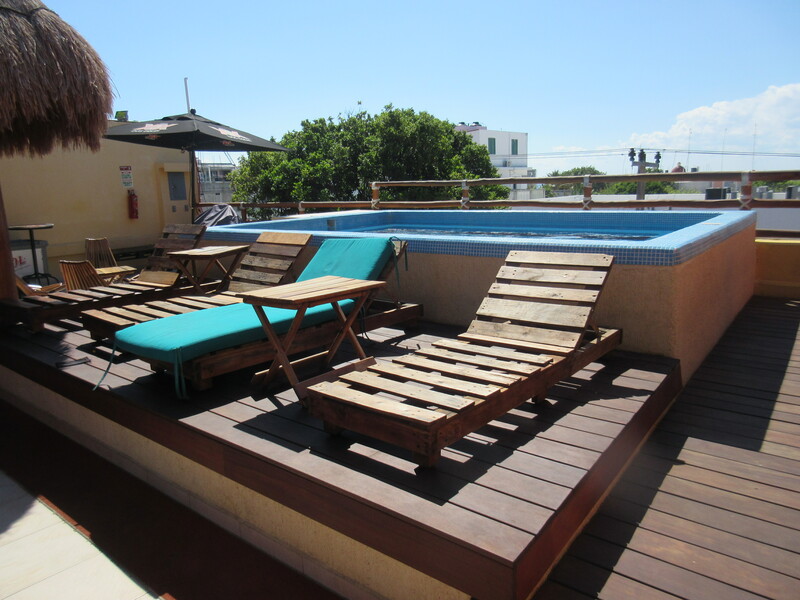 The hostel features a rooftop terrace, small swimming pool, shared kitchen, and BBQ facilities. The hostel offers a variety of rooms including shared dorms (female, male and mixed) and private rooms. All rooms have free Wi-Fi access, air conditioning and a private bathroom. Hostal MX is a newer and unique hostel in a rustic-style building with Mexican style and flavour and an abundance of vegetation. 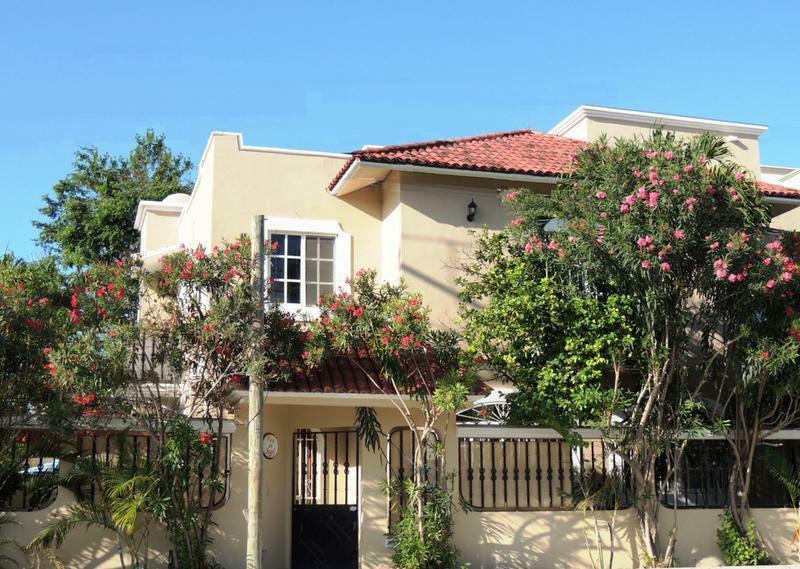 It is centrally located on the popular 5th Avenue and is steps from restaurants, shopping, the beach and transportation. The hostel has a peaceful atmosphere despite its location. The hostel features a beautiful garden with tropical vegetation, hammocks, a bar, outdoor Jacuzzi, 24 hour reception and security, free Wi-Fi internet, included breakfast, housekeeping, linen included, lockers, book exchange, hot showers, and board games. Rooms include 6, 8, and 12 bed mixed dorms. 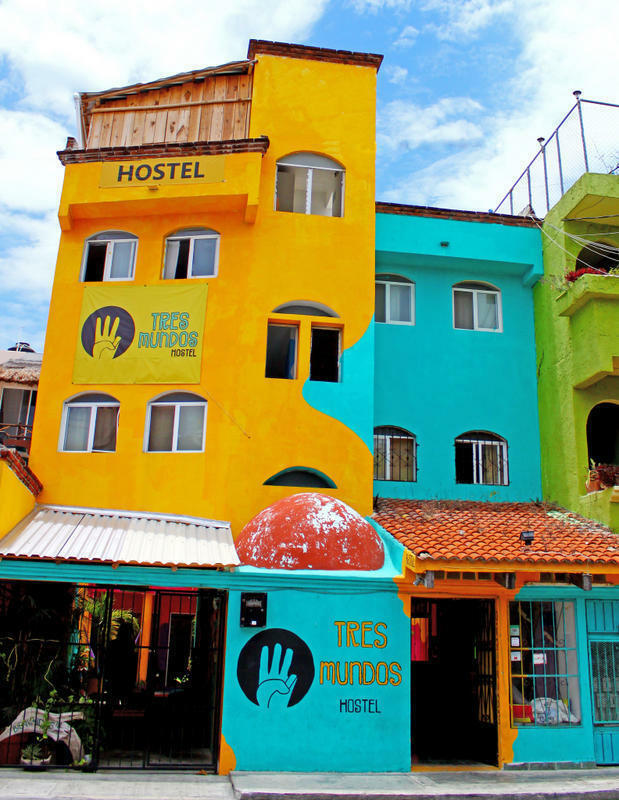 Tres Mundos is a unique, colourful, comfortable hostel located within walking distance of shopping, restaurants, banks, transportation and the beach. It is surrounded by cheap eateries with tasty local food. This is not a party hostel but it does maintain a friendly social atmosphere and the staff treat guests like family. The hostel features free and fast wireless internet, free continental breakfast, fully equipped kitchen, comfortable common area with cable television, rooftop terrace with hammocks, BBQs and big tables for relaxing and socializing with new friends, included linens, book exchange, laundry service for a fee, towel rentals for a fee, and tour information. The hostel offers a variety of rooms including mixed or female-only dorms with 6 and 8 beds, with a bathroom ensuite or shared bathroom. They also have private rooms, with or without a bathroom ensuite. Two private rooms have air conditioning. All dorms have fans and lockers. 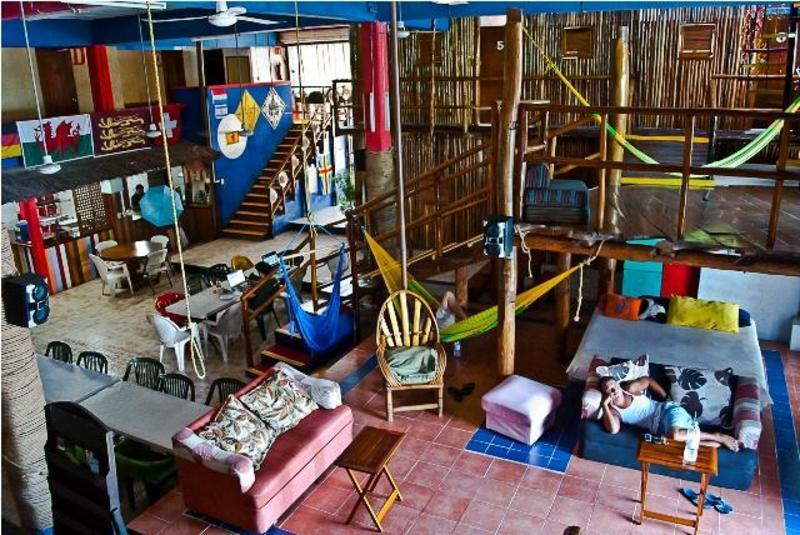 Xaman Eco-Hostel is a simple and basic hostel, centrally located just two blocks from the beach and one block from 5th Avenue with restaurants, shopping, and transportation. 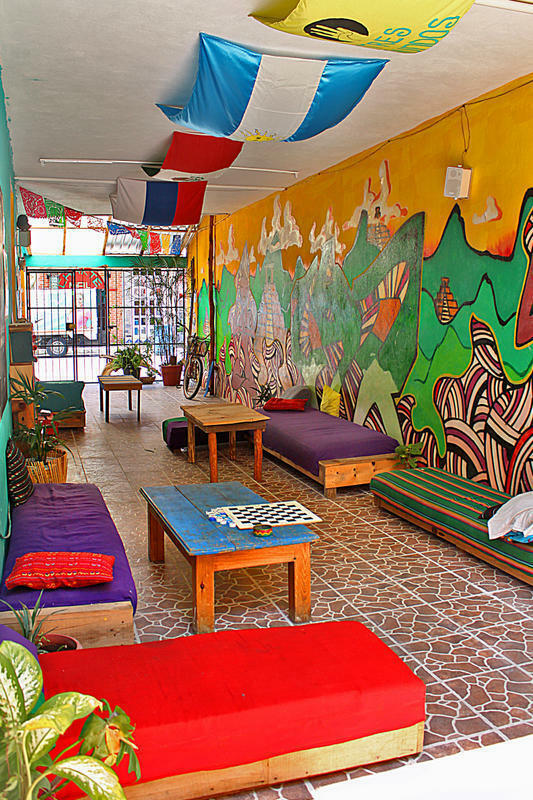 The hostel uses recycled decorations, has lots of plants and uses earth friendly products. The hostel provides complimentary breakfast, free purified and cold drinking water, free Wi-Fi, outdoor terrace and common lounge area, communal kitchen, luggage storage, and hot showers. Room options include private rooms, a 4 bed female dorm and 10 bed mixed dorm. The shared dorms feature a fan and storage lockers for personal belongings. All bathrooms are shared. 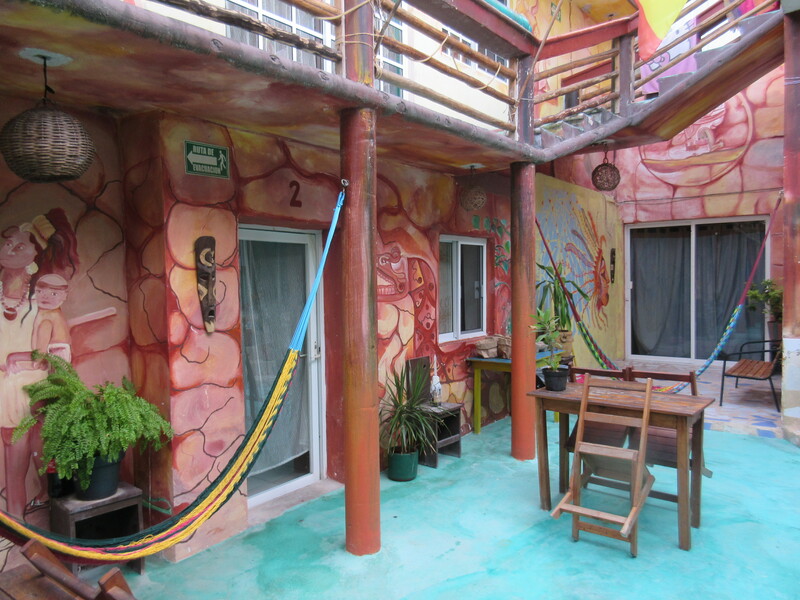 Siete Colores Hostel is a quaint, colourful, friendly and comfortable hostel located refurbished colonial house off the tourist path, but close enough to the beach, 5th Avenue, shopping, restaurants and transportation. The hostel provides 24 hour reception, free Wi-Fi, luggage storage, book exchange, guest kitchen, common areas, housekeeping, hot showers, outdoor terrace, lounge with cable television, and board games. 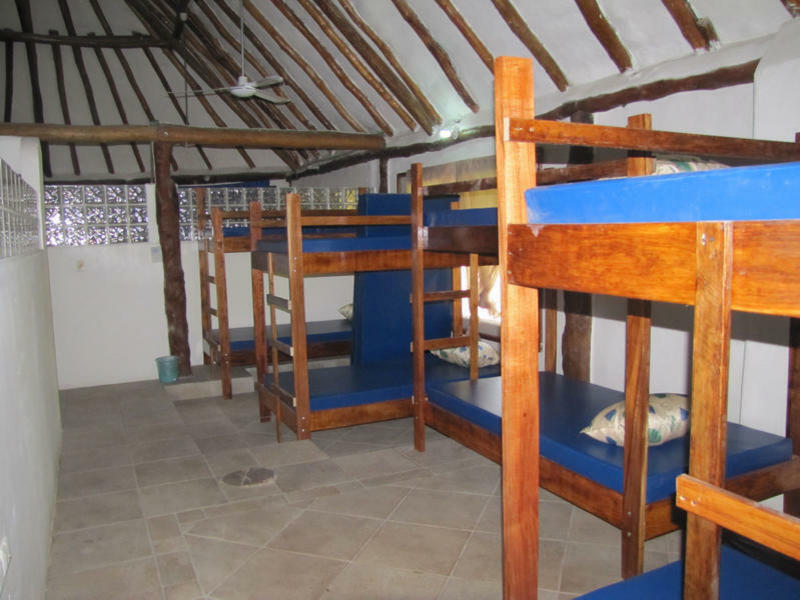 The hostel offers a 6 bed male dorm, 6 bed female dorm and 7 bed mixed dorm. Tequilita Hostel is a party hostel with unique and colourful decor located a little bit off the beaten tourist path from the busy 5th Avenue, but still close enough to restaurants, banks, the beach and transportation. The hostel offers free Wi-Fi, a communal kitchen, TV area, bar, outdoor terrace, luggage storage, common areas to relax and a book exchange. You can choose to stay in a 6 bed mixed dorm, 7 bed female-only and mixed dorm, 10 bed mixed dorm as well as some affordable private rooms. 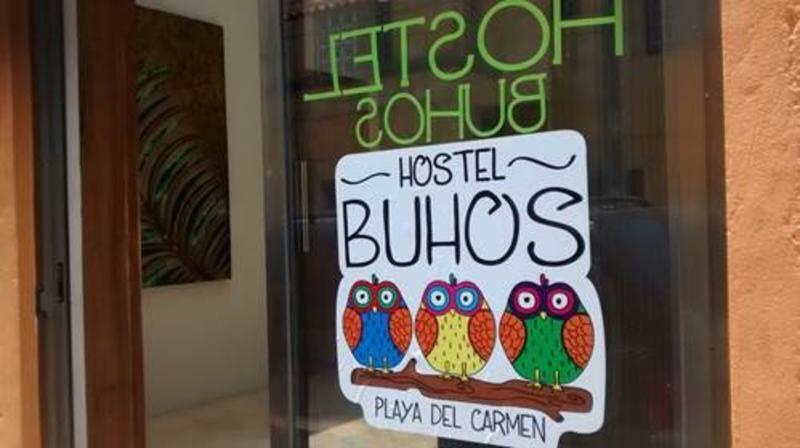 Hostel Buhos is a comfortable and stylish new hostel in Playa del Carmen, located only three blocks away from the popular and busy 5th Avenue on a quiet and less touristy street, but still within walking distance to restaurants, bars, transportation and the beach. The hostel features air conditioning, hot water, free Wi-Fi, a guest computer, free purified drinking water, in addition to new furniture, mattresses, beds and fresh linens. The hostel offers an 8 bed female dorm, 12 bed mixed dorm and a selection of affordable private rooms. 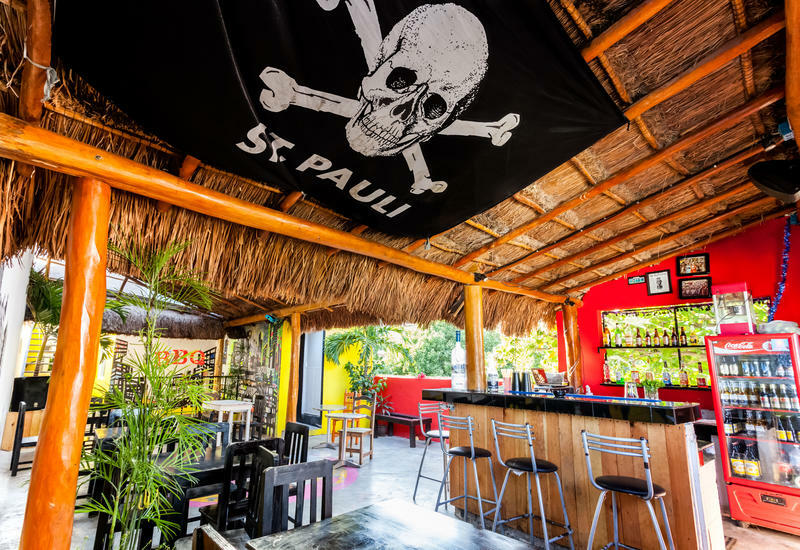 Popl Vuh is a small and simple hostel located in the heart of Playa del Carmen, literally steps from the beach and less than a block from 5th Avenue along with the ADO bus terminal, restaurants, banks, and attractions. The hostel features free and fast Wi-Fi, a central garden surrounded by palm trees with peace and tranquility to relax, and a guest kitchen for you to prepare your own meals. There are a variety of private rooms to choose from that include double rooms and a variety of cabin style-rooms. Select rooms have air conditioning, cable television, and private bathrooms. The other rooms have shared bathrooms. Airbnb is a website where locals in destinations around the world can rent out a private room in their home or apartment or their entire home or apartment to travelers. Playa del Carmen has TONNES of unique properties and rooms to choose from, in all areas of the city. If you are planning on traveling slower and staying in Playa del Carmen for a longer period of time, Airbnb is a great option as you can find places that offer weekly and monthly rental prices. Airbnb rentals are also often much cheaper than staying at a hotel, more so for the long term. Click here to get a $25 USD discount off your first booking when you sign up for Airbnb! Workaway and HelpX are websites that connect volunteers to places in destinations around the world where you can help and offer your skills and time. In exchange for volunteering 4-5 hours per day for 5 days a week, your host will provide you with free accommodation and sometimes food. Popular places where you can volunteer include backpacker hostels, guesthouses, local hotels, travel companies, farms, businesses and individuals. This is a great option for budget travelers who wish to stay longer in Playa del Carmen while saving money on accommodation and food costs! You are also rewarded with the satisfaction of helping a local business or individual out. You can check out the websites to browse through the volunteer listings and purchase a membership to contact the hosts. 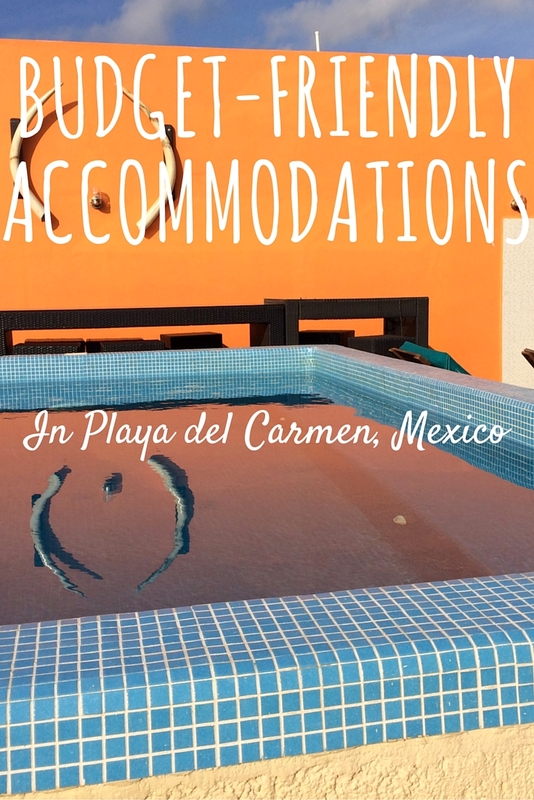 I hope that you have found this comprehensive budget-friendly accommodation guide to be helpful for your Playa del Carmen travel planning! I value budget travel and slow travel and I kept these two travel styles in mind when making this list to help you save money on accommodation costs while traveling and helping you be better able to stay for longer in Playa del Carmen. Have you been to Playa del Carmen? Stayed at any of my recommendations? Do you have any other suggestions for places to stay that you feel should be added to my list? My favourite set of doors near Valladolid’s market. So colourful! The first time I visited Mexico, was in 2011 with my family. 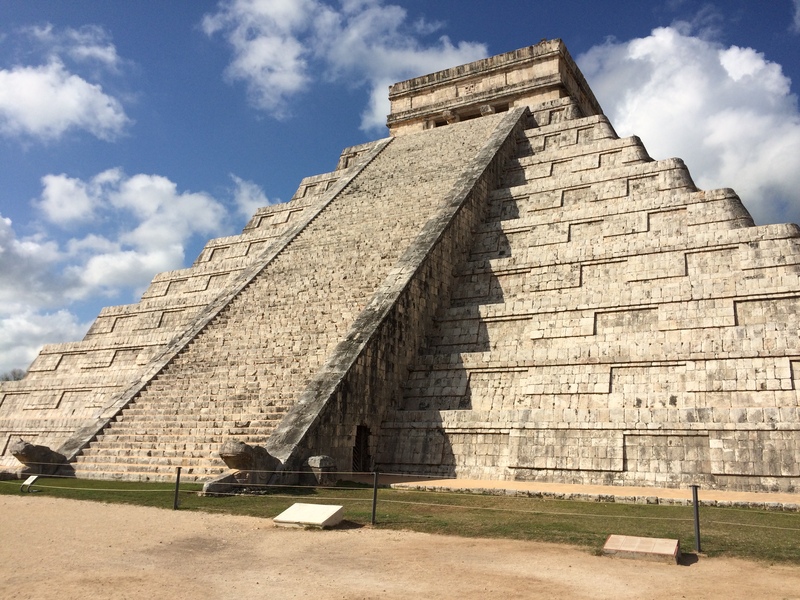 It was my first trip abroad (aside from going to the United States) and we stayed at an all-inclusive resort near Playa del Carmen, in the Mayan Riviera. Even though we didn’t stray too far from the resort, it was absolutely amazing! Since then, I have been to Mexico two more times with family and once backpacking as a solo traveler. With every trip, I have fallen more and more in love with this beautiful country! Mexico offers so much more than the all-inclusive beach resorts from Cancun to Tulum. The beaches are some of the most gorgeous in the world, but if you visit Mexico and stay on a resort property or the beach the entire time, you are missing out on so many amazing things. Mexico is a diverse country and there is a wide variety of activities to do and experiences to be had. 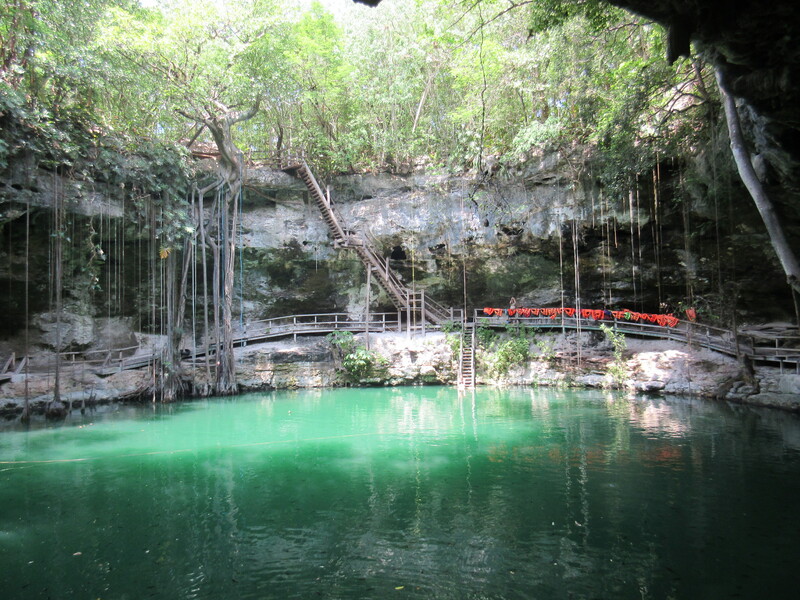 You can swim, snorkel or dive in natural underground sinkholes known as cenotes, explore some of the many ancient Mayan ruins, see gorgeous waterfalls in the jungle, explore authentic Mayan villages, eat traditional Mexican food, engage in adventure activities like zip-lining over the jungle treetops, wander through colourful and colonial towns and cities, and much more. There are many things to do, both touristy and off the beaten path. The country has an array of landscapes, from jungle to desert to mountains to beaches to colonial cities to traditional villages. Mexico is definitely a country worth exploring. 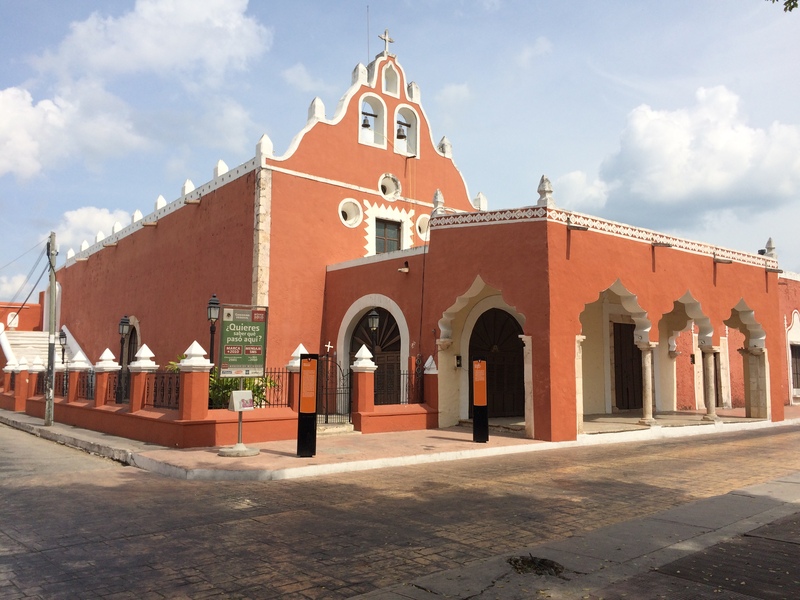 If you are staying at a resort, I highly recommend venturing into the “real” areas of Mexico in order to experience and interact with the country’s authentic culture, cuisine, language and people. Backpacking through Mexico on my first trip as a solo female was an unbelievable experience! There is no question about it, Mexican and Mayan food is absolutely delicious. In the Yucatan Peninsula, you can find tacos, panuchos, sopes, salbutes, huevos rancheros, chilaquiles, guacamole, paletas, aguas frescas, cochinita pibil, poc chuc, and so much more. As a fruit and veggie lover, I was in heaven with the constant availability of fresh produce. 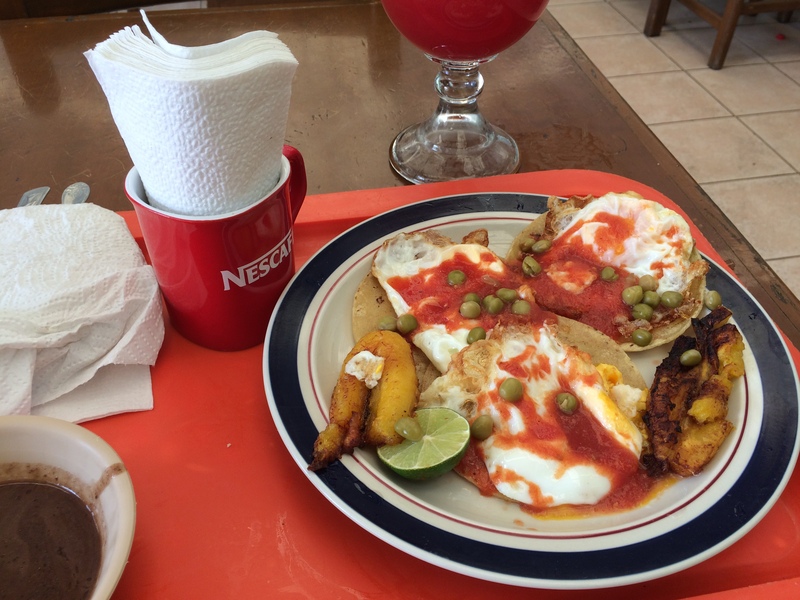 If you want to read all about the various foods you should sample in the Yucatan, then check out this post. Mexico has everything from street vendors, to family-run eateries, to upscale restaurants serving traditional and authentic Mexican cuisine and regional specialties. If you’re feeling adventurous, I recommend trying the street food at one of the many food carts everywhere. It is fresh, spicy, delicious and authentic. My favourite foods would probably be tacos al pastor, panuchos, huevos rancheros and guacamole. 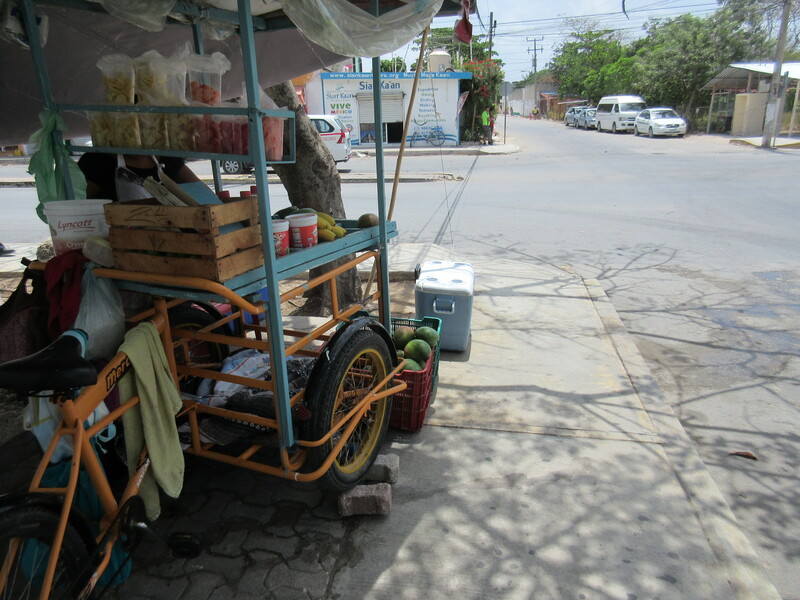 I loved the fresh fruit popsicles known as “paletas” for snacks and desserts. And my favourite aguas frescas (a beverage made with water, sugar and fresh fruit) flavours were jamaica (hibiscus flower), horchata (made from rice, vanilla and cinnamon), and sandia (watermelon). Visiting the local markets was one of my favourite things to do and there were so many exotic and delicious fruits and vegetables to try! I loved eating at the street vendors and small eateries or “loncherias” (lunch restaurants). 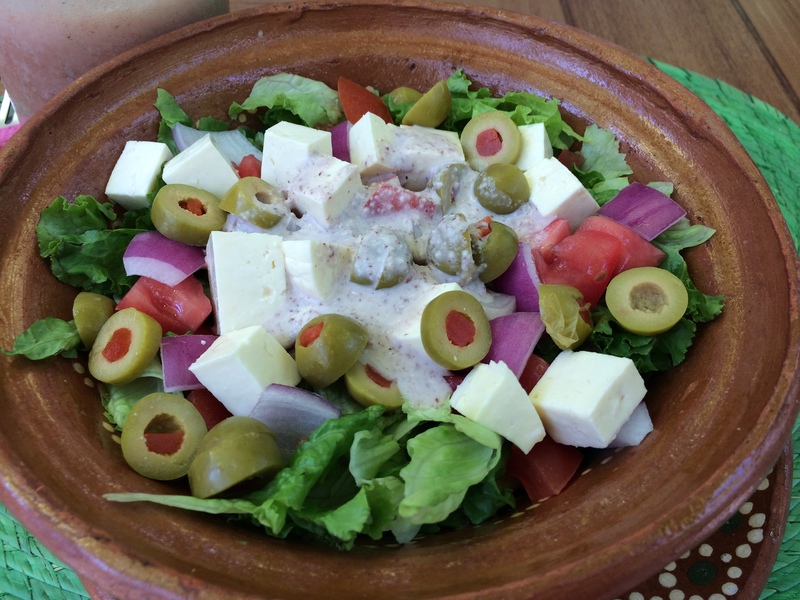 I was often the only Caucasian female tourist eating at these places, and it was fascinating to just observe the daily life of the locals around me, practice my Spanish with the restaurant staff and immerse myself in the culture. The majority of the locals that I interacted with in Mexico were super friendly, warm, welcoming and helpful; from the shop-owners, to the restaurant staff, to the bus/colectivo/taxi drivers, and more. They are so cheerful too! 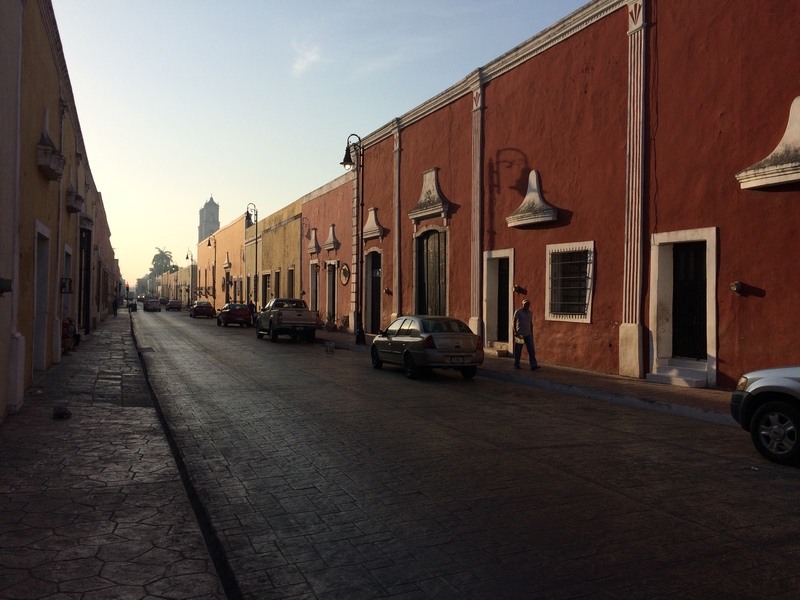 When I would go for morning walks and wander through the streets, the local people and shop-owners would say “buenos dias” (good morning) to each other and to tourists as they passed by on the streets and sidewalks. It felt really welcoming and I liked that everyone acknowledged each other, instead of just burying their faces in smartphones and keeping to themselves, as is the case in Western cultures. I bought fresh coconut water from a local man in Tulum, during my walk through a residential neighbourhood near my hostel. He was so friendly and inviting, and offered for me to have a seat on a chair in his front “yard” (a cement block in front of his house). He spoke great English, as he worked as a scuba diving instructor at the nearby Dos Ojos Cenote, and we chatted about our lives. His mother (who spoke no English) also joined us outside. It was such a cool experience being able to interact and connect with the locals like that! Compared to Canada, the weather is always warm in Mexico! I love the heat and visiting Mexico in May, which is one of the hottest months, was absolutely amazing for me. It can’t get much better than +35 to +40 degrees Celsius every day! 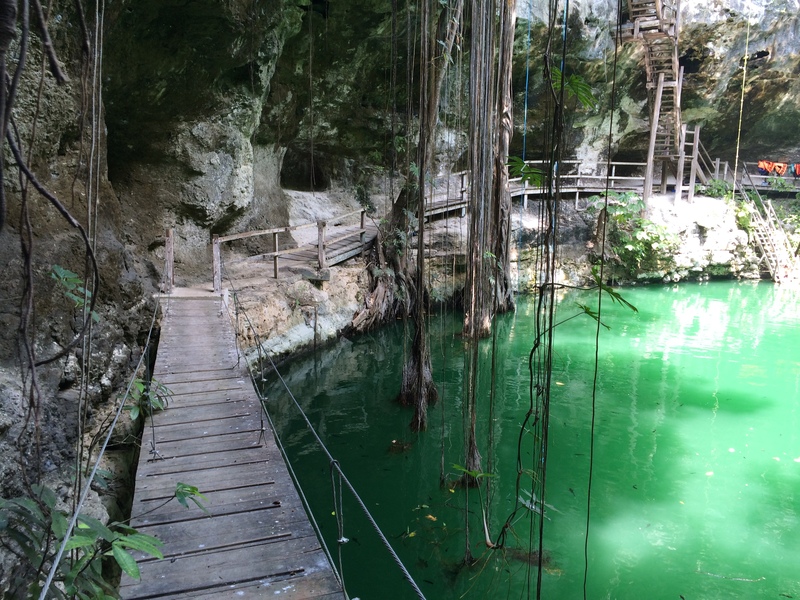 Perfect weather for cooling off for a swim in the cenotes. 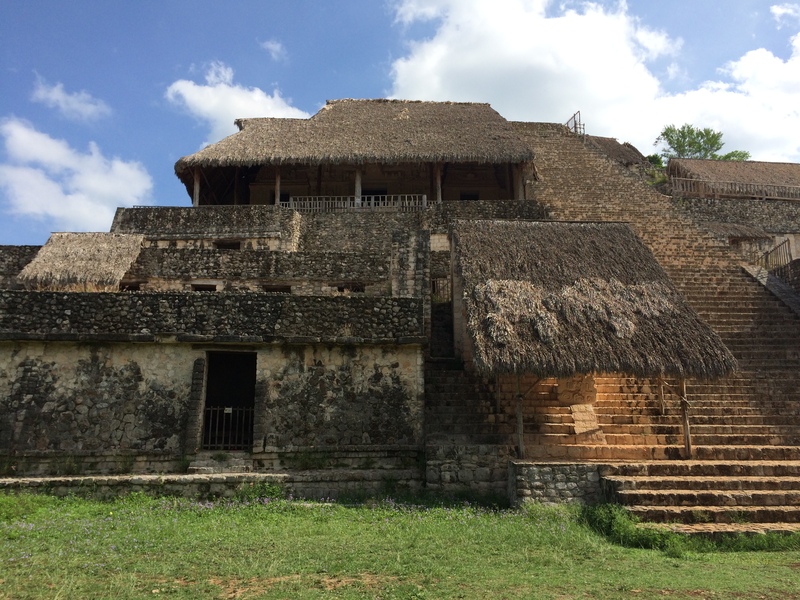 I am fascinated about culture, and the Mexican and Mayan culture is very interesting to learn about. I loved sitting in a park or wandering the streets and just observing the culture around me. If you want to read more about my cultural observations, check out this detailed post. The mainstream media wants you believe that Mexico is a country that is much too dangerous to be visiting. However, they tend to generalize violence and crime in certain states (usually the central and northern border states) to the entire country, which is unfair. 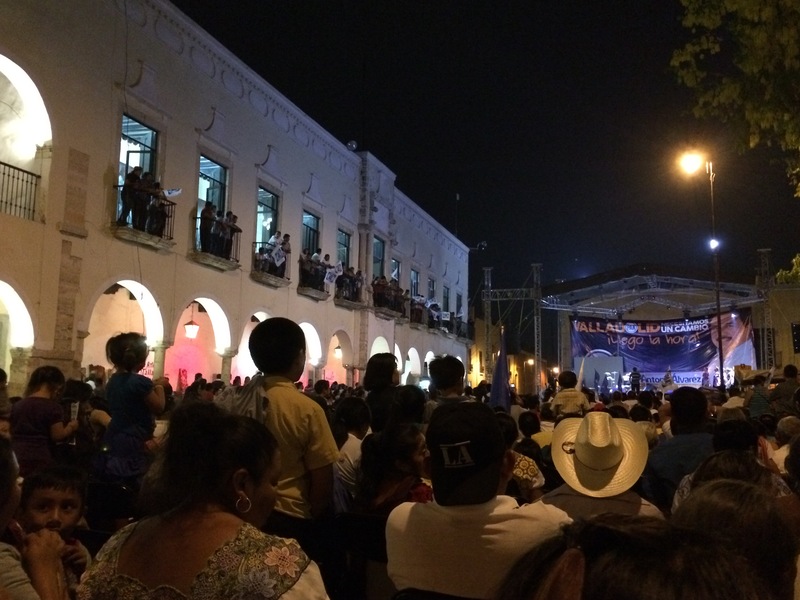 The three states that make up the Yucatan Peninsula, have some of the lowest violent crime rates in Mexico and is considered the safest region of Mexico. The crime rates are even lower than rural areas and large cities in the United States! 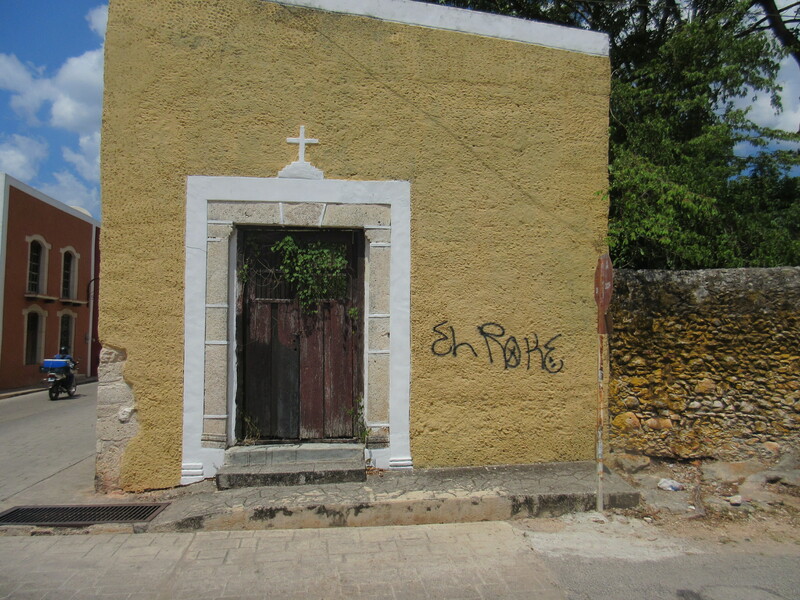 The Yucatan Peninsula is a very safe area of Mexico to explore, in addition to some other states. As a solo female traveler, I felt super safe there. 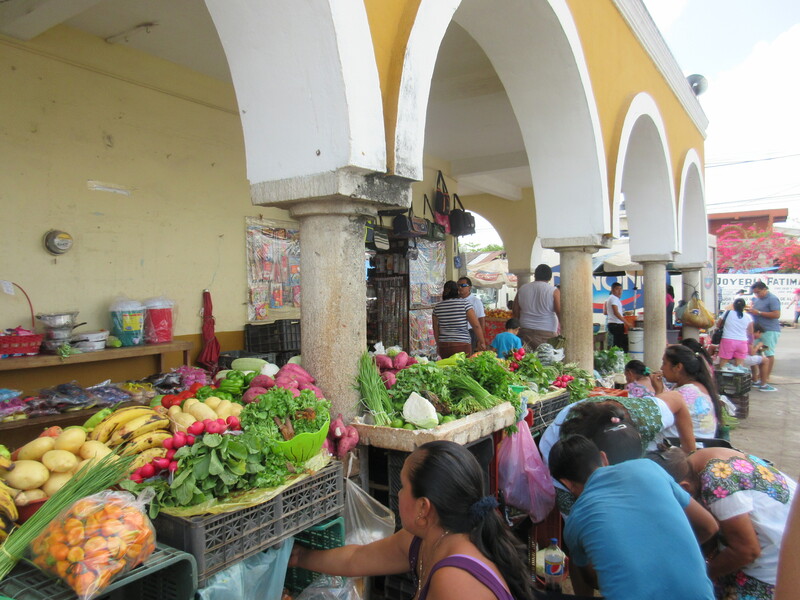 Visiting the vibrant local markets in Tulum and Valladolid was one of my favourite things to do in Mexico. 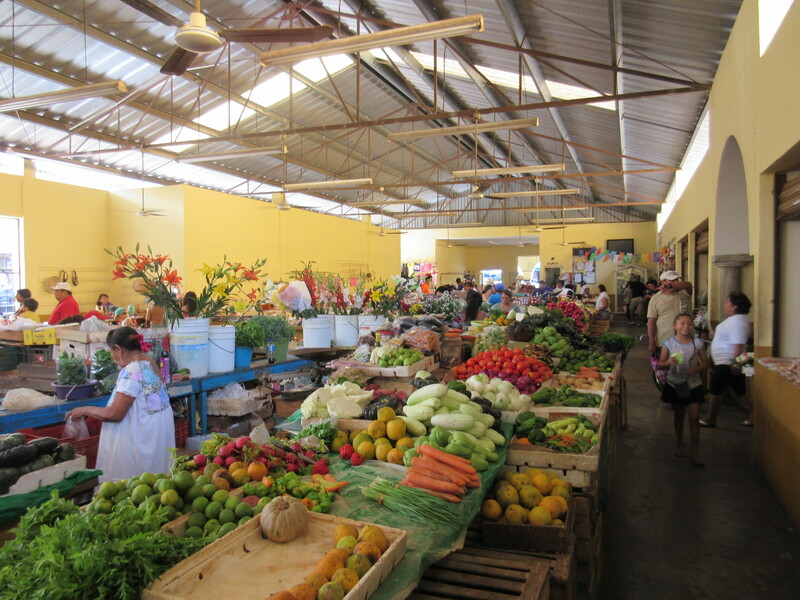 The markets are colourful and a hub of activity, and most of the locals do all of their shopping here. 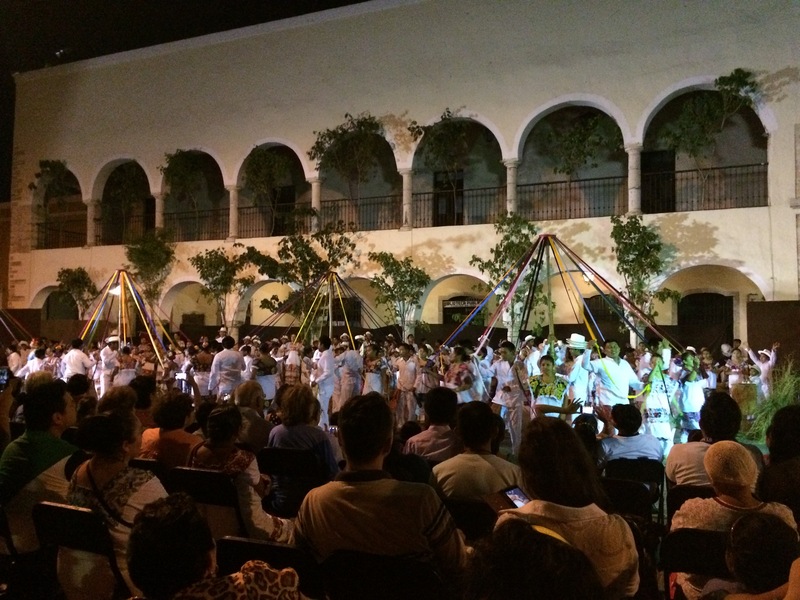 They are colourful and busy and a great place to immerse yourself in and learn about the local culture while practicing your Spanish and getting off the beaten path. As I toured the markets, I was often the only Caucasian female tourist wandering around. It was such a cool experience! Some of the markets are so big and it’s overwhelming at times, because there is just so much to see, smell and taste. The markets don’t just sell fresh fruits and vegetables, they sell everything you can imagine! There are toys, games, personal care products, shoes, clothing, handbags, spices, dry goods, herbs and more. As a vegetarian (most of the time), walking through the meat section of the market was interesting and slightly nauseating. 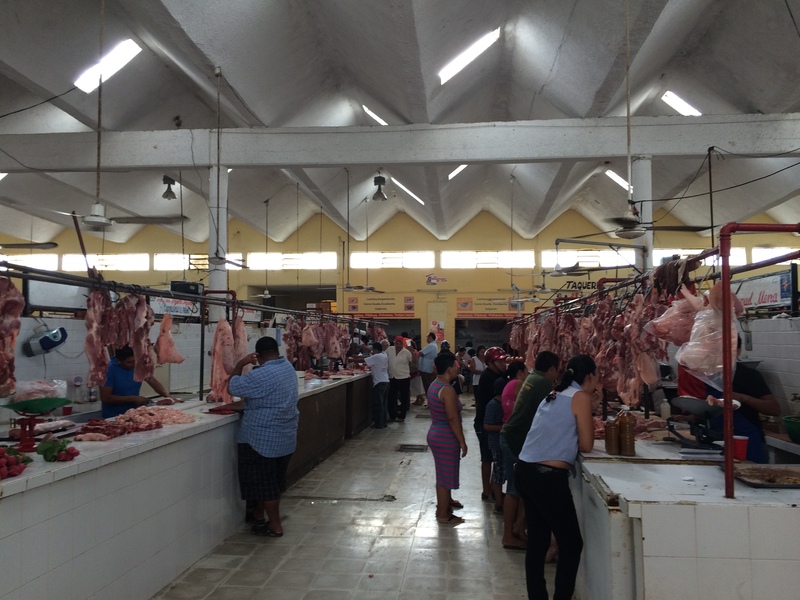 The aisles were lined with tables, with local men chopping up and portioning very fresh meat, and then bagging it up for customers. I saw almost every animal body part imaginable being sold to people… things that I had no idea people even consumed! There were animal eyeballs, heads, intestines (hanging from strings above the meat table), legs, hooves, and other body parts that almost induced vomiting as I walked by. There were so many flies sitting on everything, that I couldn’t imagine eating the meat… How is everybody not sick all the time? But it was definitely interesting to walk through the area. My favourite sections of the market were obviously where the fruits and vegetables were! There were local Mayan women dressed in their traditional outfits selling their produce, which was fresh, local and ridiculously cheap. 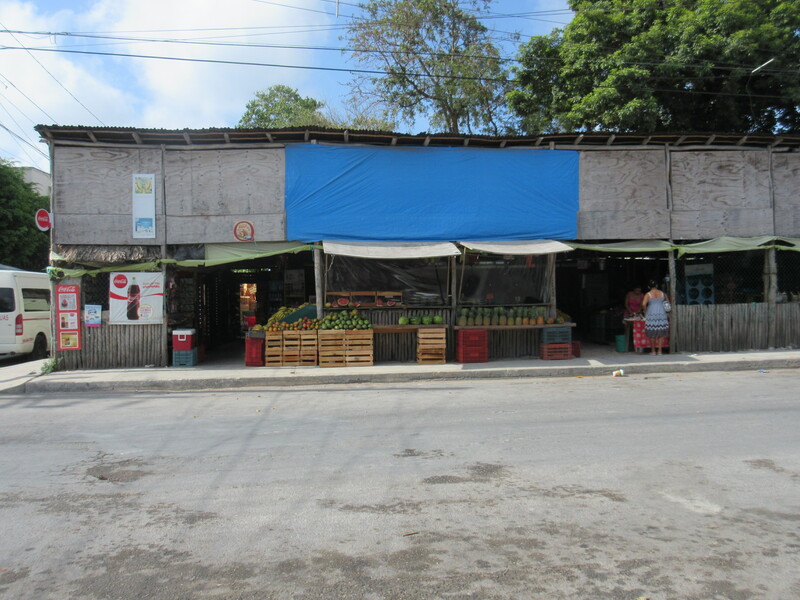 You could even buy freshly cut fruit pieces in a bag for only 10 pesos, which you could enjoy eating immediately! There was produce I was familiar with and then some exotic things that I had never heard of or seen before. 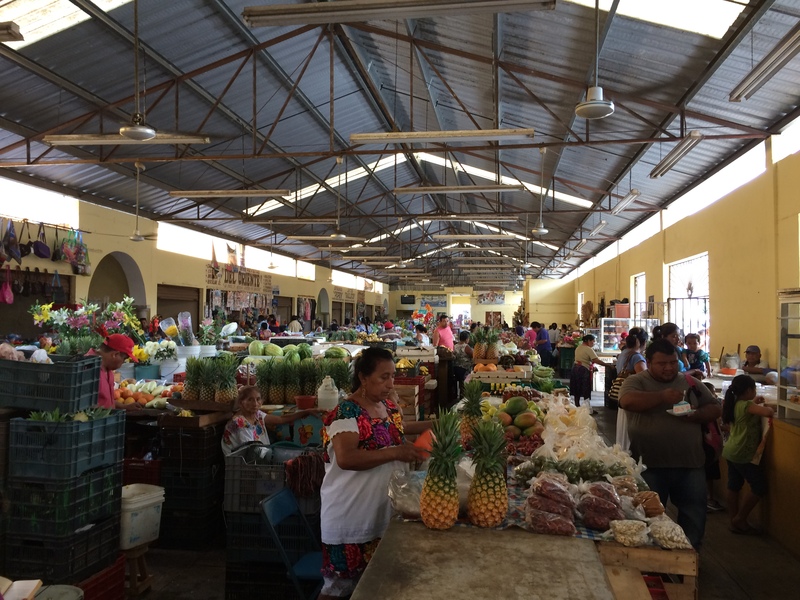 I recommend checking out some of the many markets when you are in Mexico! 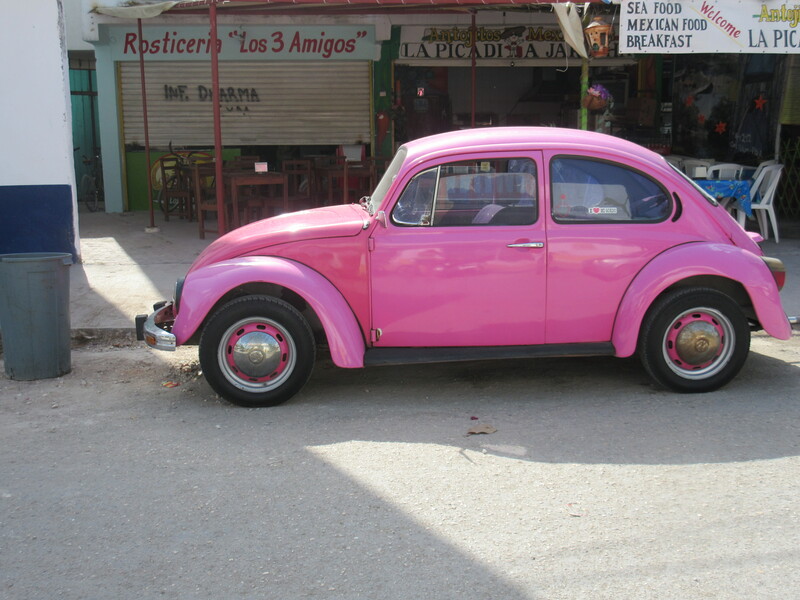 Mexicans appear to have a fascination with brightly painted retro Volkswagon Beetles. They can be seen everywhere, and make for fantastic photo opportunities! I saw many different patterns and colours, including leopard print and hot pink. 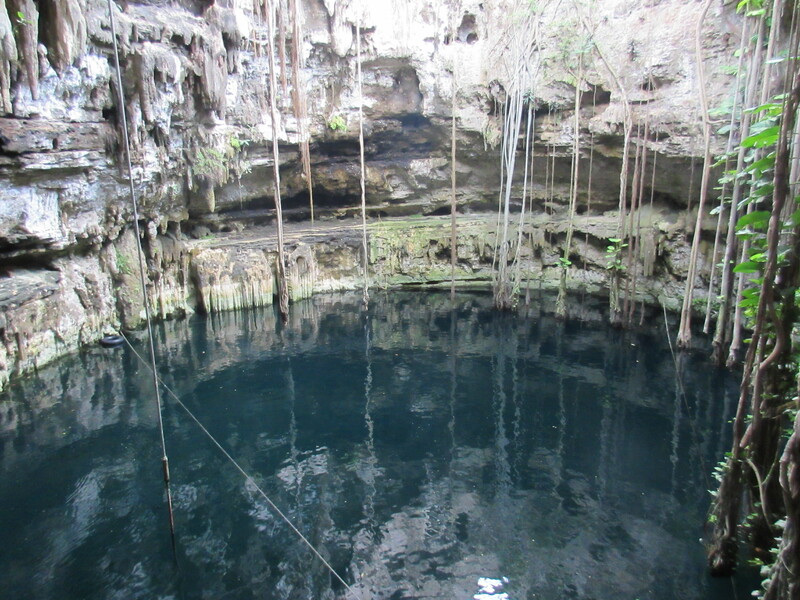 Cenotes are natural sinkholes in the ground filled with clear, fresh water. 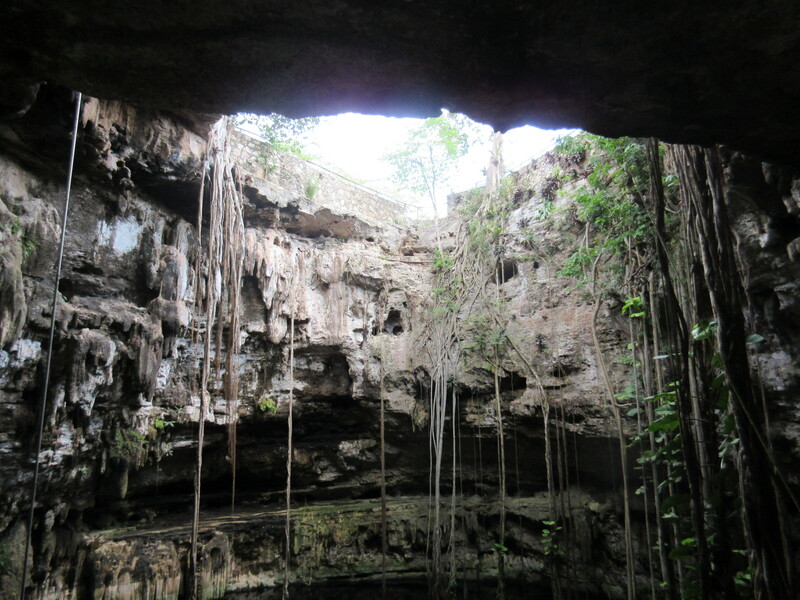 They are often connected to expansive underground river systems that run throughout the Yucatan. The porous rock has eroded over time and has caved in to form these beautiful natural wonders. You can swim, snorkel or dive in them. 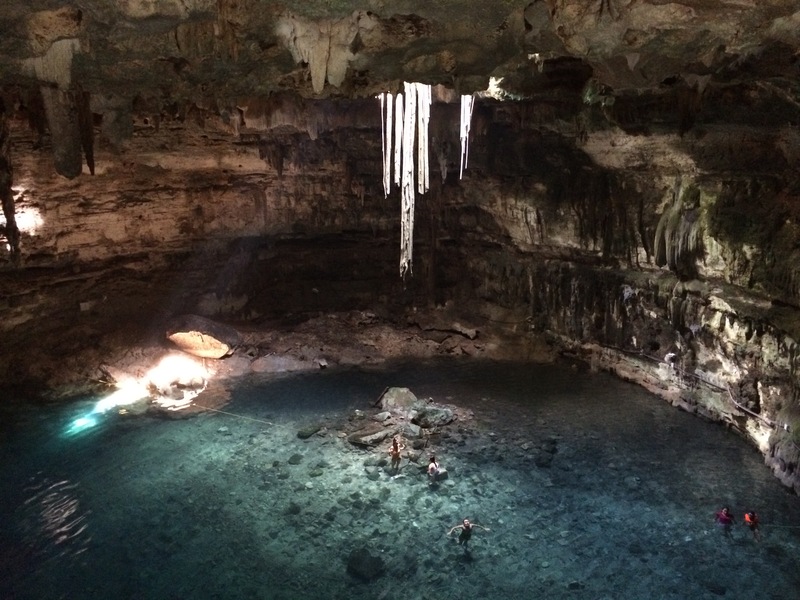 Cenotes are unique to the Yucatan and there are thousands of them all over the peninsula. 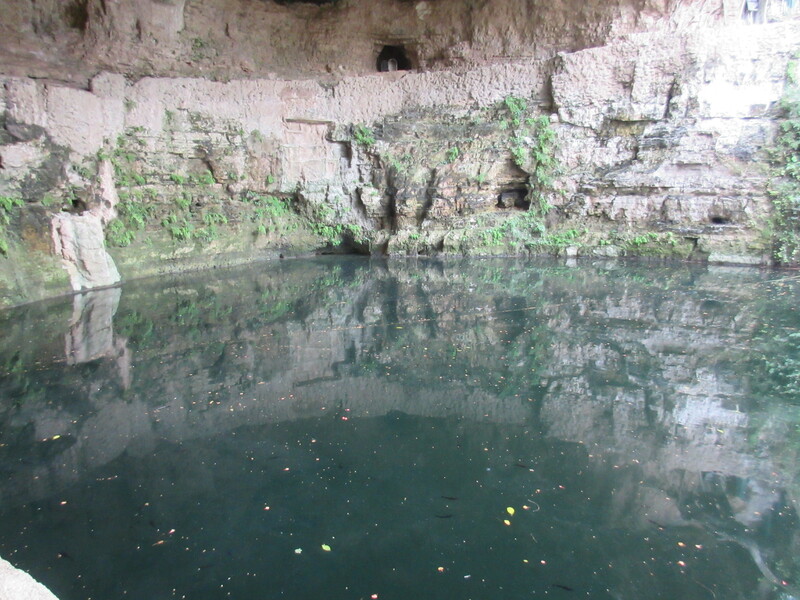 During my first solo trip to Mexico, I swam in eight different cenotes around Tulum and Valladolid. They are so refreshing (especially after climbing some Mayan ruins!) and the water is so clear. Little black catfish live in many of the cenotes and they will swim around you. 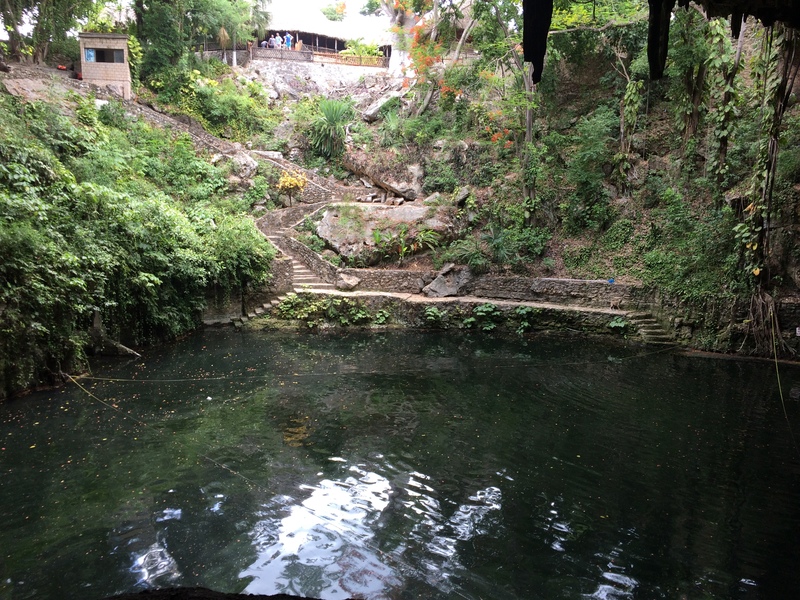 There were a few cenotes I visited that had A LOT of catfish, which freaked me out a little bit. I swear I felt one of them brush against my leg (but I can’t be sure), which is a strange fear of mine. Nevertheless, swimming in these natural wonders is absolutely amazing. 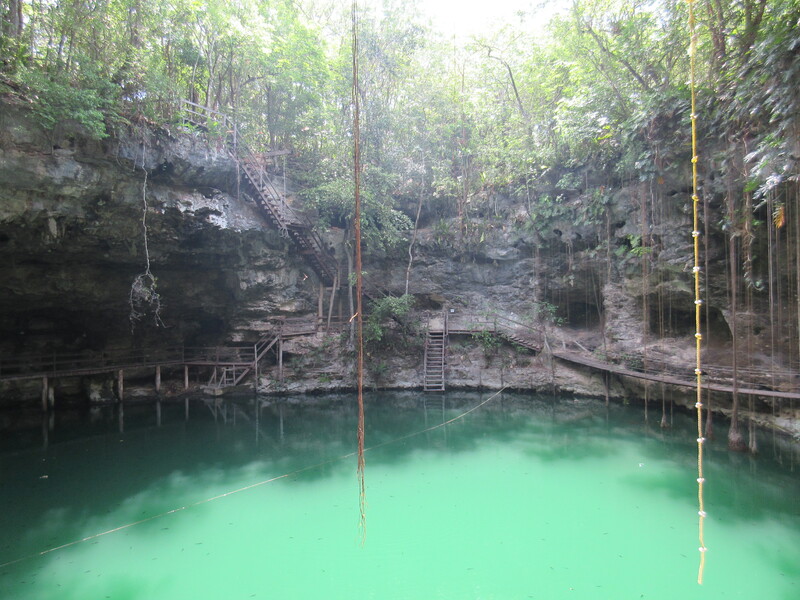 I really enjoyed visiting the lesser known and off the beaten path cenotes, like Cenote X’Canche near the Ek Balam Ruins and Cenote Oxman near Valladolid (You can read more about the cenotes I visited in Tulum here, and near Valladolid here), because I (along with some friends from my hostels) were often the only people there. Being pretty much alone in such a gorgeous place, was magical and I loved the peaceful and relaxing atmosphere, and being surrounded by unspoiled natural beauty. Getting to and from the cenotes is usually pretty straightforward and easy using local transportation (colectivos, taxis, bikes, etc.). 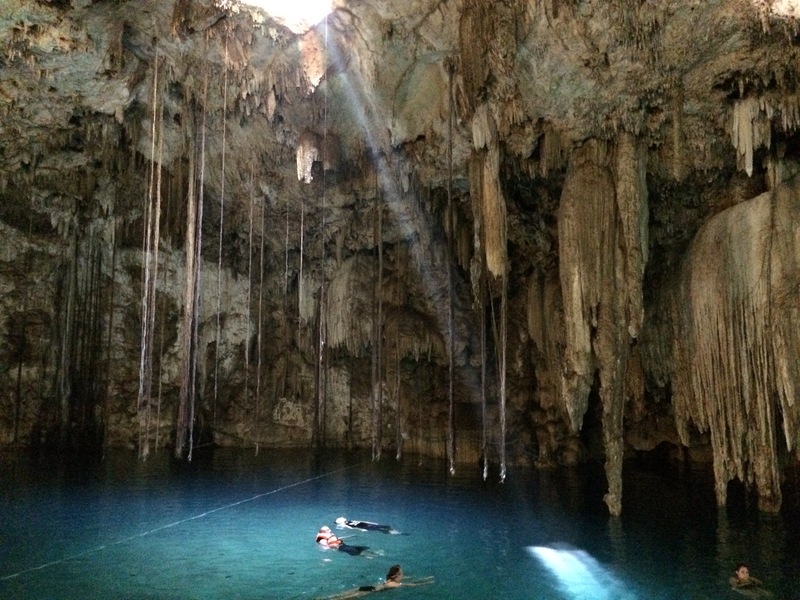 Swimming in the cenotes should be a must on your list of things to do in the Yucatan! They are all so unique and beautiful in their own ways, so I suggest visiting more than one to see the variety. 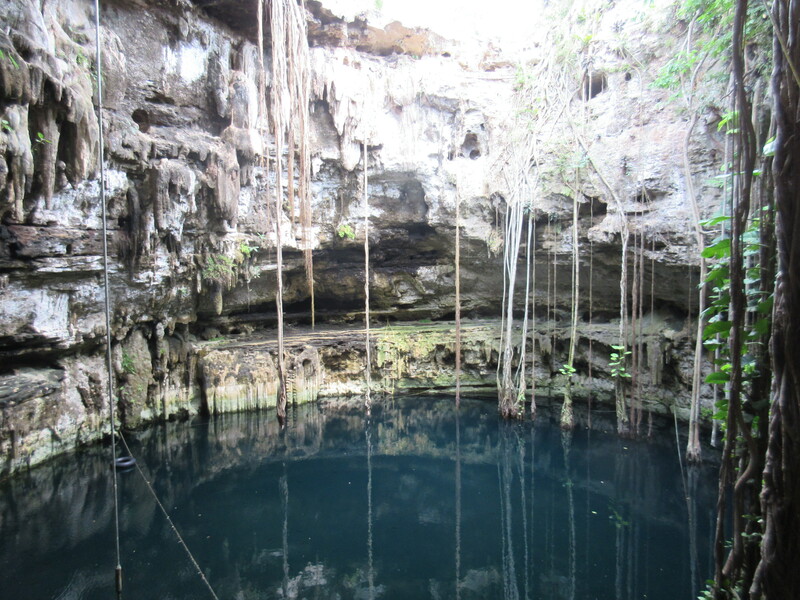 I highly recommend seeking out some lesser known cenotes, by asking your accommodation staff or any local for their recommendations. Guaranteed, they will know of a place that only the locals know about and visit. Those are the places where you can really get a feel for the culture, interact with locals and have unique and authentic experiences. 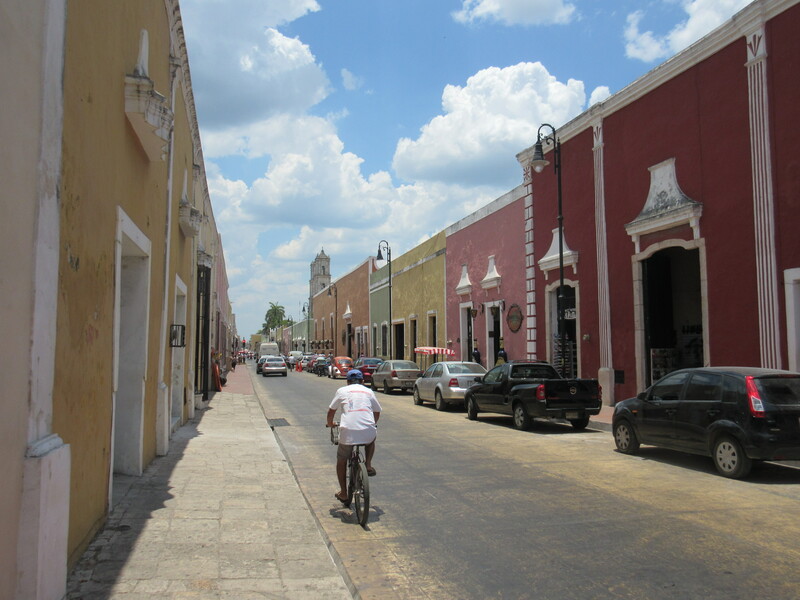 Valladolid is one of my favourite cities in the Yucatan. 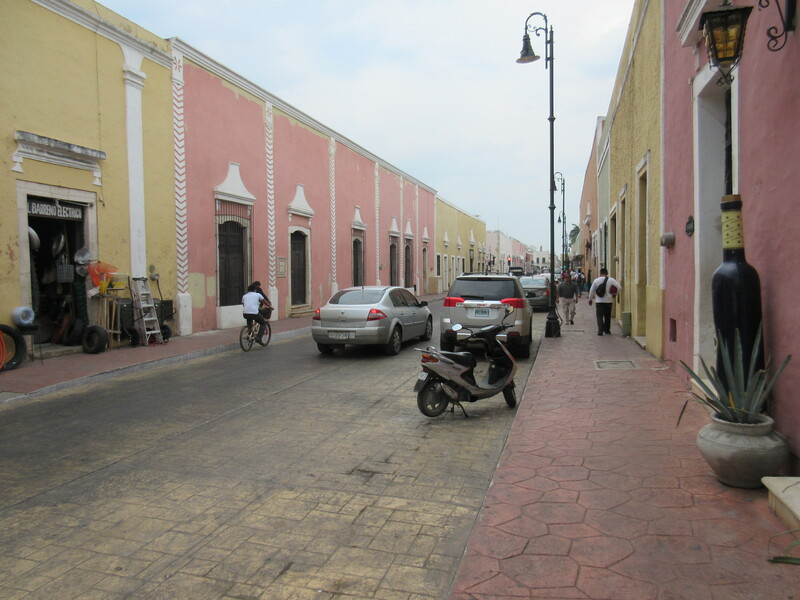 It is a charming colonial city in the centre of the Yucatan Peninsula, with a laid-back and slow pace atmosphere. The narrow cobblestone streets are lined with pastel coloured low-rise buildings, all with such unique architecture and character. I fell in love with Valladolid almost immediately after stepping off the bus. Most tourists only end up staying one or two nights in this city, in order to visit Chichen Itza and other nearby ruins and cenotes. But I believe that Valladolid is worth more than a two nights’ stay! 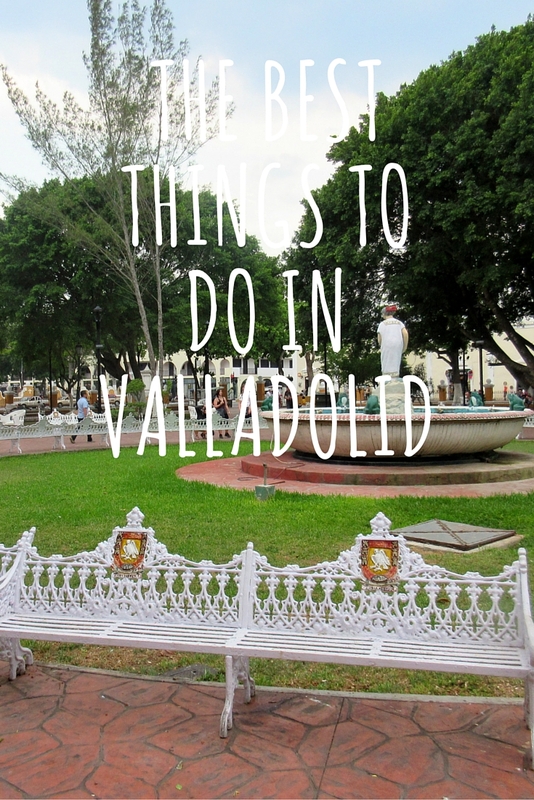 There is so many things to do and see (check out my complete guide to Valladolid). 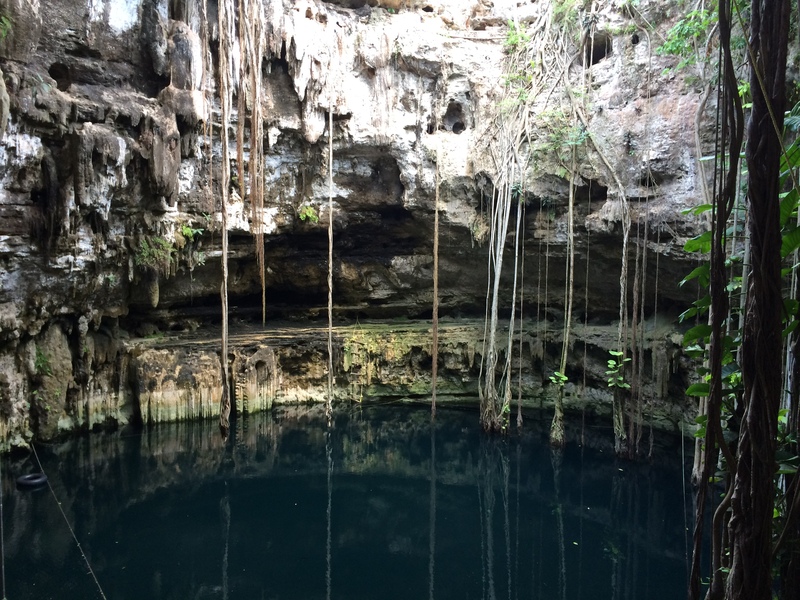 There is a cenote in the middle of the city, colonial churches, a massive ex-convent to explore, a beautiful central park, delicious places to eat and much more. I loved how prominent the Mayan culture was in Valladolid and it is a great place to immerse yourself in and learn more about the culture. Hardly anyone spoke English, and I enjoyed the challenge of practicing my Spanish and learning more of the language. 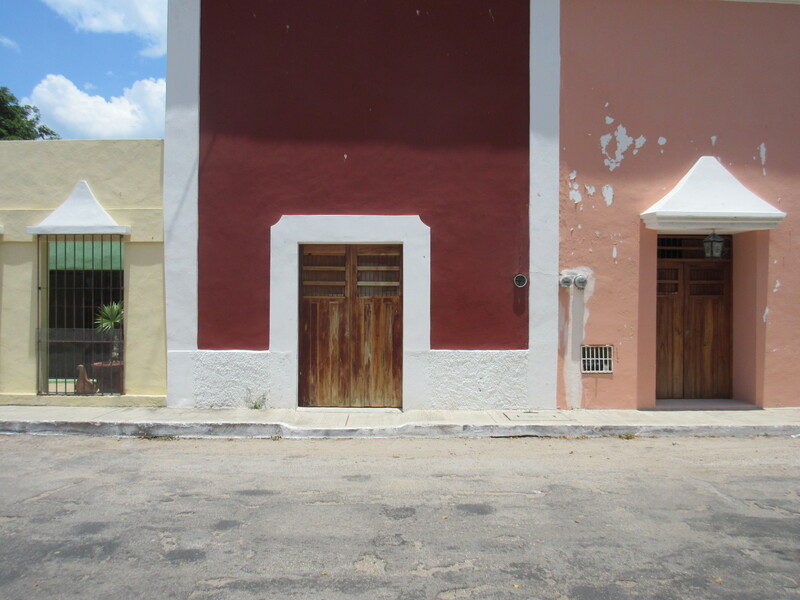 I walked everywhere in Valladolid, and especially enjoyed wandering through quiet residential neighbourhoods where I was the only tourist around. It was fascinating to be able to observe the local life around me. I also loved admiring the beautiful colourful and colonial architecture. 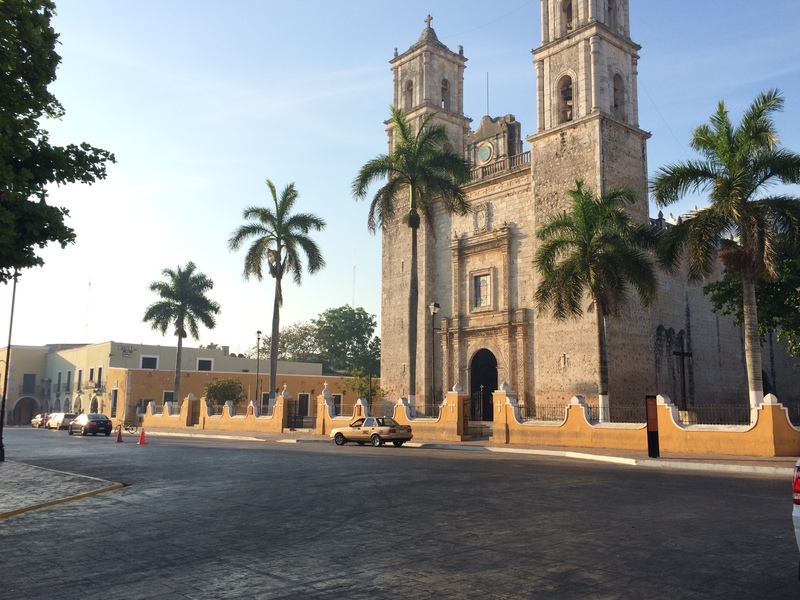 Valladolid is a fantastic city, that is definitely more authentic of Mexico and further off the beaten path than Tulum and Playa del Carmen, which I loved. You will get a real feel for the culture here and have some pretty unique experiences. When you inform people of your upcoming travel plans to Mexico, most people will assume that you are going there for the resorts and beaches. This is what I went to Mexico for during my first three visits. I have visited the beaches at Playa del Carmen and Tulum and they are absolutely gorgeous, and the water is a beautiful turquoise colour. I am not a huge fan of beaches (I don’t enjoy the feel of sand or how it gets in everything), so beaches are no longer the primary reason why I visit Mexico. But if you love beaches, this is definitely a great place to find them! Mexico is well-known for its many ancient Mayan ruins. There are so many of them in the Yucatan! Learning history behind these ruins and of the ancient Mayan civilization fascinate me, and the ruins are a huge reason why I love and continue to return to Mexico. 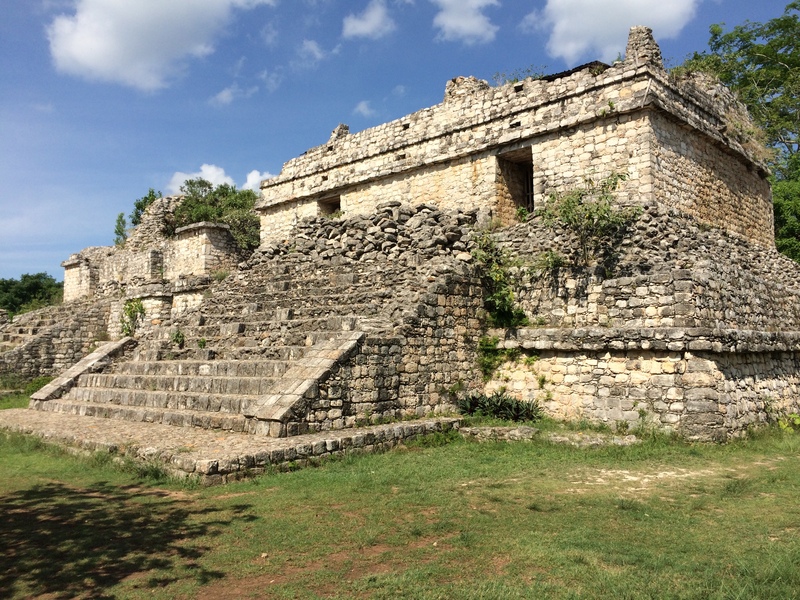 My favourite ruins that I visited during my first solo trip was Ek Balam, which is a site located about twenty minutes north of Valladolid. The ruins were lesser known and were surrounded by dense unspoiled jungle. Very little had been done to modernize the site (aside from the entrance area and washrooms) and you were free to explore and climb all of the structures. I loved how “undiscovered” these ruins felt and it was definitely an off the beaten path experience! 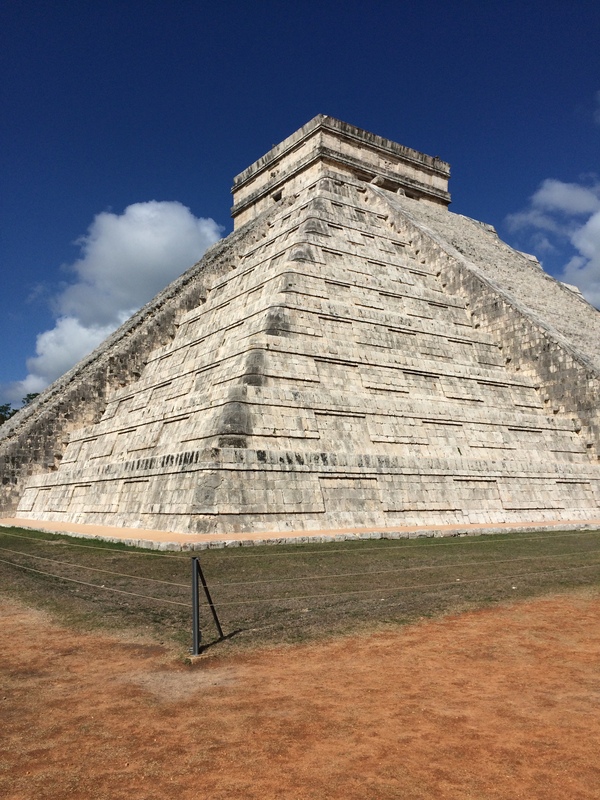 I have also visited the ruins of Chichen Itza, Tulum, and Coba, which are all unique and amazing as well. Mexico has an amazing public transportation system; definitely better than Canada’s! The ADO first and second class buses are convenient, safe, comfortable and reliable. The local colectivos (shared shuttle vans) are fast and air-conditioned and do not operate on a fixed schedule, so it is easy to catch one whenever you need. Tulum is a small village located on the coast of the Gulf of Mexico, along the Mayan Riviera. It has a relaxed and laid-back atmosphere, and the locals are welcoming and friendly. 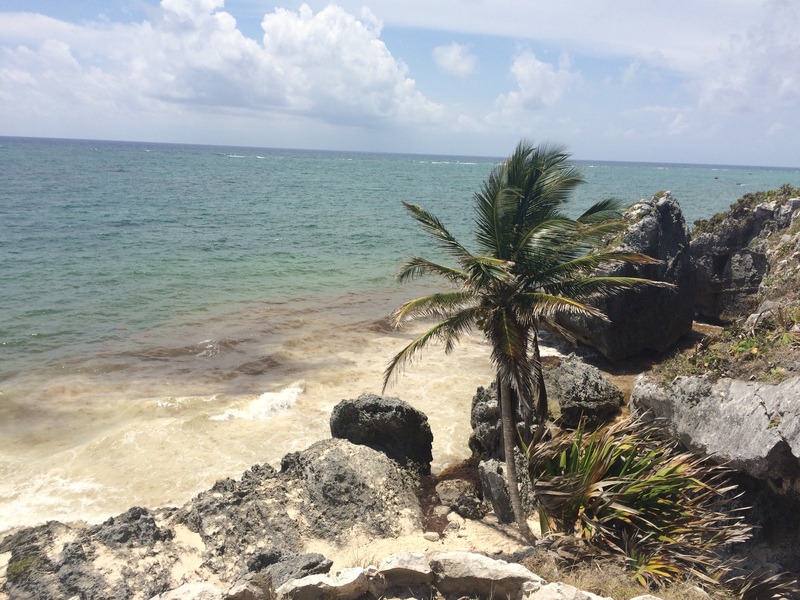 There is so much to do in and around Tulum! You can visit the Tulum Ruins, wander the residential streets finding colourful street murals along the way, visit the ruins of Coba, swim at the beach, check out some of the many wonderful produce markets, and eat lots of delicious authentic Mexican food! Here is my detailed guide to Tulum, with everything else you need to know. 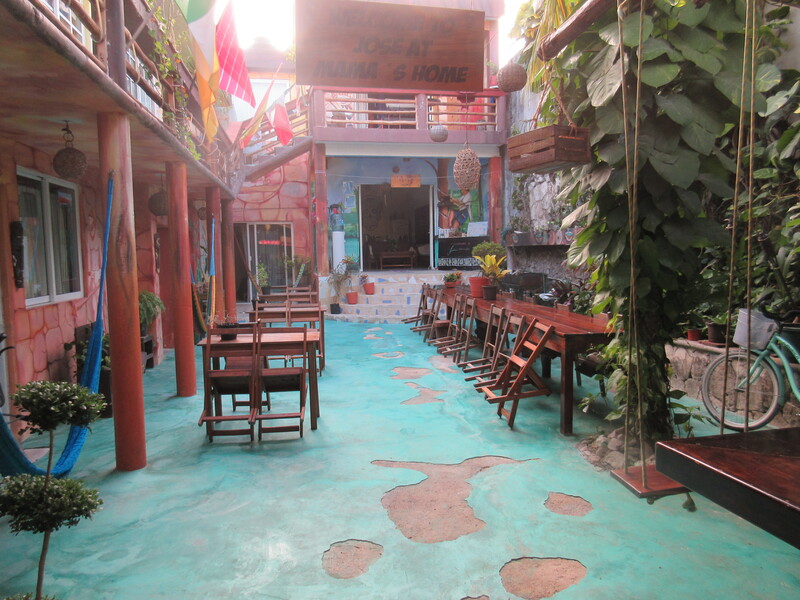 Mexico has so many amazing hostels! I stayed in hostels for the first time in Mexico during my solo trip. Of the three hostels I stayed at, they were all so unique and I had such positive experiences. I loved the colourful decor at the hostels, the extremely friendly and helpful staff and how easy it was to meet new people and travel friends. 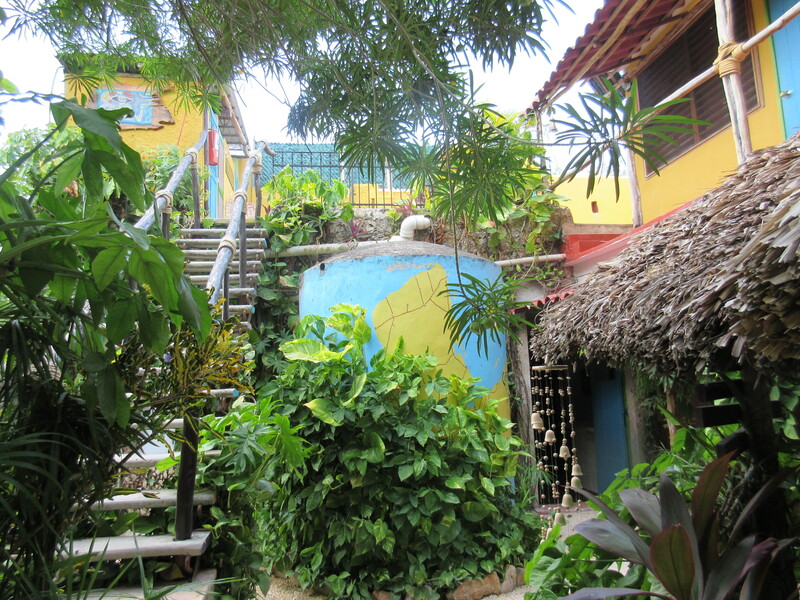 My favourite hostels were Mama’s Home in Tulum and Hostel La Candelaria in Valladolid. Mama’s Home had a beautiful outdoor courtyard in the centre of the hostel, with colourful paintings on the walls surrounding it, a large palm tree in the centre and hammocks to relax in along the edges. 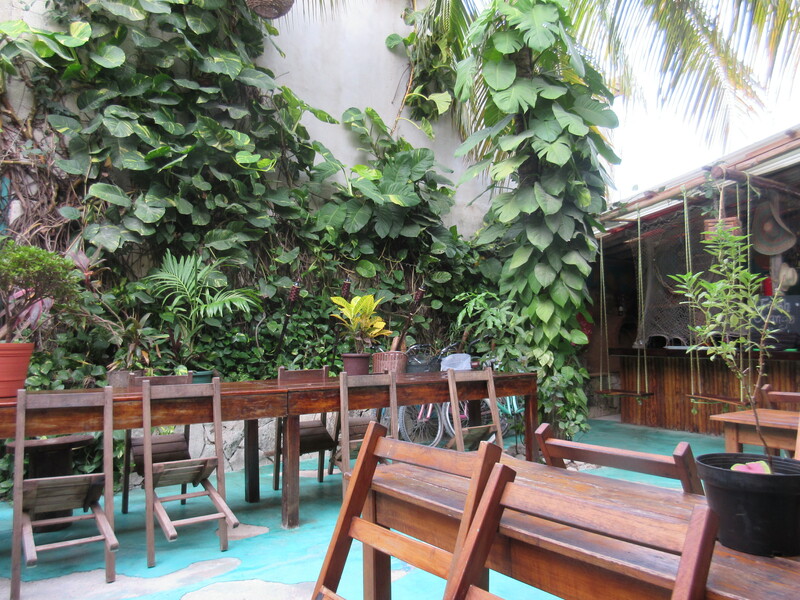 Hostel La Candelaria was located in a colonial building and featured a rooftop patio, a beautiful treed garden with hammocks behind the building, and even an outdoor kitchen! Mexico’s history is fascinating. 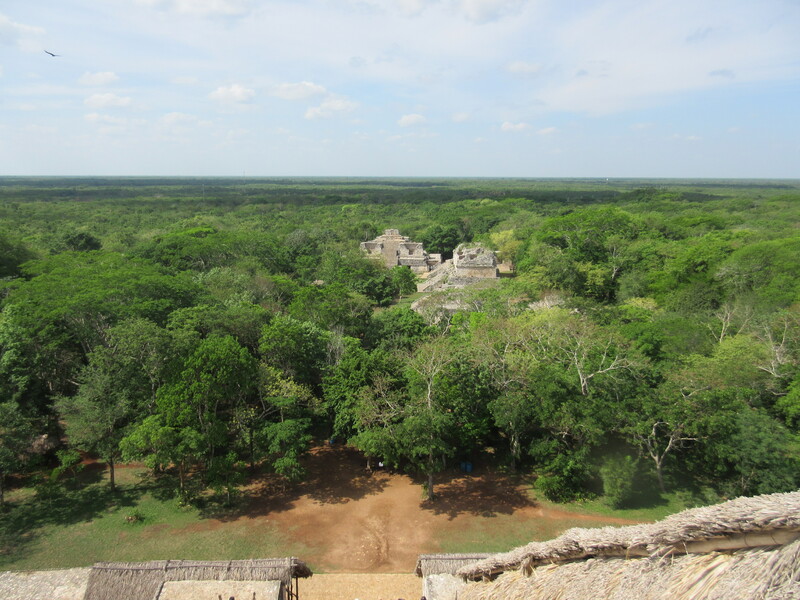 If you are interested in the Mayan civilization, there is so much history you can learn about the ancient ruins, the cenotes and the towns and cities. I recommend reading about the history of the places you plan to visit before you get there, so you have some background knowledge. 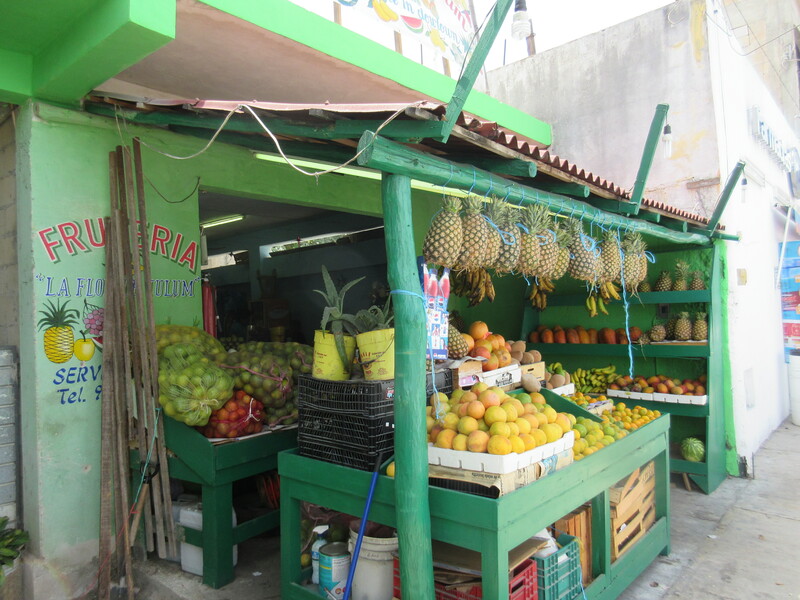 Something I loved about Mexico, was the lack of big department chain stores (in small towns and cities, like Tulum and Valladolid) and the abundance of small specialty shops that were locally-owned. Every shop has its own specialty. 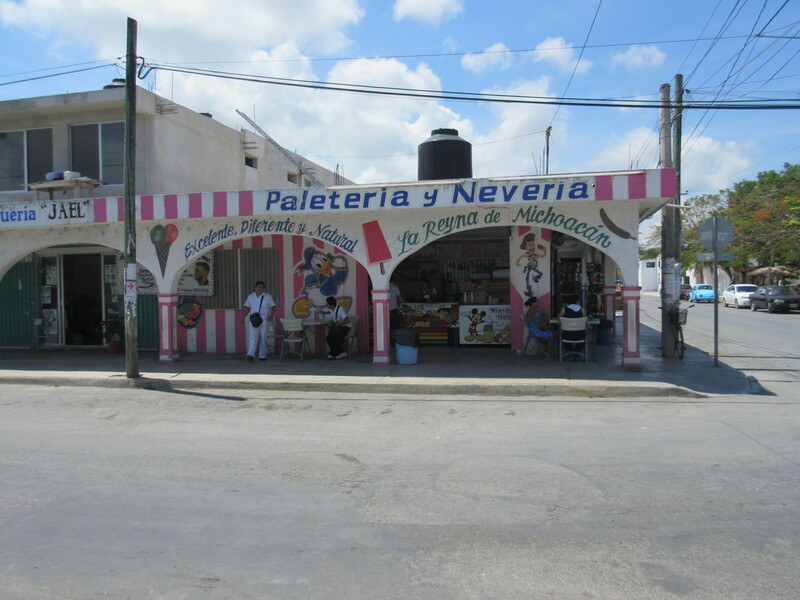 There is the “papeleria” which sells stationary and paper; the “tortilleria” sells fresh tortillas; the “floreria” sells flowers; the “paleteria y neveria” sells popsicles and ice cream. There are so many more that I could list as well. I love supporting local businesses and individuals, both at home and when I am traveling, and I loved how easy it was to do that in Mexico. When you hear people talk about traveling to Mexico, you might assume that it is an expensive luxury destination. While there are definitely some pricier areas and types of accommodation in Mexico, like boutique hotels and all-inclusive resorts along the Mayan Riviera, traveling in Mexico doesn’t have to be expensive. If you are traveling on a budget and independently, you can travel for very cheap, especially if you are willing to stay in hostels, eat cheap and authentic local food and use public transportation. The total cost of my 12 day solo trip to Mexico was significantly less than when I stayed at an all-inclusive resort for 7 days. You can read a more detailed report about what exactly I spent in Mexico during my solo trip here. On average, I spent around $50 CAD per day, but I could have spent even less. It is also worth noting that the slower you travel and the longer you stay in one place, the cheaper your travel is going to be. This is because you won’t be trying to cram a bunch of activities and sightseeing into a short period of time, but will be able to space things out. Mexico may not be as bargain cheap as South East Asia or Central America, but it is affordable. If you travel in the off-season, you’ll find even better value for your money outside the November-March season. May is a great month to travel to Mexico because it is between high season and rainy season. For budget travelers, you can get by on very little. The food is cheap as well as the local transportation. I love everything about the Spanish language. It sounds gorgeous and it has a nice flow to it. The grammar rules make more sense to me than those in English and I like that everything is pronounced how it is spelled. Spanish is the primary language spoken in Mexico and aside from the touristy cities and attractions, it becomes increasingly difficult to find English speakers. Even in Tulum, which is pretty touristy, the minute you step off the main highway with all of the souvenir shops, there were not many people who spoke English! Thus, it is essential that you know the basics of the language and a few key phrases, so you are able to express yourself with words instead of relying on body language, charades and other non-verbal forms of communication. I enjoyed the challenge of having to practice my Spanish skills! 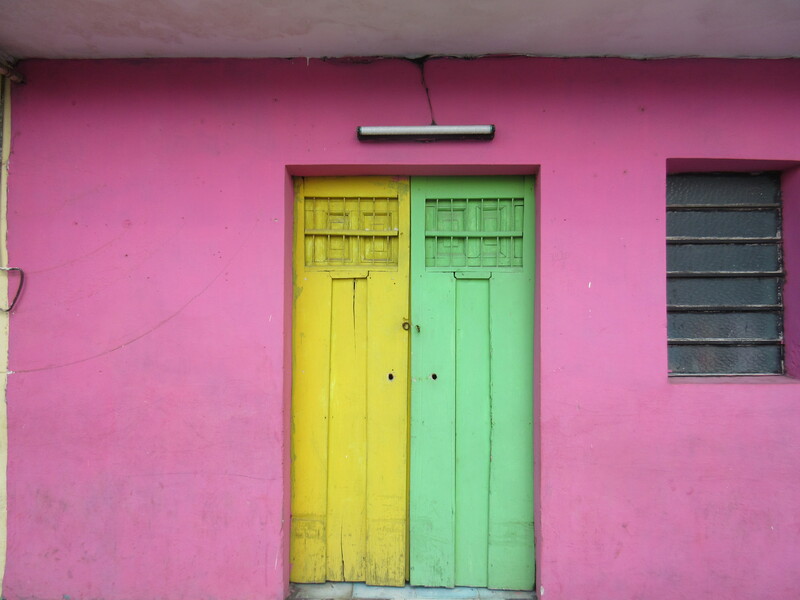 Everything is so colourful and vivid in Mexico! The houses, traditional clothing, the food and the colonial buildings. 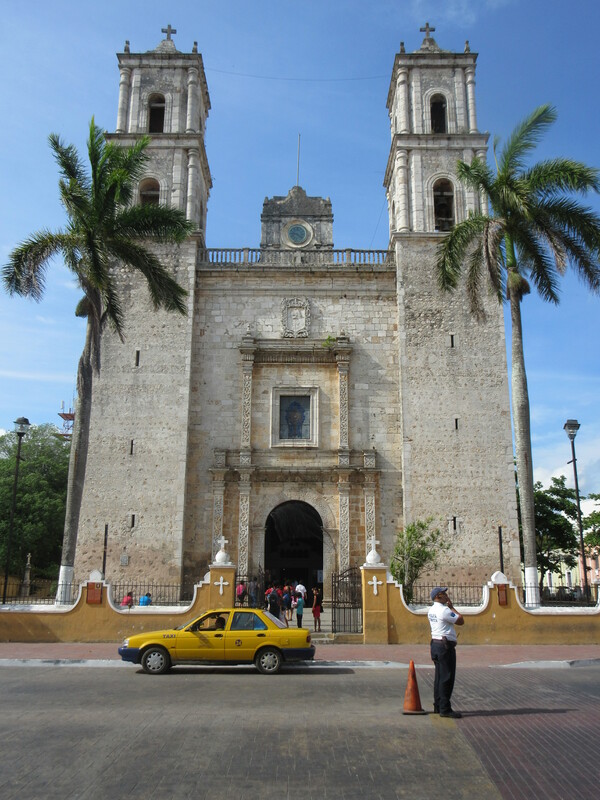 There are so many cathedrals and churches in Mexico. 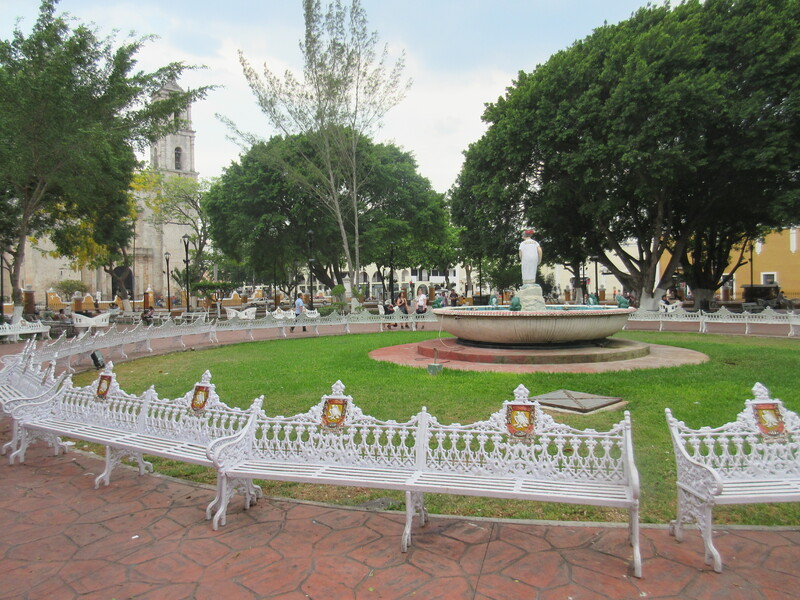 The large cathedrals are often located on the main squares and parks in the city/town/village. They are all so unique, grand and beautiful with such detailed architecture. It was fascinating to wander around inside some of them and admire everything. 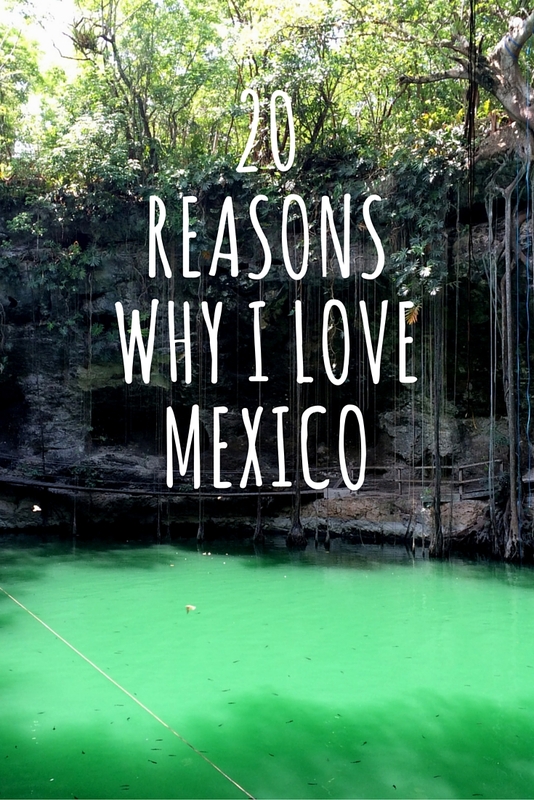 I hope that through this post, you can appreciate all of the amazing attractions, activities and gorgeous natural beauty that the country of Mexico has to offer! No matter what kind of traveler you are – off the beaten path, independent, luxury, budget, family, solo female, adventure – there is something for everyone in Mexico. It is definitely a country worth exploring! Have you been to Mexico? What do you love about this country?